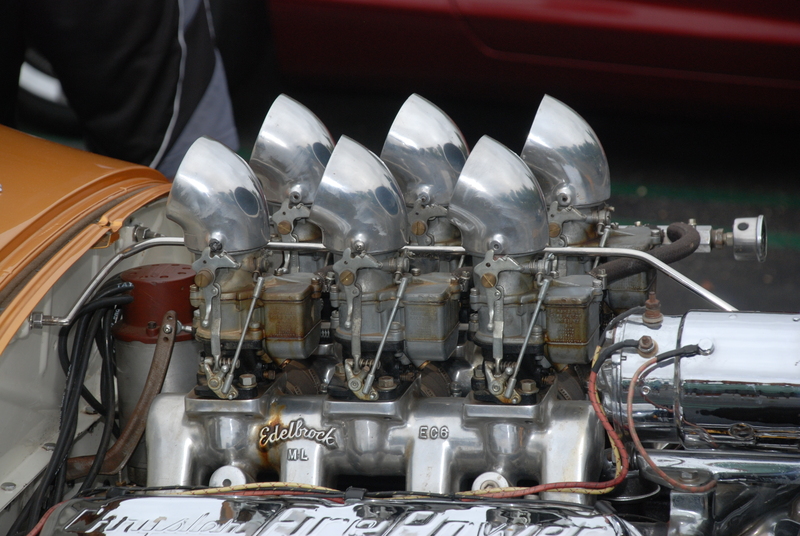 Webster’s Dictionary defines the word eclectic as “selecting what appears to be the best in various doctrines, methods or styles”: “composed of elements drawn from various sources”. 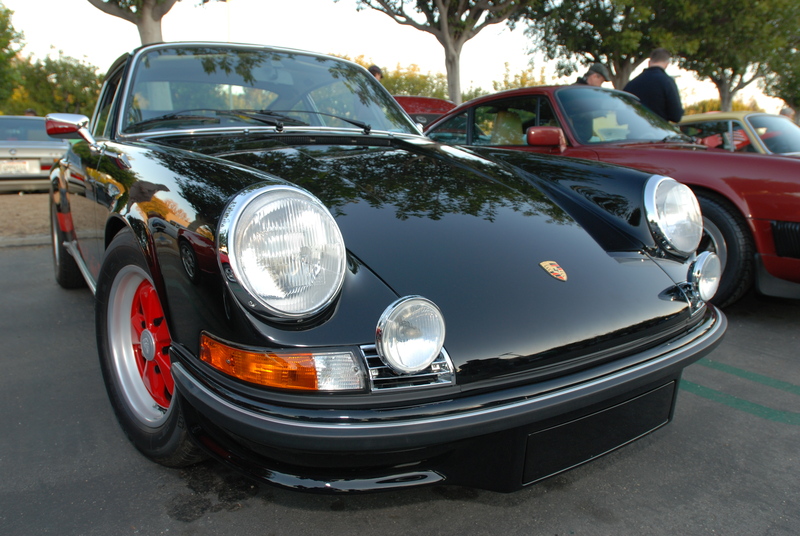 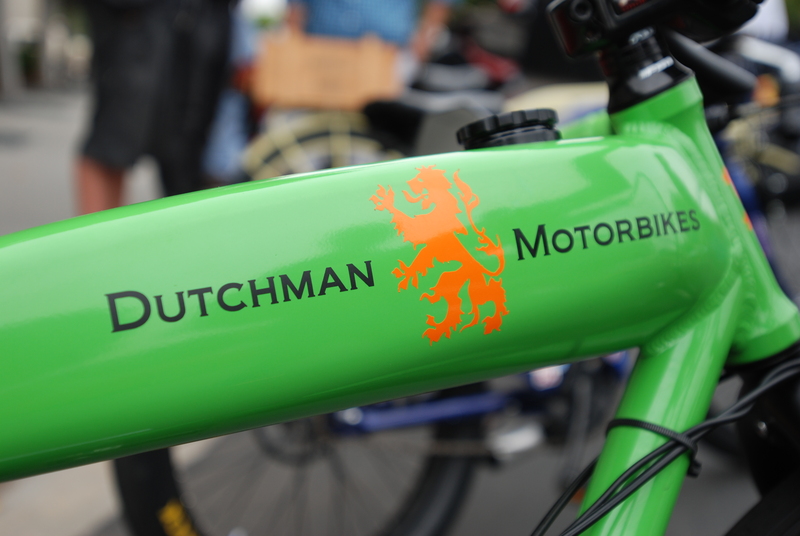 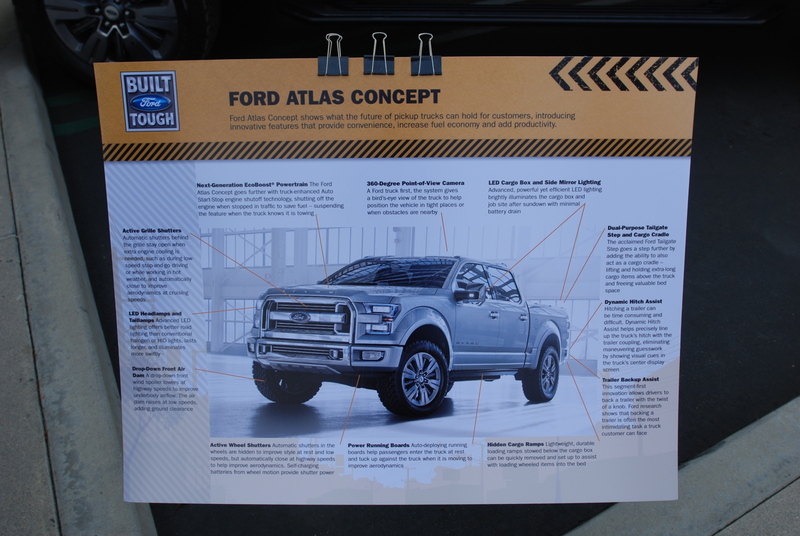 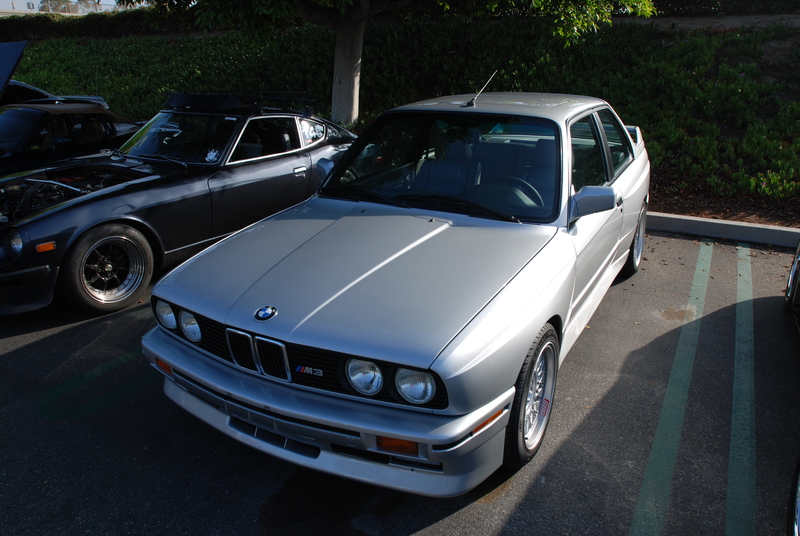 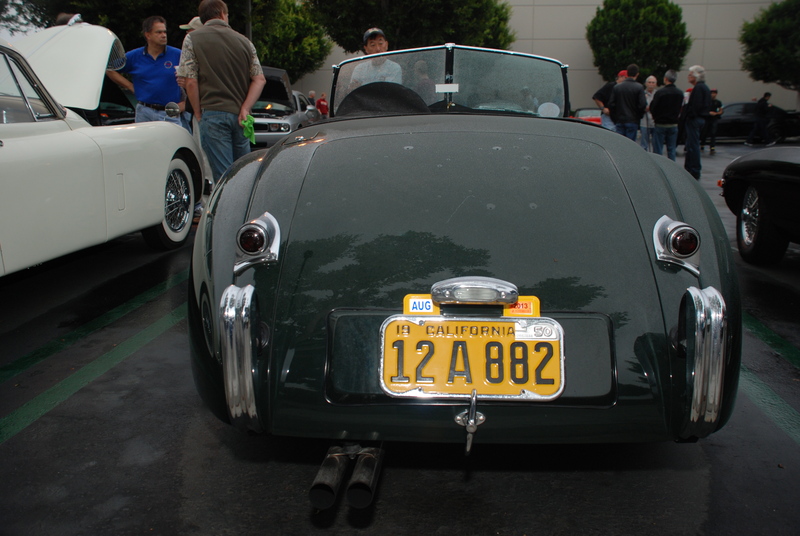 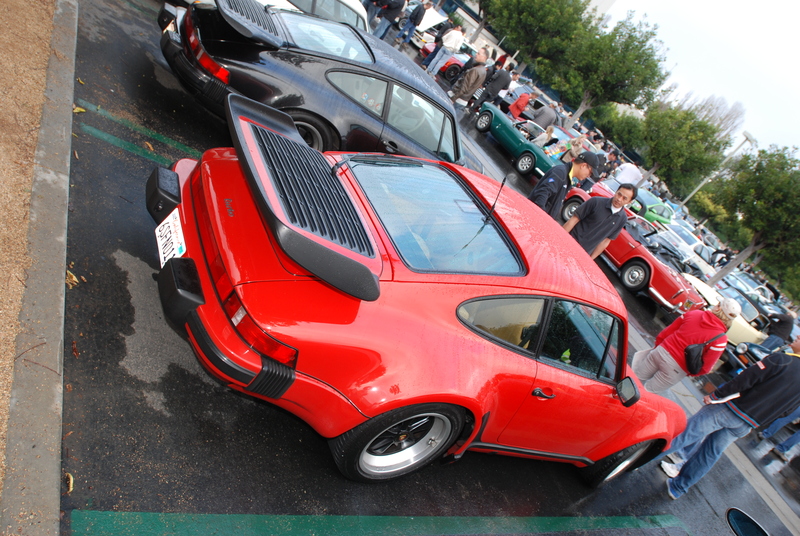 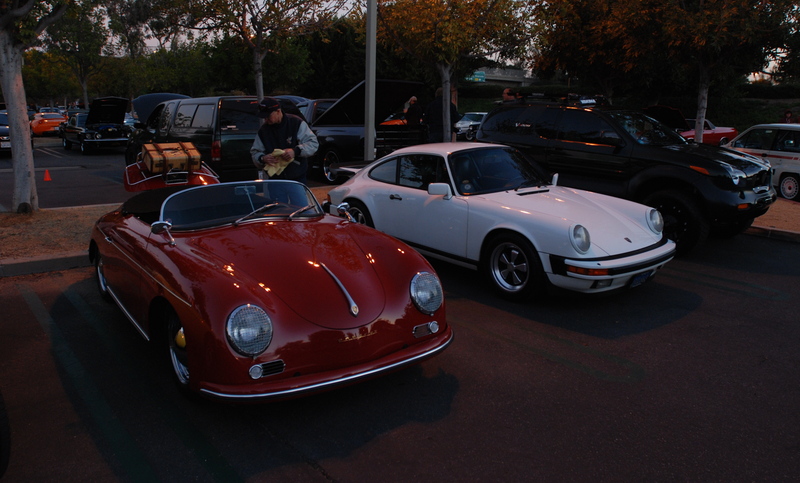 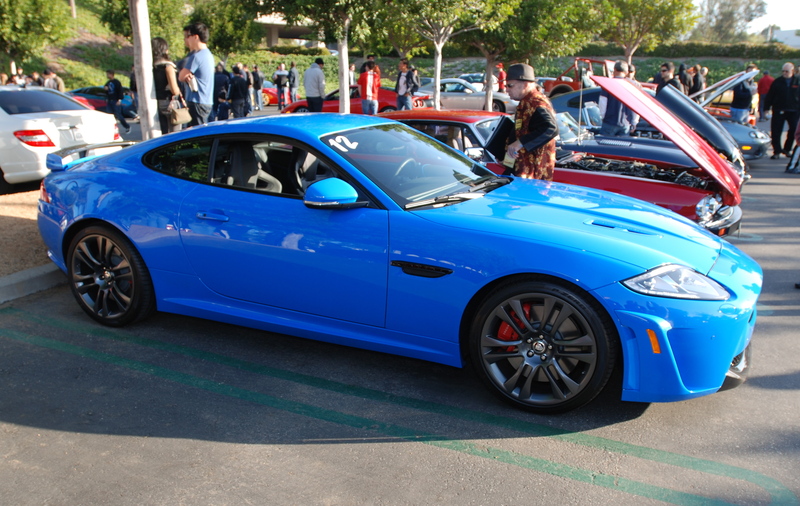 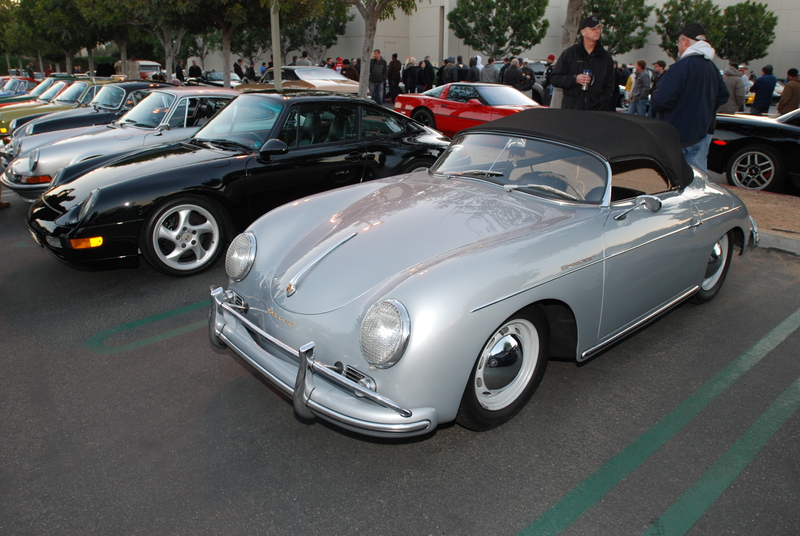 Both of these definitions were equally appropriate in describing the vehicles that turned out for the Saturday April 27th gathering of Cars & Coffee / Irvine. 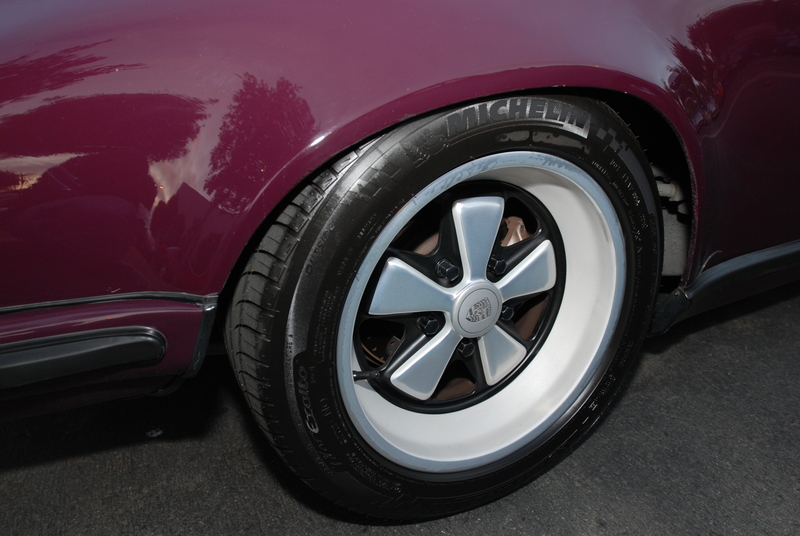 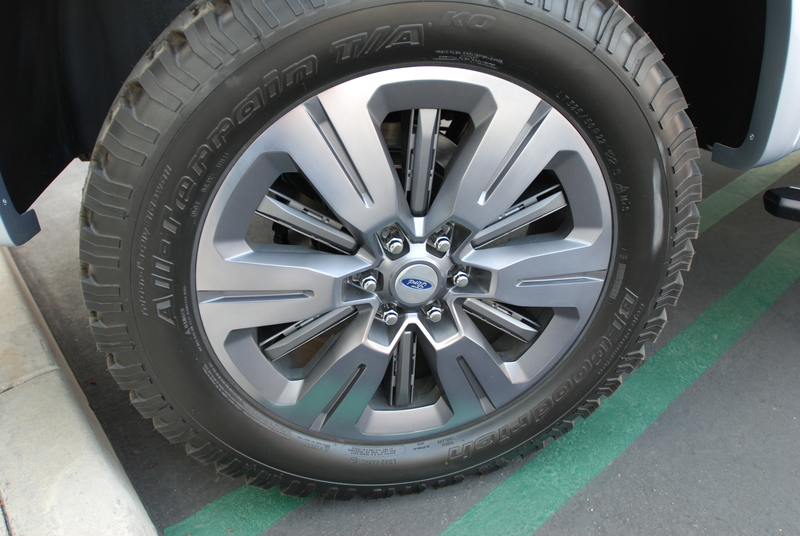 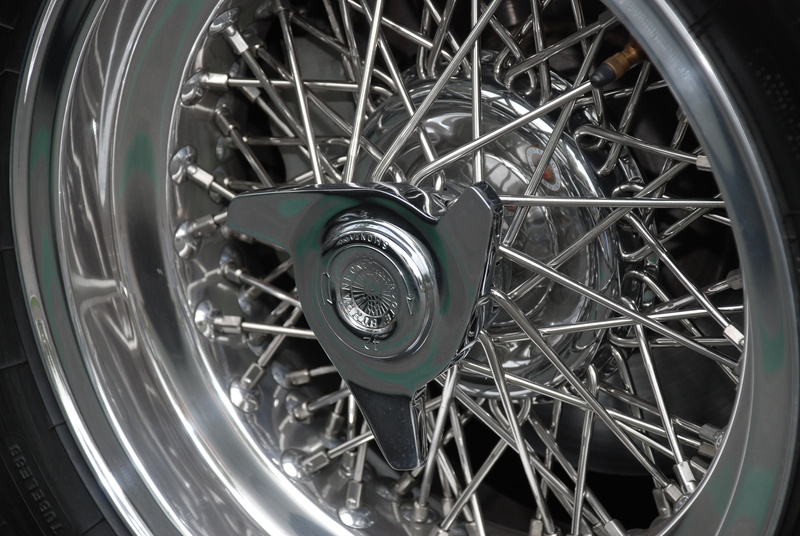 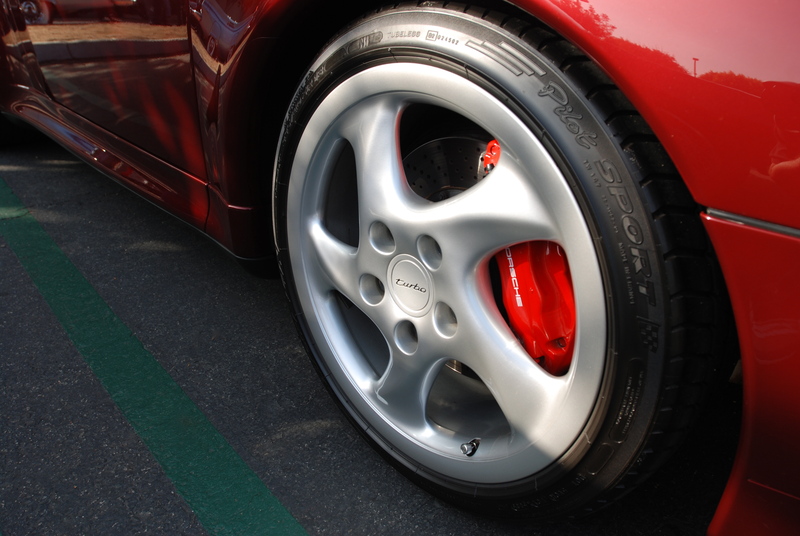 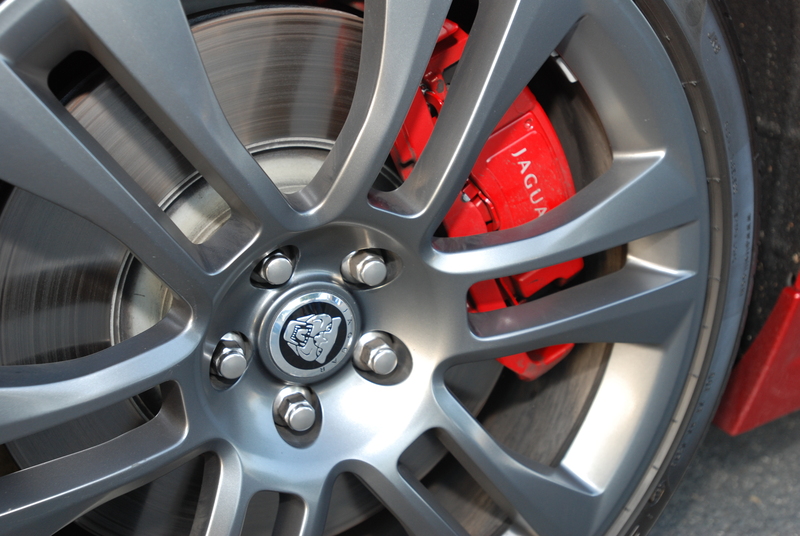 Wheel shutters in their open position, as seen on the passenger side wheels (below). 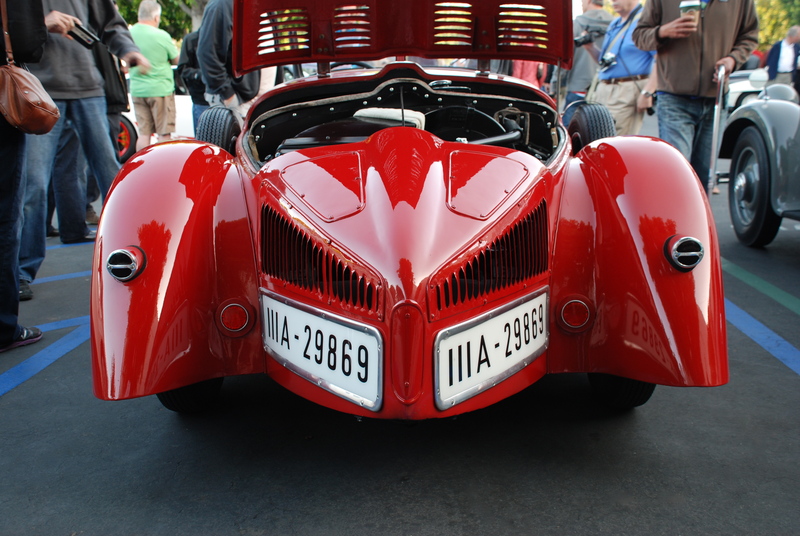 I overheard (while shooting the red model below), that this particular vehicle is a one of one; the only example of this vintage beauty in existence. 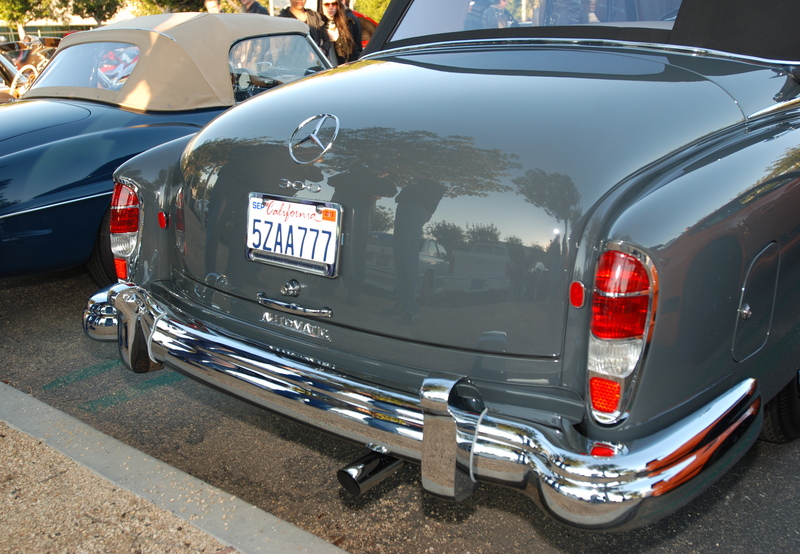 Parked just to the right of these two Mercedes, was one very cool and beautifully restored two toned DKW (Auto Union) Schnellaster panel van (aka DKW F89 L), produced from 1949 to 1962 as seen below. 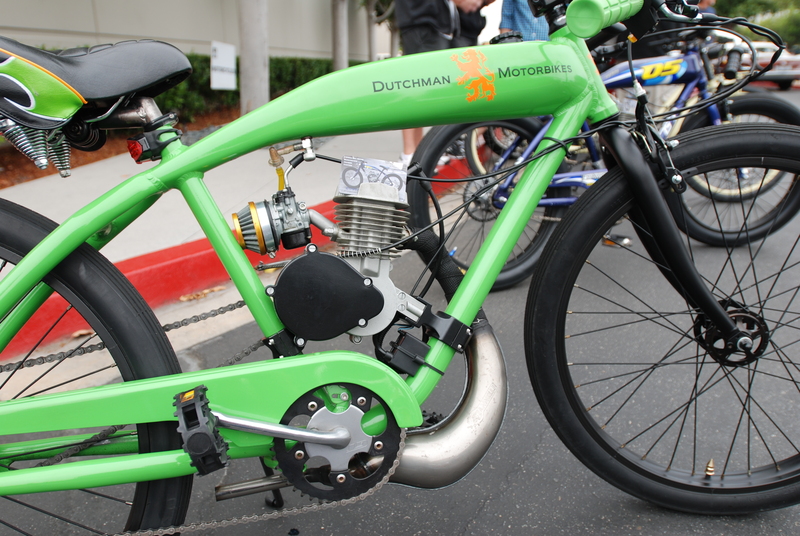 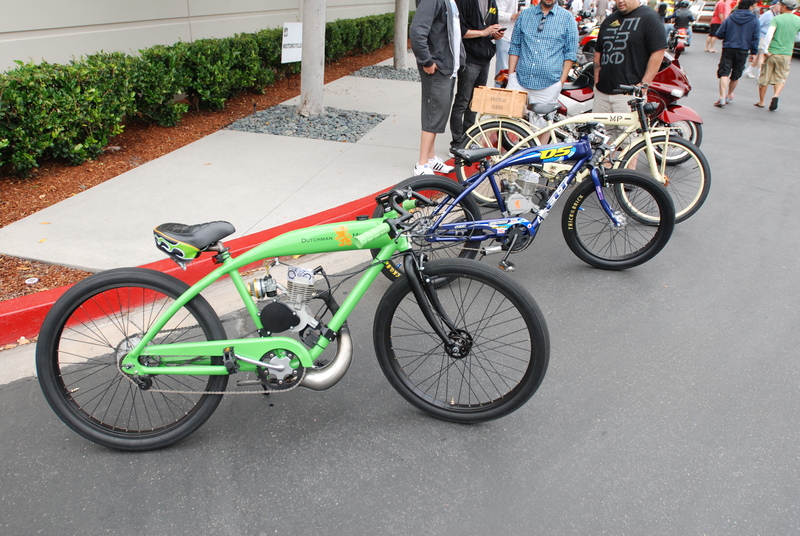 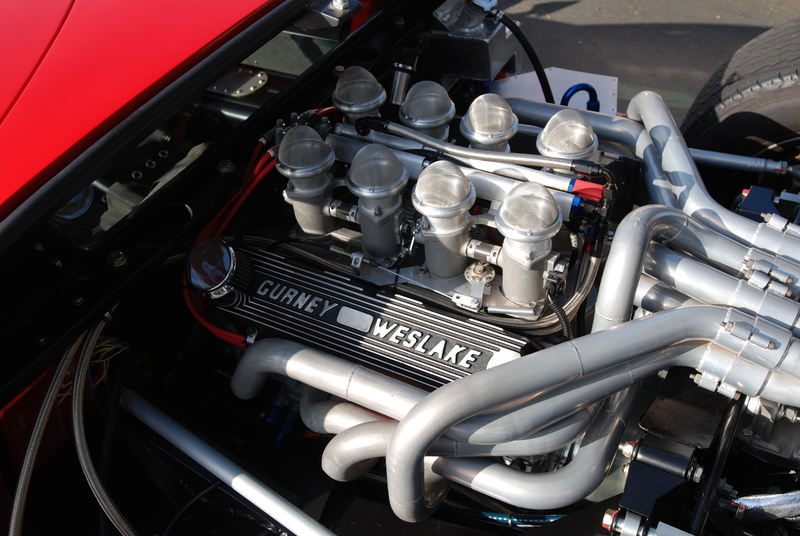 These vehicles were initially powered by a 700 cc, two-cylinder, two-stroke motor. 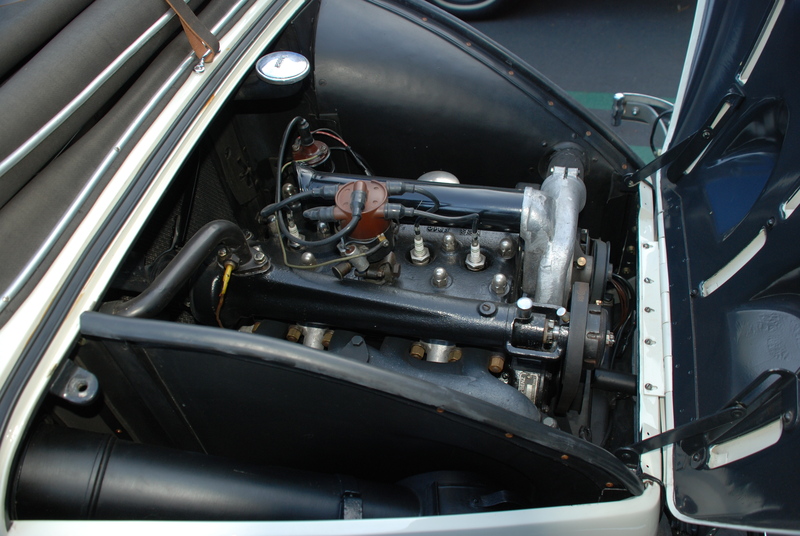 Then in 1955, the Schnellaster received an upgrade to three cylinders, increasing the displacement up to 900 cc, good for 32 horsepower! 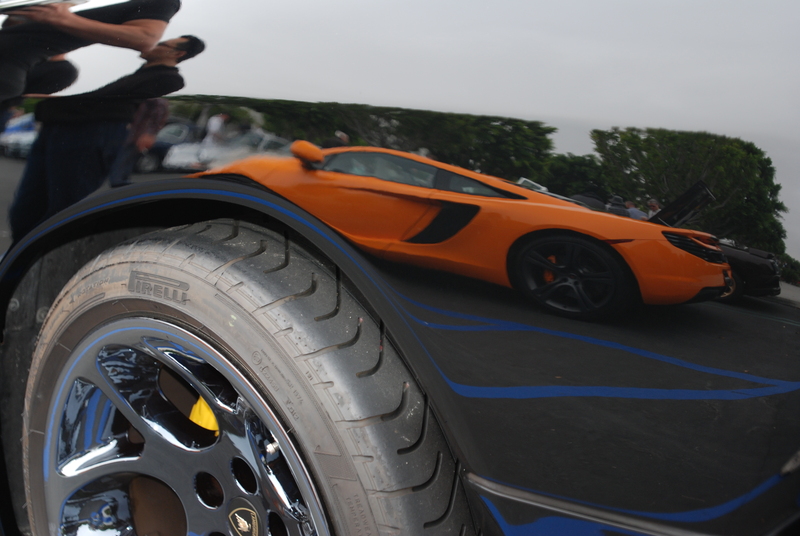 Who copied who? 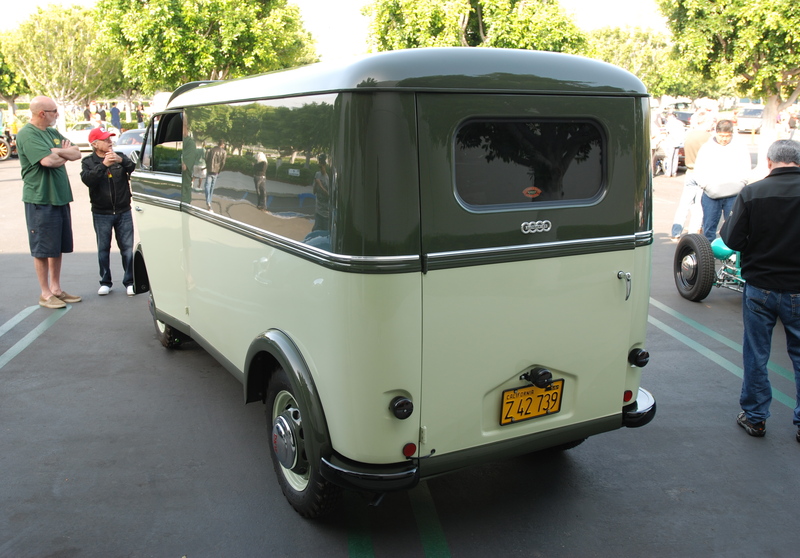 This two toned color palette appeared very similar to color schemes observed on several early 1950’s Volkswagen Type II transporters. 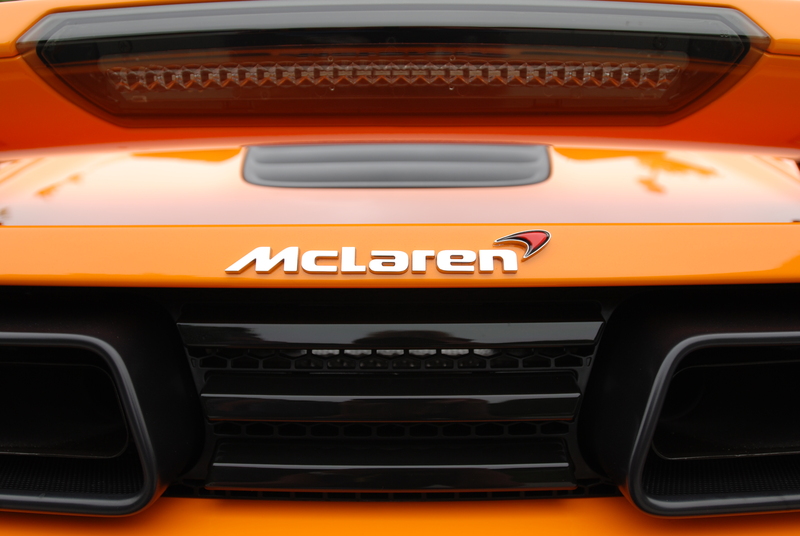 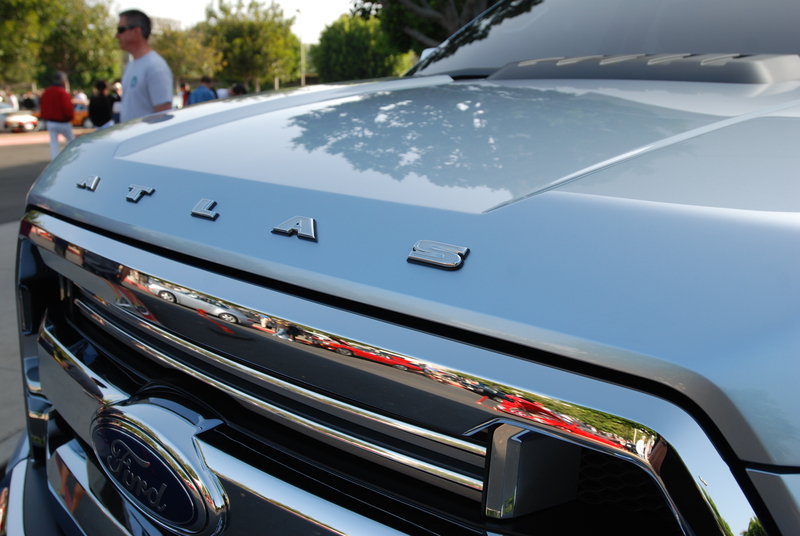 with an equally impressive turbocharged motor lurking under the hood, ready to shame any unsuspecting rival. 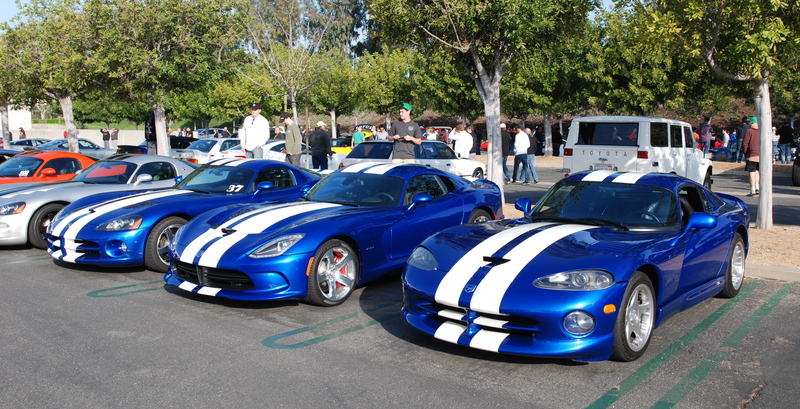 And just two rows over was a collection of Dodge Vipers, three in the blue with white stripe combination. 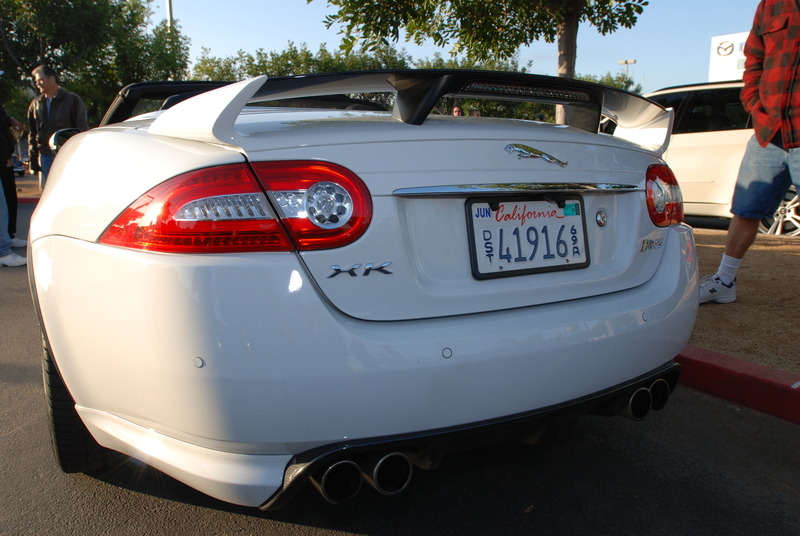 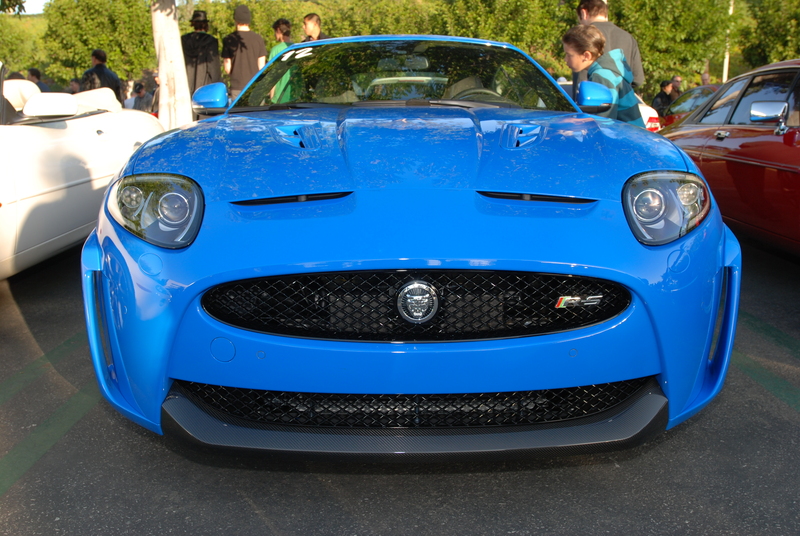 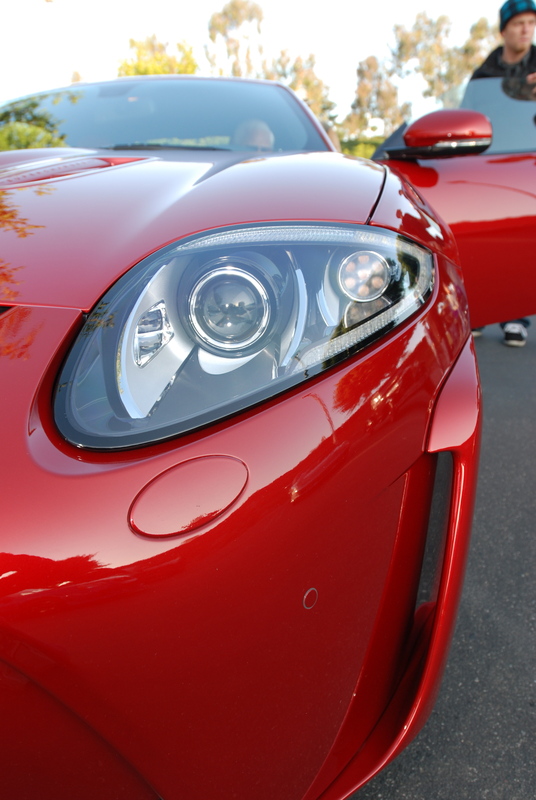 A closer look revealed the center blue viper as one of the brand new 2013 SRT models. 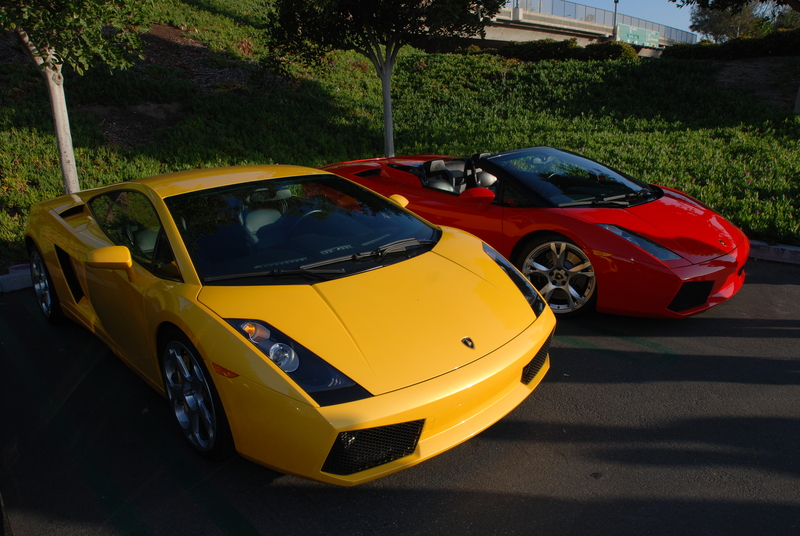 Representing the Italian manufacturers was a line up of jellybean colored Lamborghini, parked together out on the very back row. 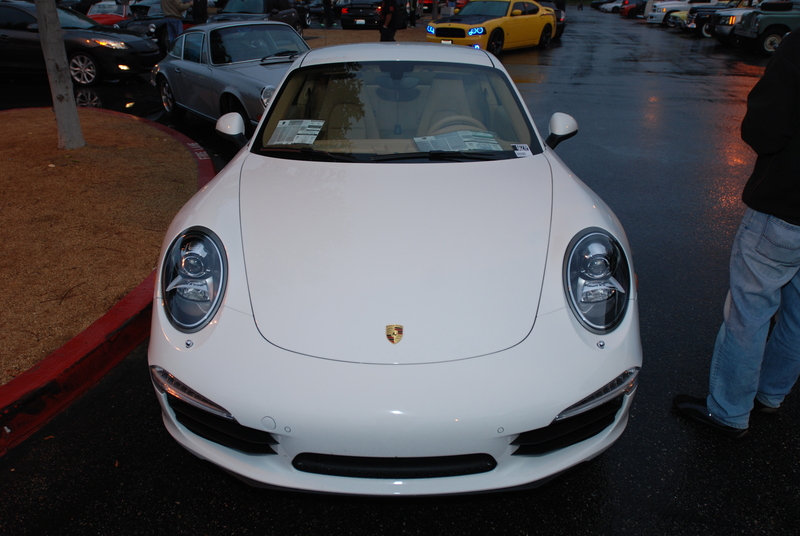 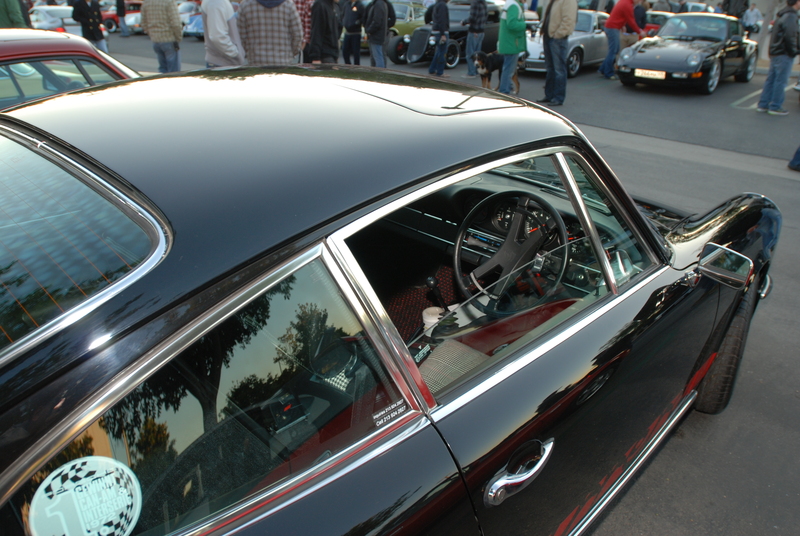 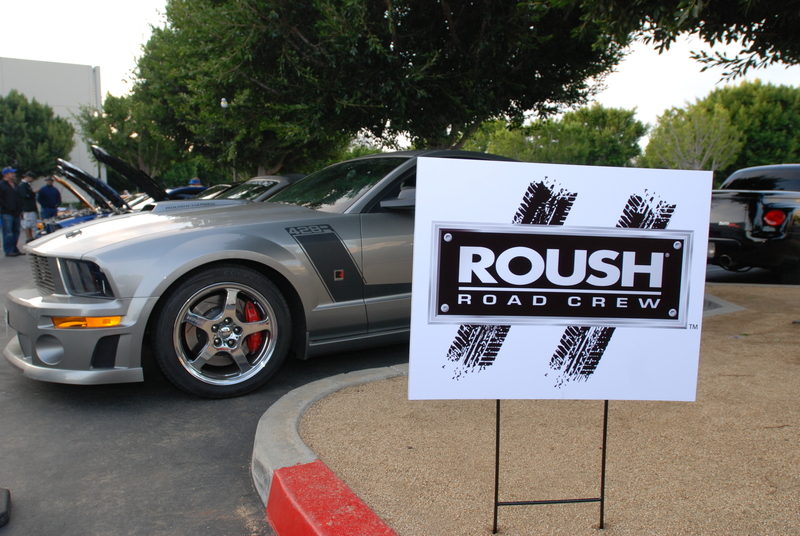 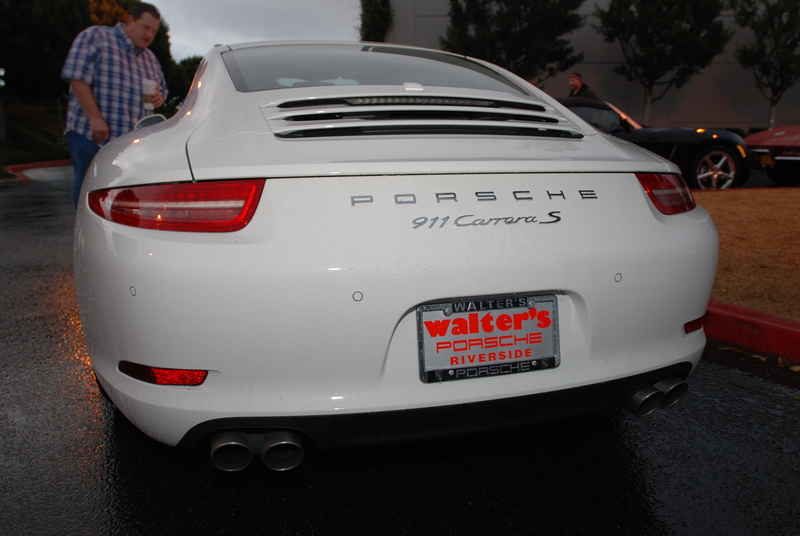 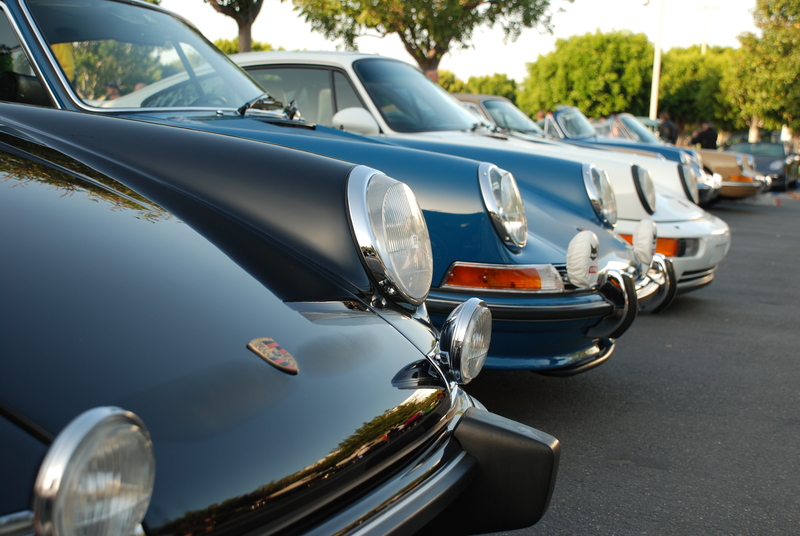 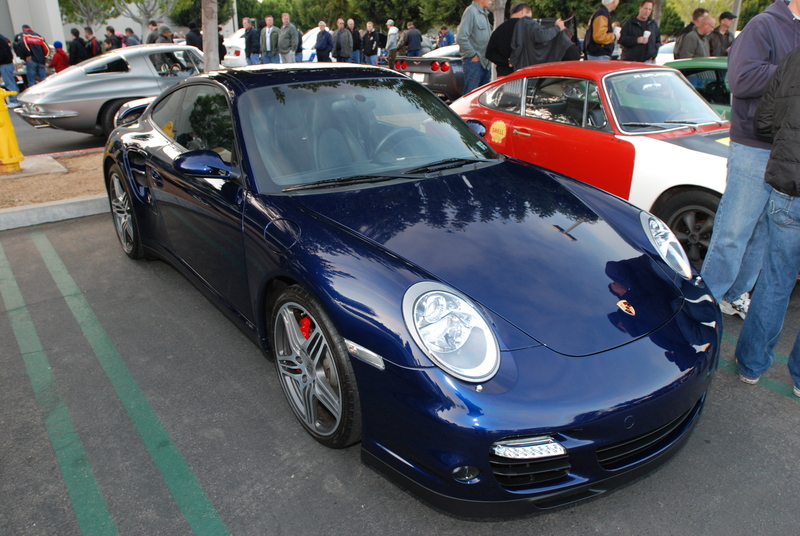 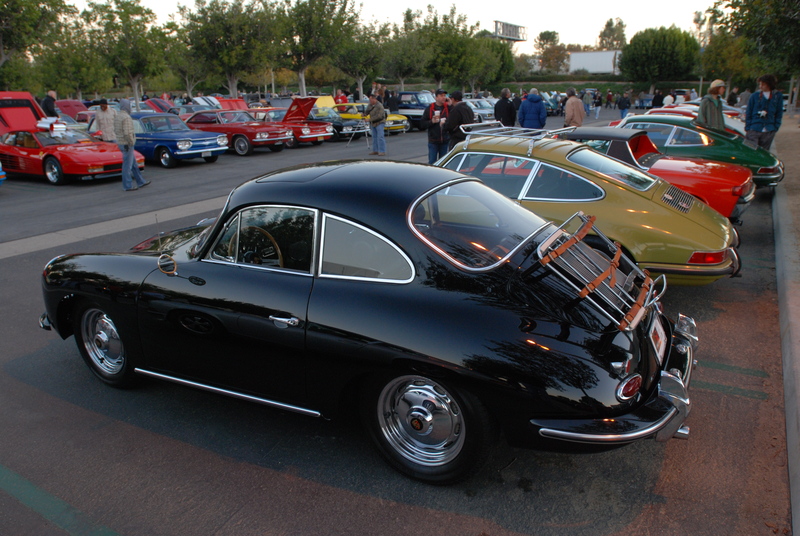 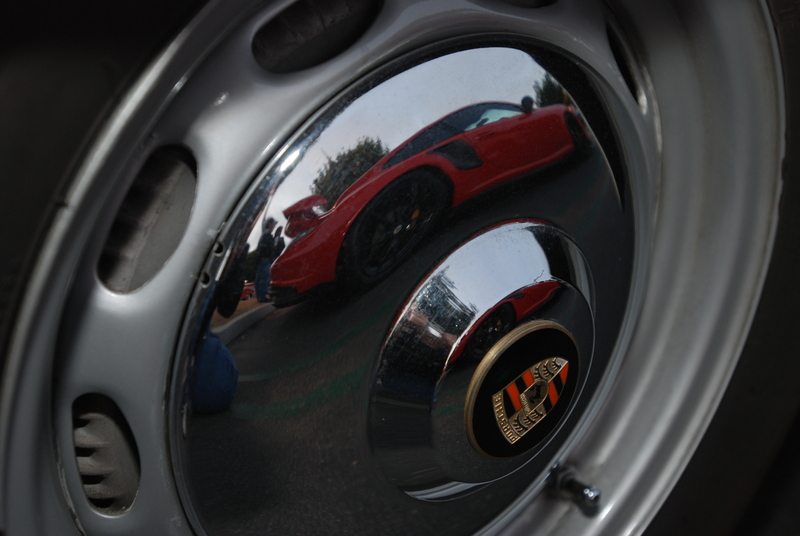 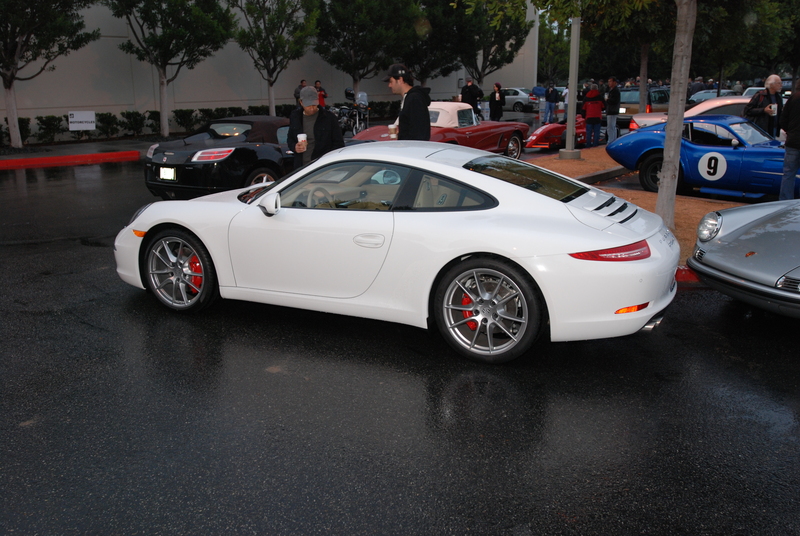 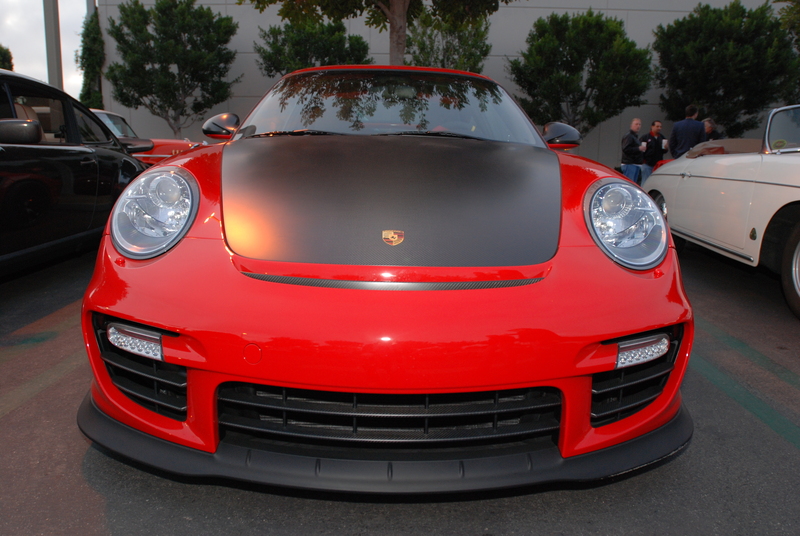 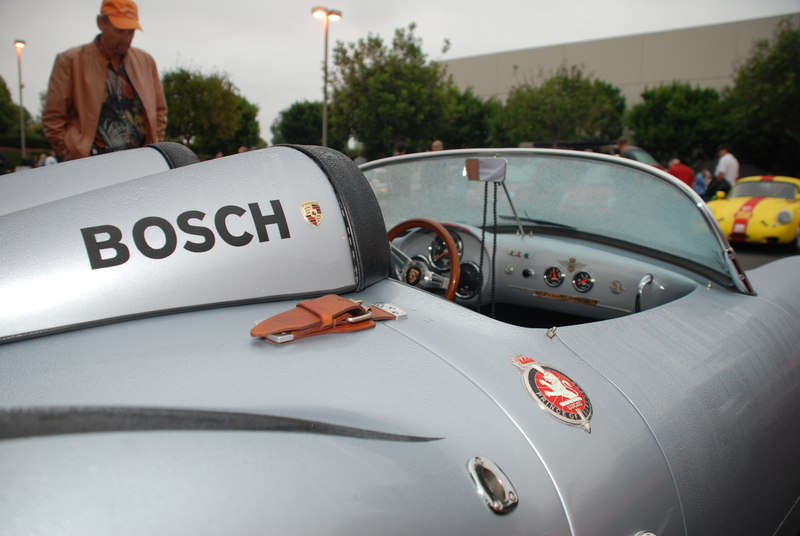 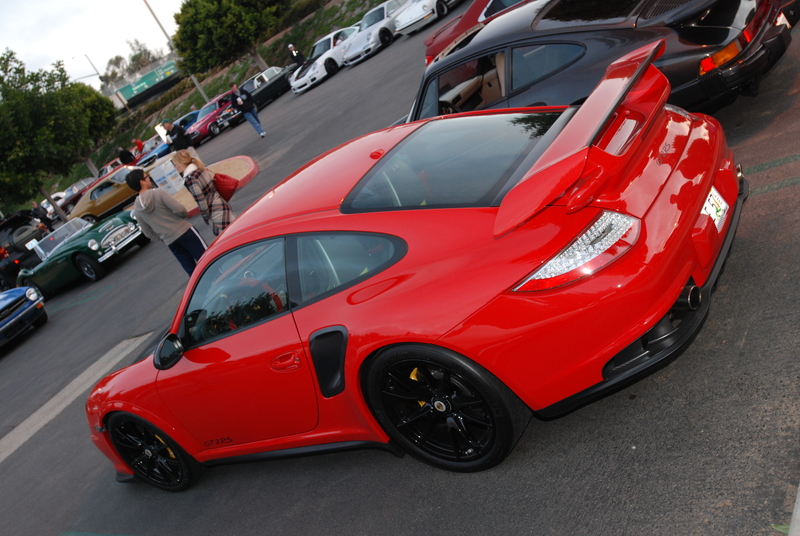 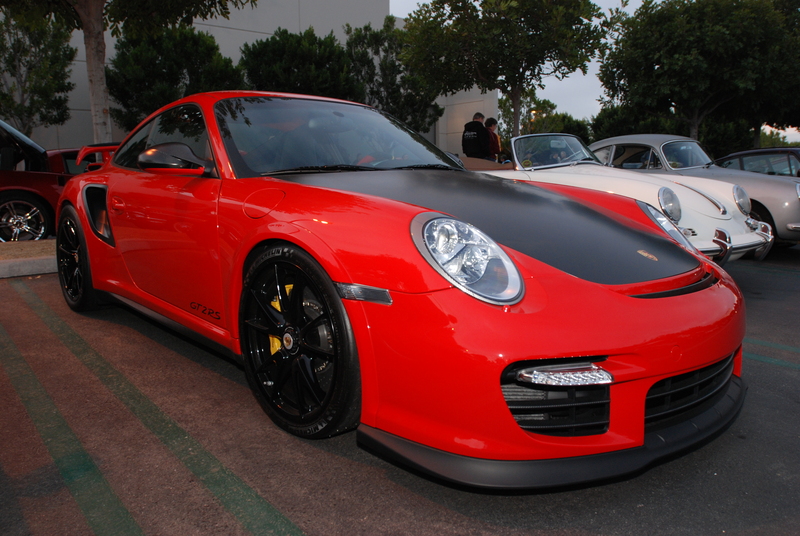 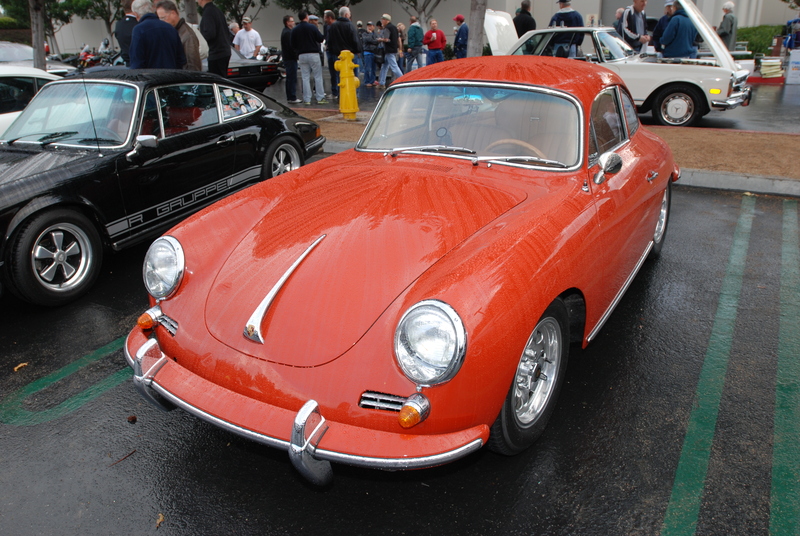 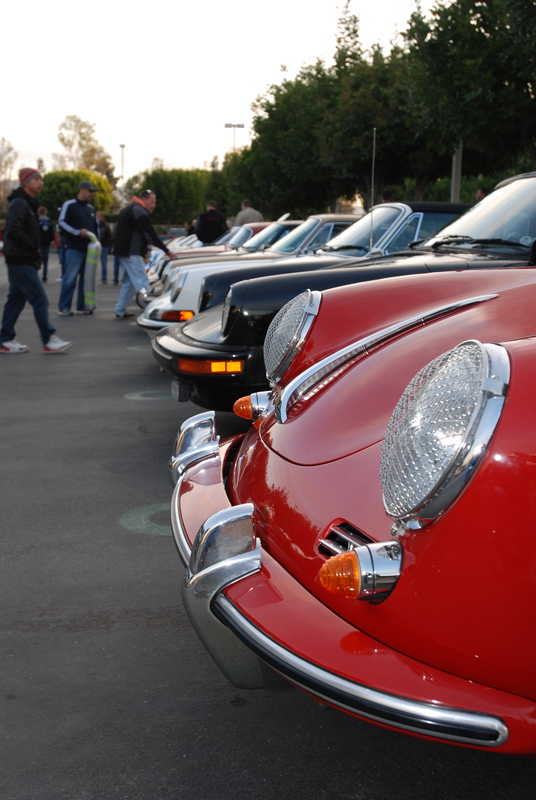 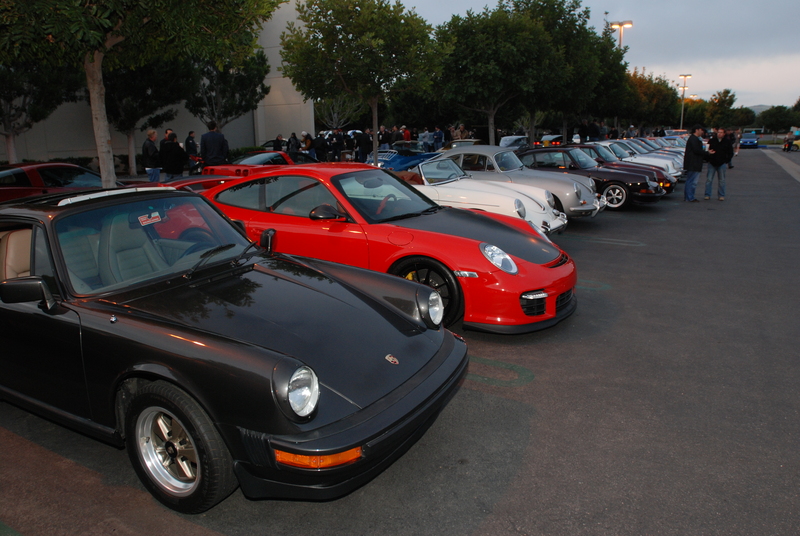 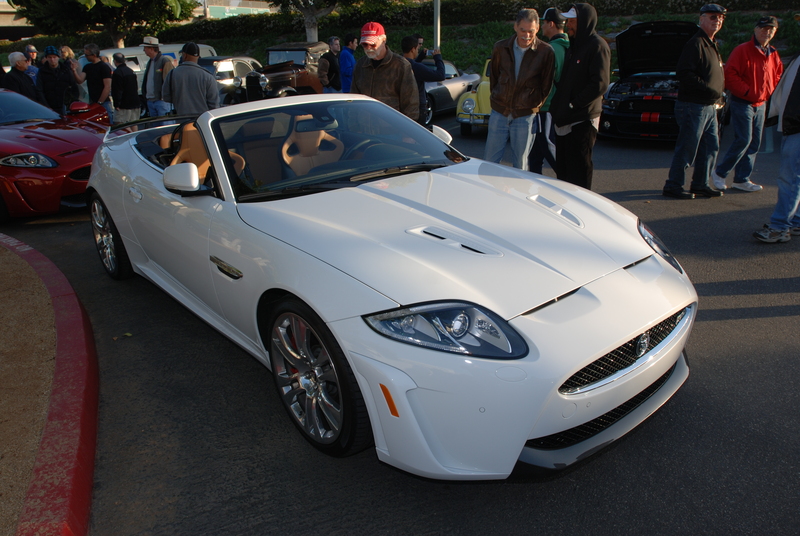 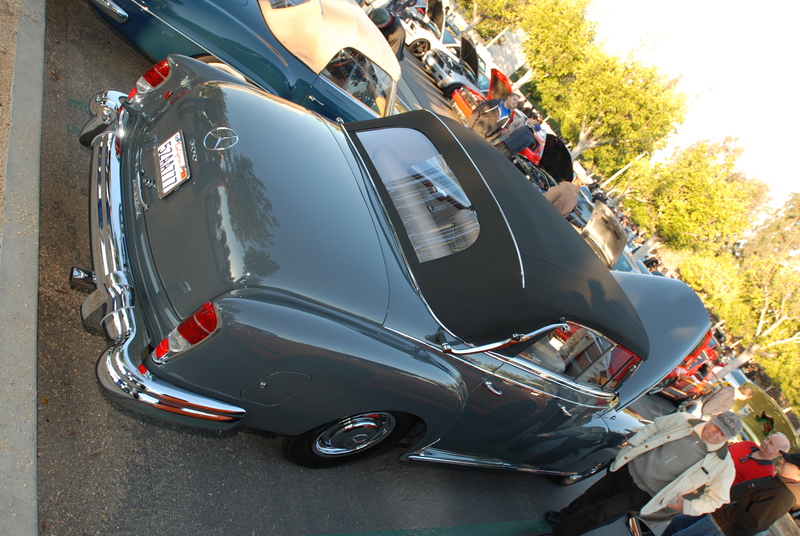 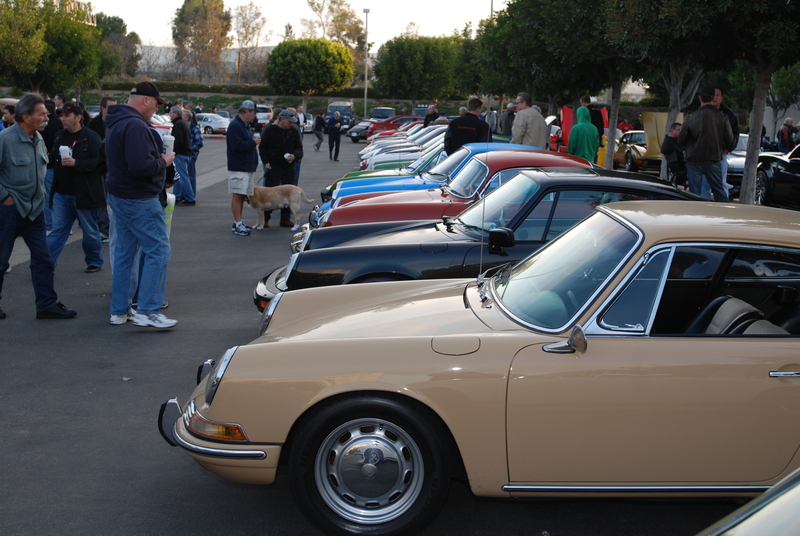 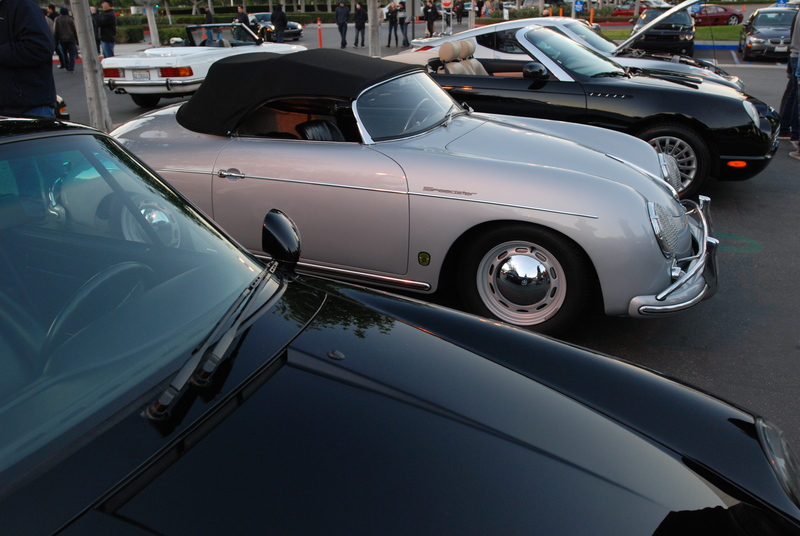 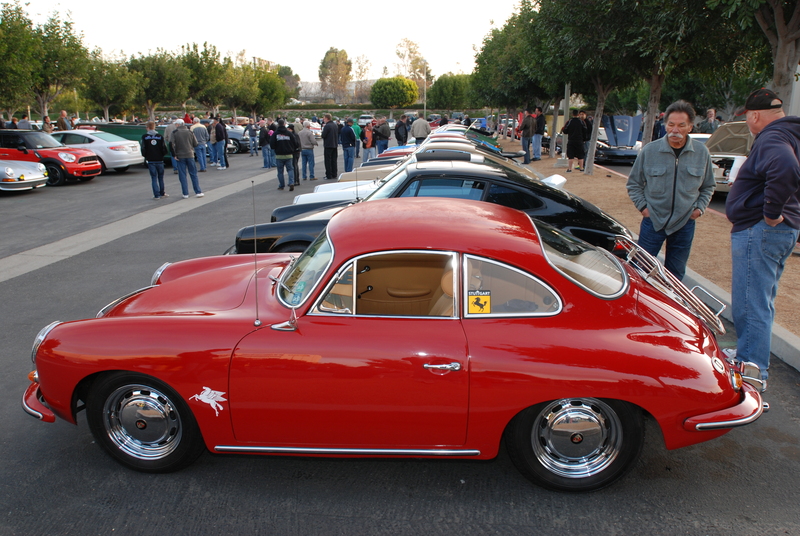 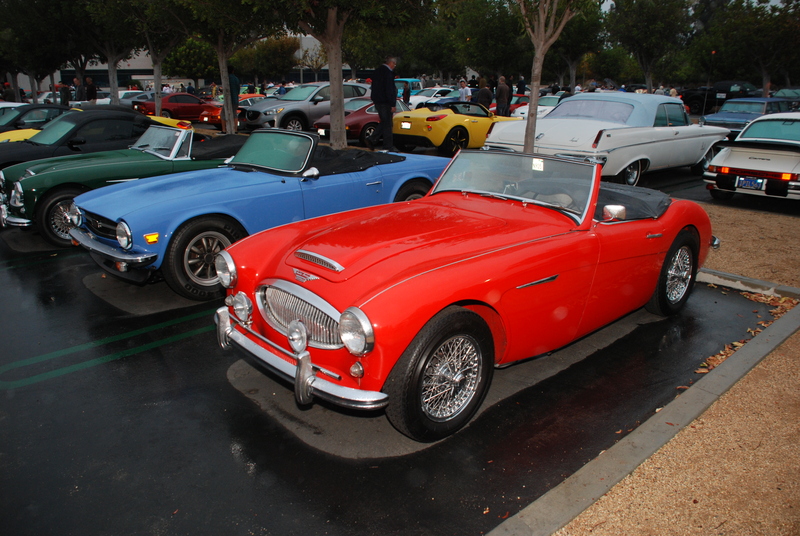 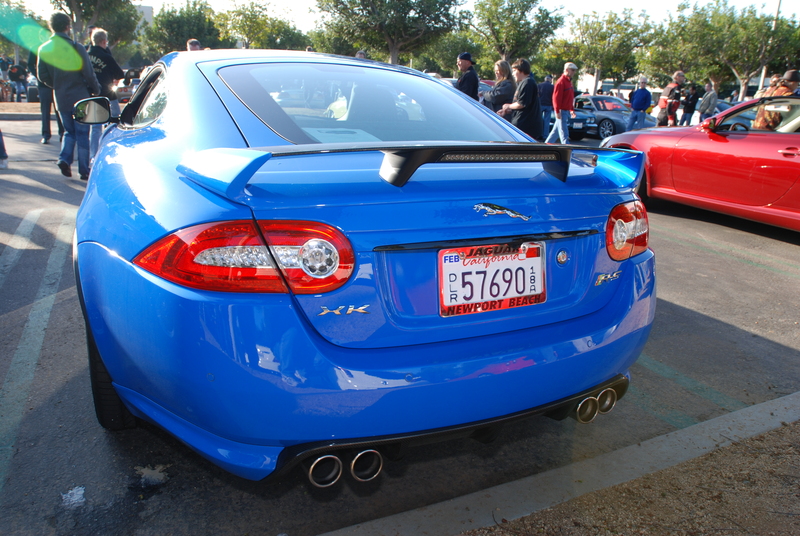 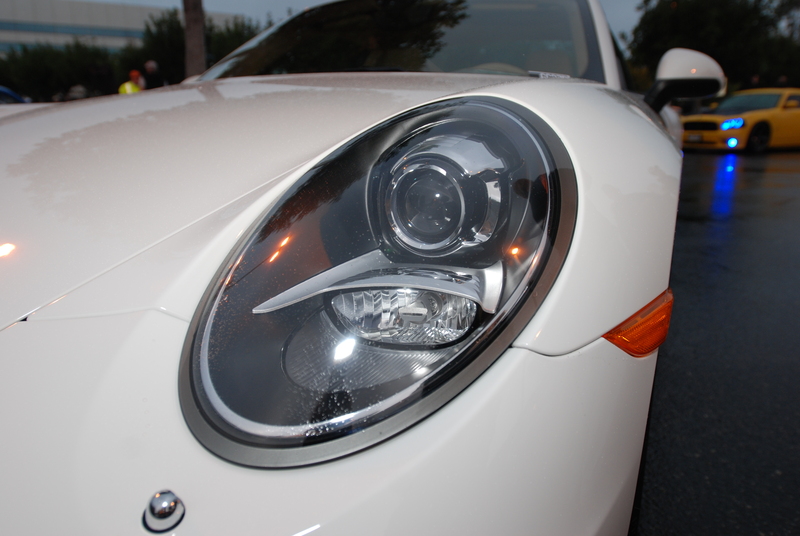 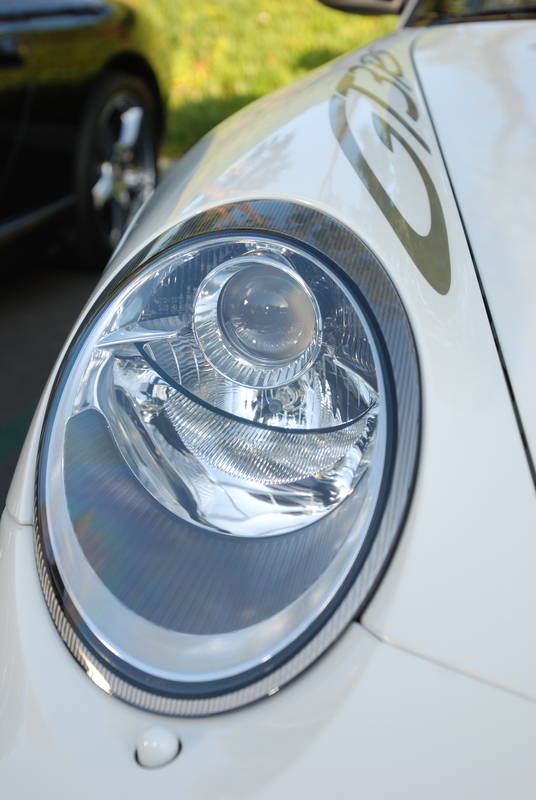 The first Cars&Coffee gathering of 2013 dawned cool, crisp and clear, and finally without the threat of rain. 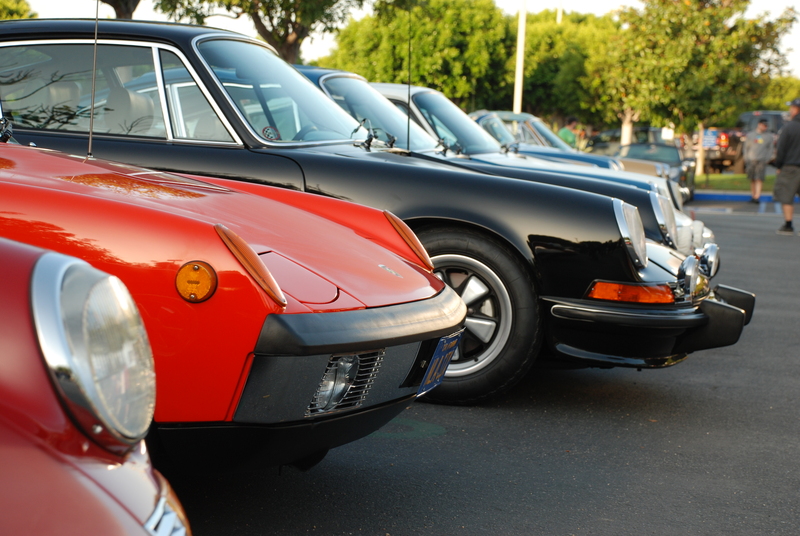 Obviously a very welcomed sight for those in attendance Saturday morning. 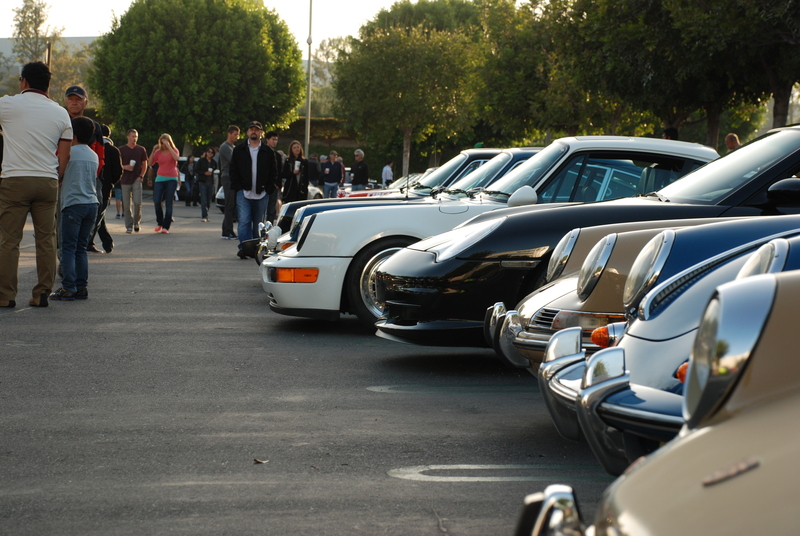 And gauging by the sheer number of cars in attendance, all were eager to start the new year off in grand style. 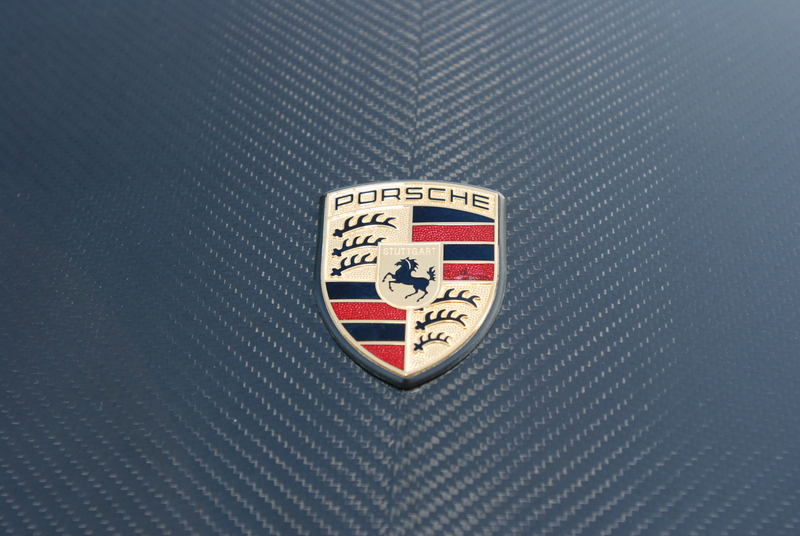 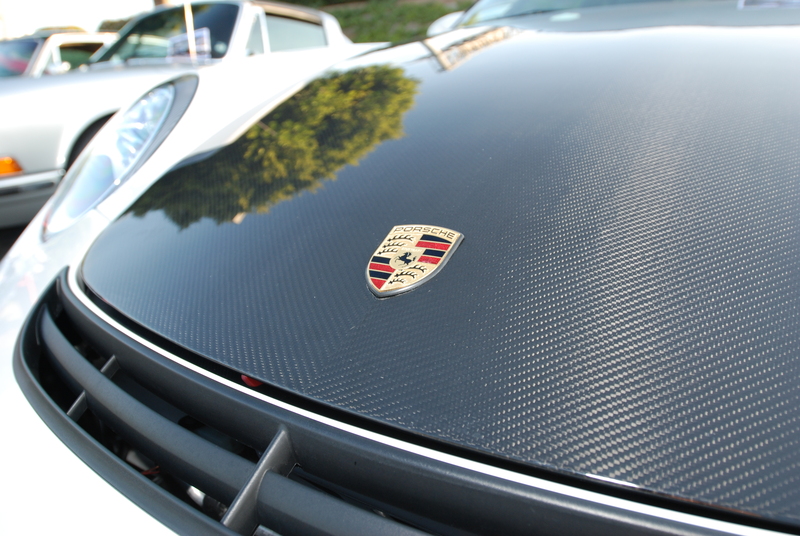 It seemed that in order to park in this particular section of Porsche row, your car had to be either black or silver, and be parked in an alternating pattern… did anyone else notice this? 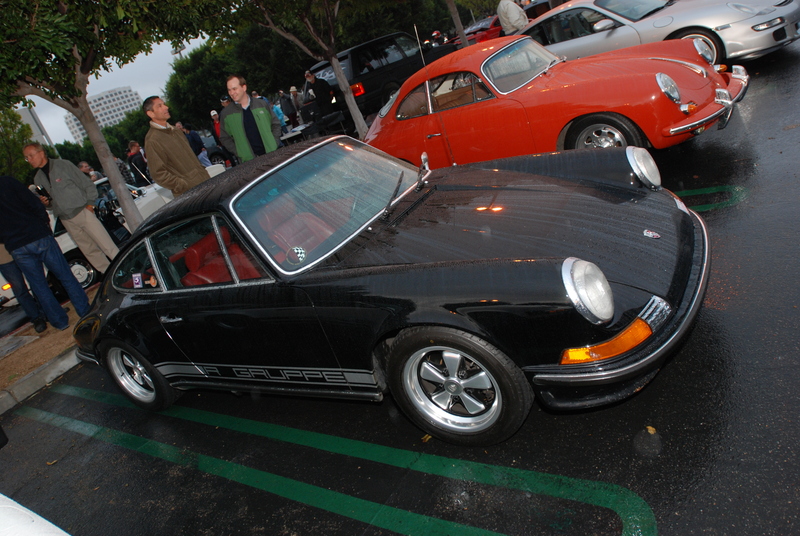 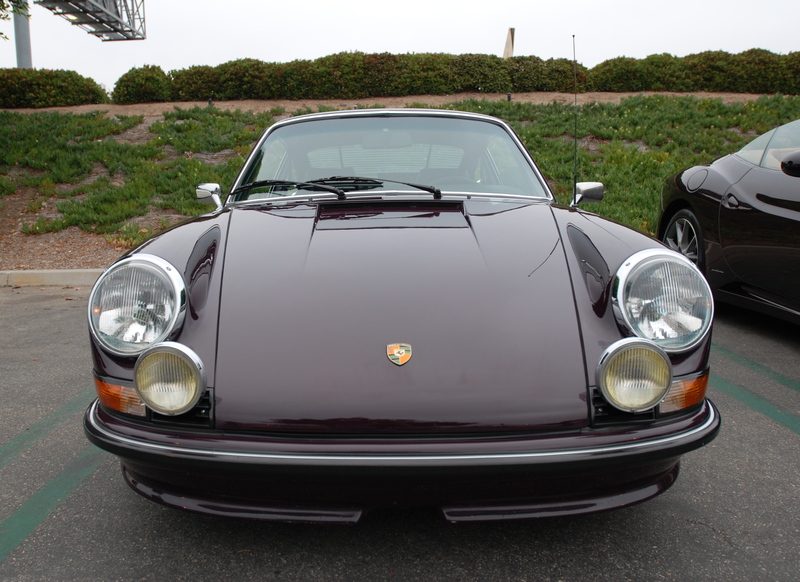 Parked directly across the aisle from Porsche row, was this rare black, 1973 Porsche 911 Carrera RS, configured for right hand drive. 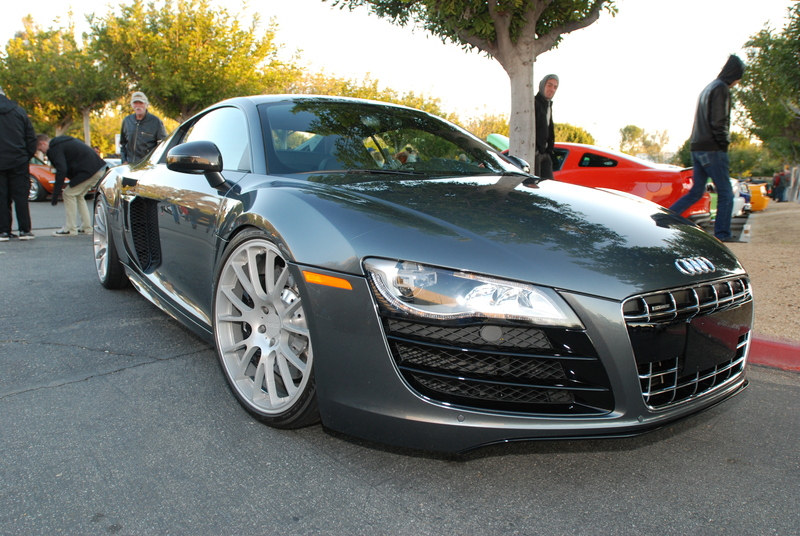 Parked at the opposite end of the row, was one of several Audi R8’s in attendance; this particular model in Daytona Gray Pearl, was one of several V10 variants, and wearing a set of custom wheels by Stasis (above and below). 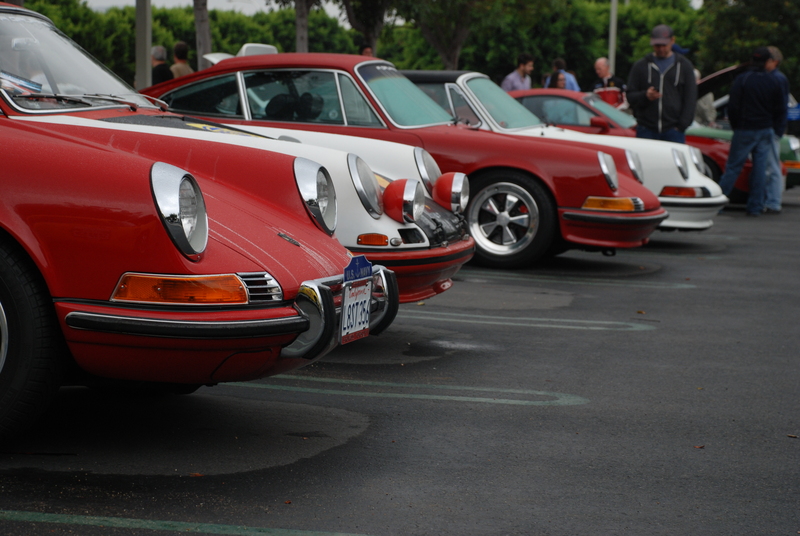 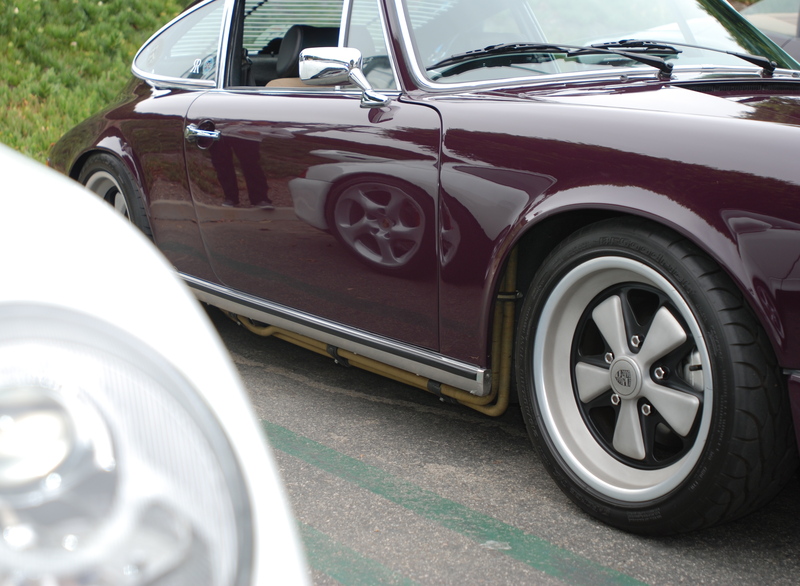 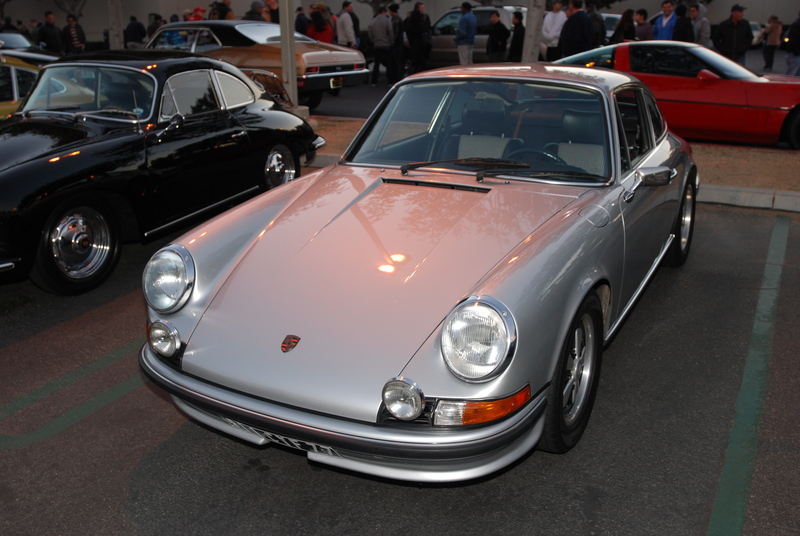 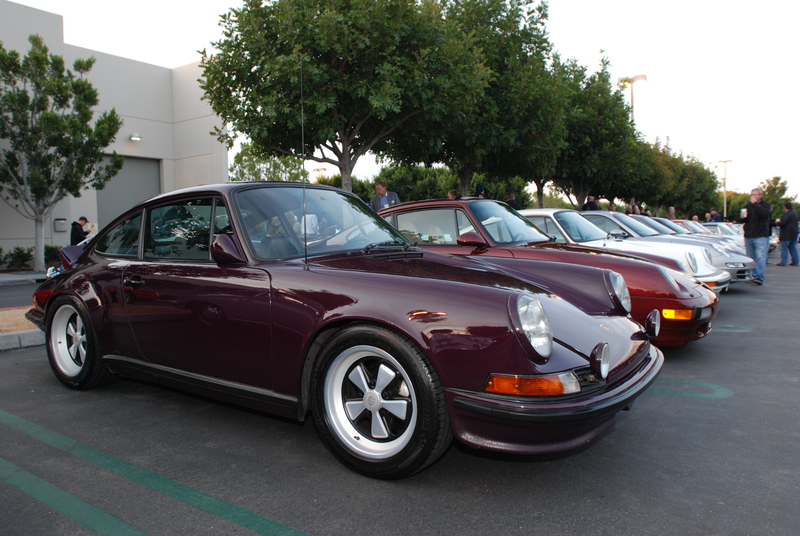 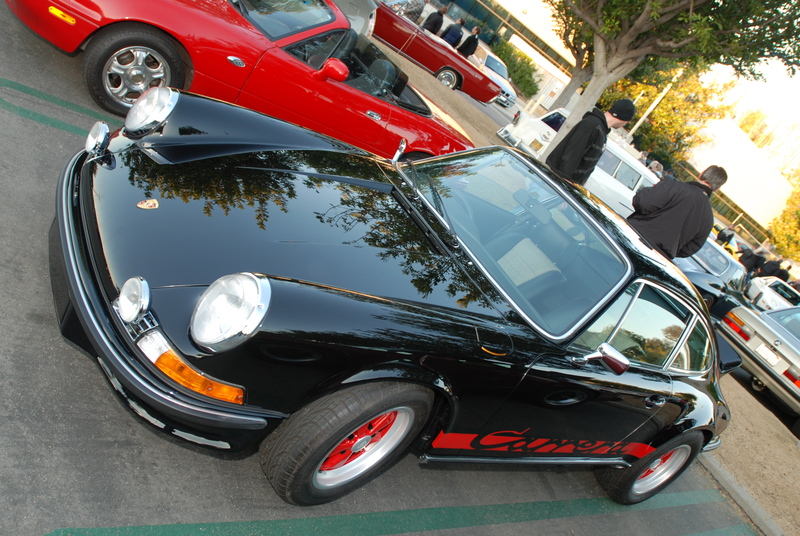 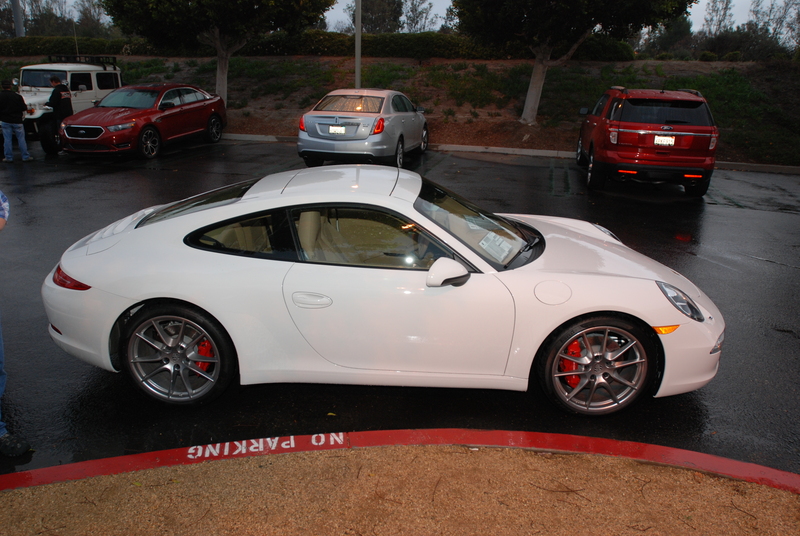 As I made my way through the parking lot, there parked under the tress, and just across from Porsche row, were these two rare Porsche 911s (both of which have graced my previous blog posts individually, but never together until now). 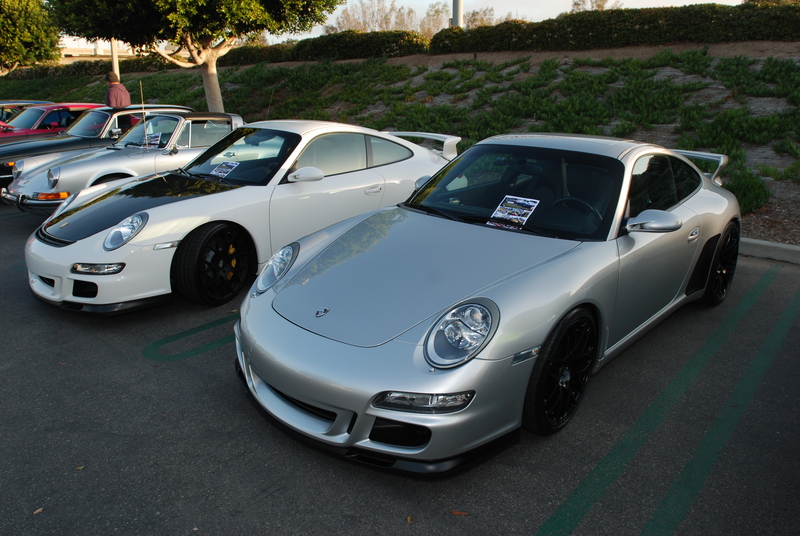 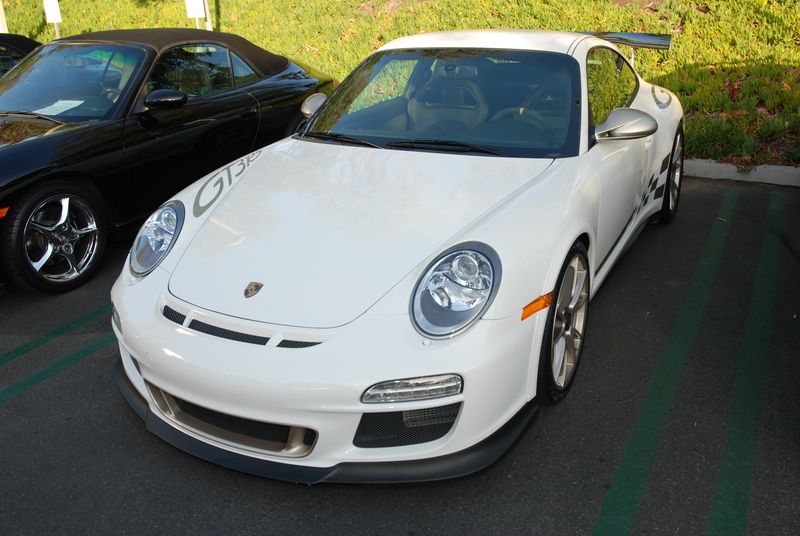 First up was the Grand Prix white 1991 Porsche 964 Turbo, and parked immediately behind in Riviera blue, was a true, European model 1996 Porsche 993 Carrera RS Club Sport. 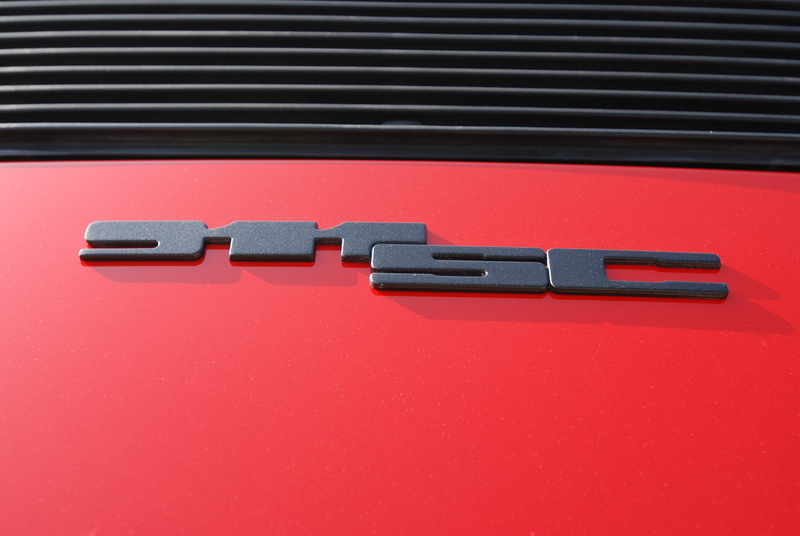 The 993 Carrera RS Club Sport… one of only 57 built by Porsche in 1996. 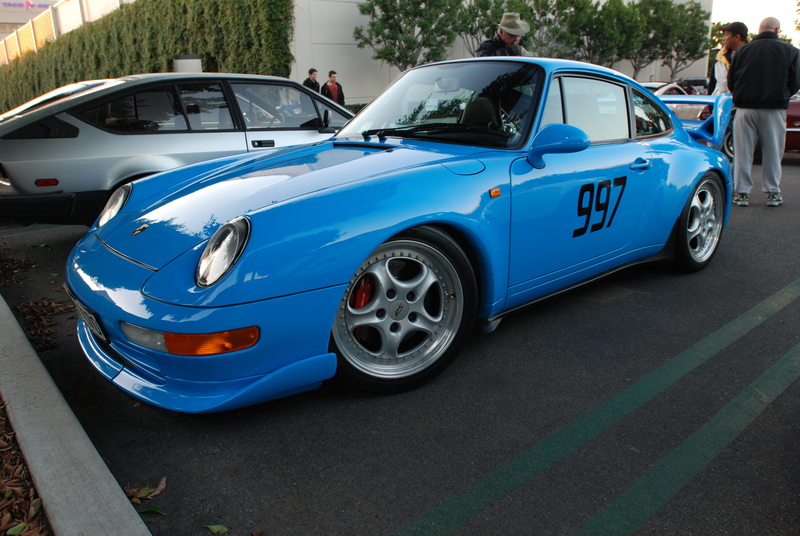 For more details and photos of this Porsche 993 Carrera RS Club Sport model, please refer to my previous post via the following link. 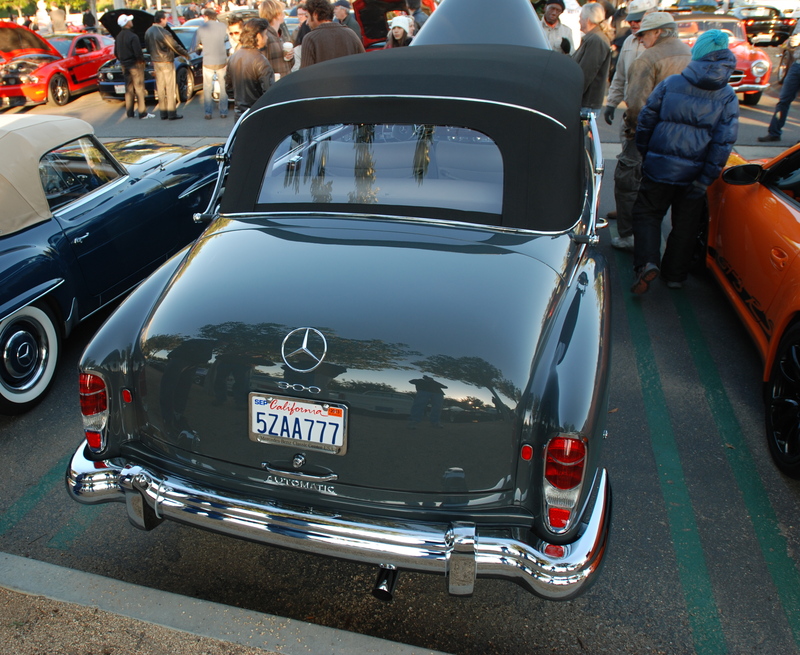 Parked amidst it German brethren, was this beautifully restored, early 1960s vintage Gray Mercedes-Benz 300 D Automatic, 4 door Cabriolet as seen below. 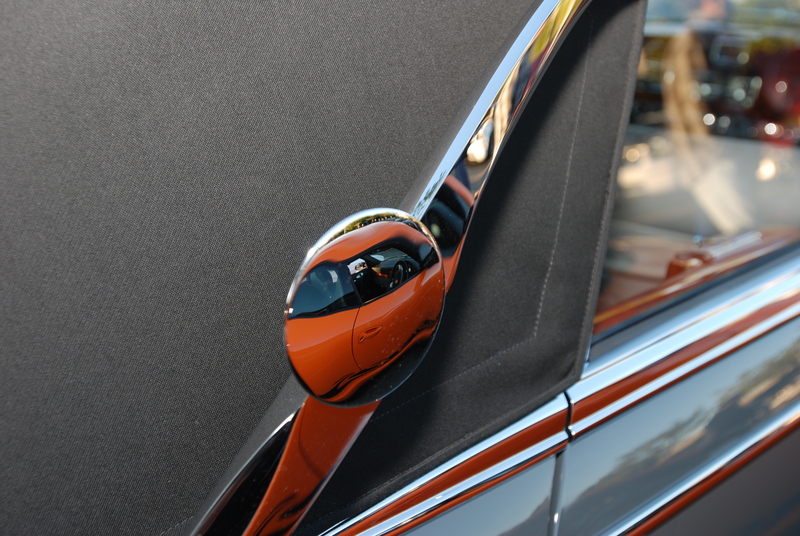 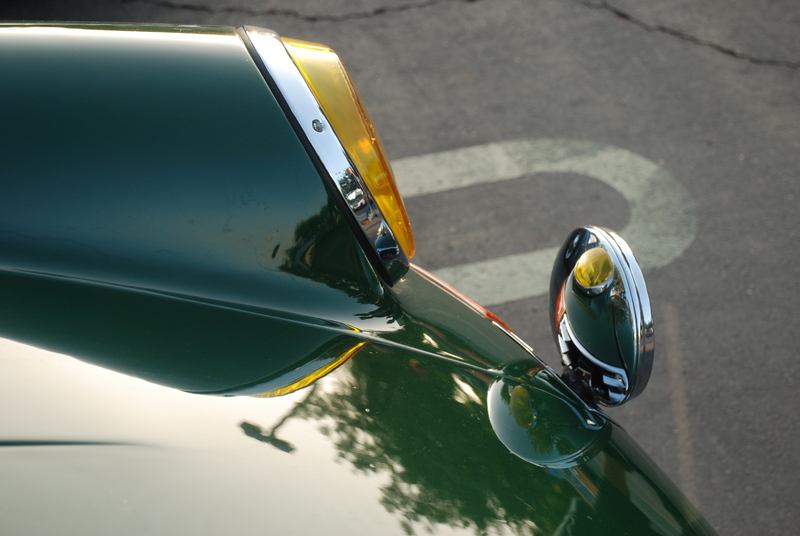 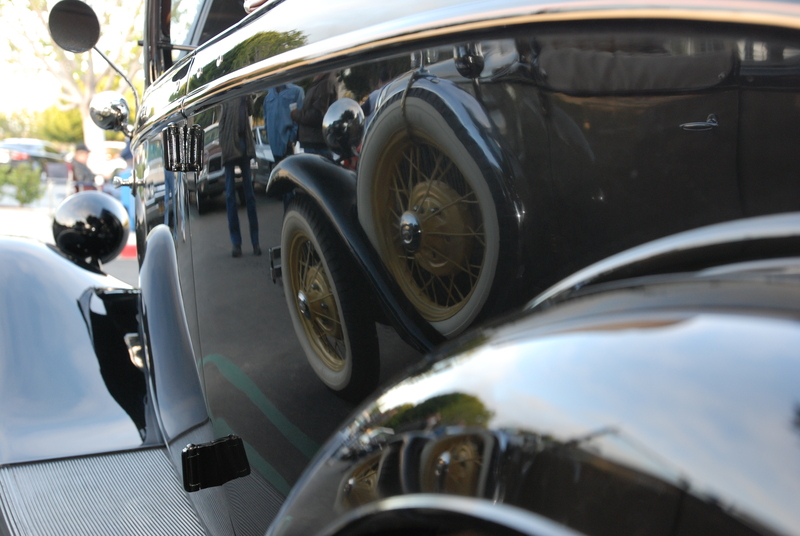 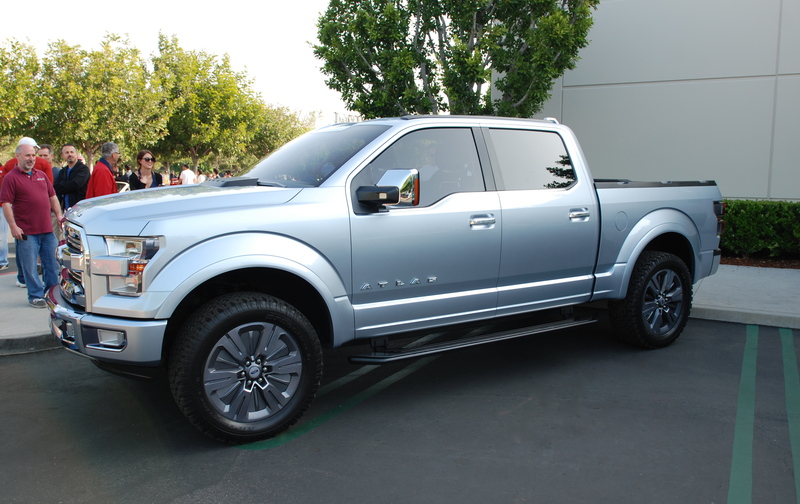 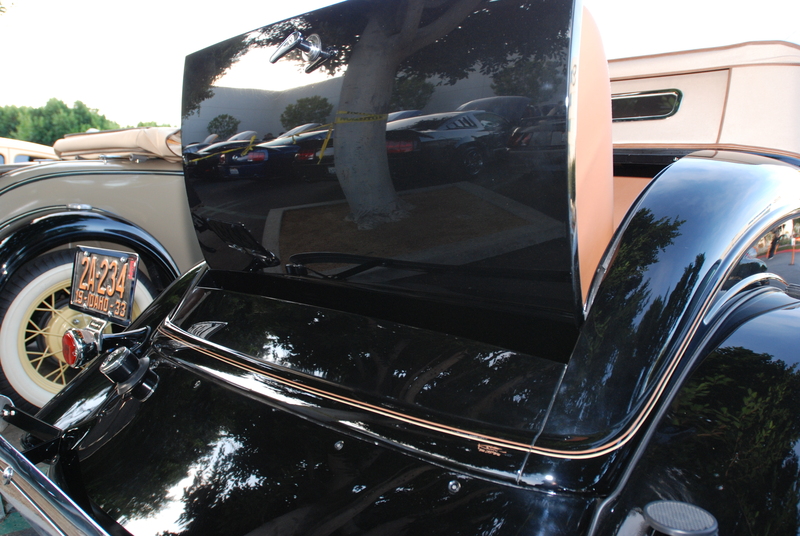 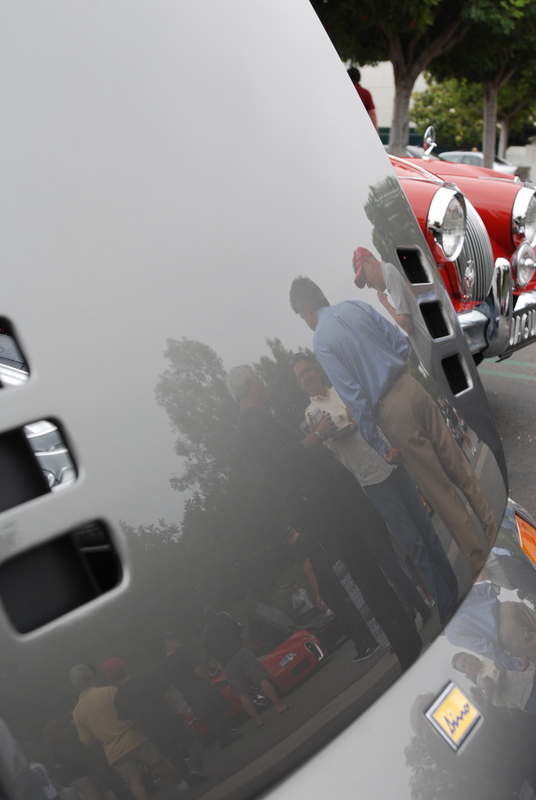 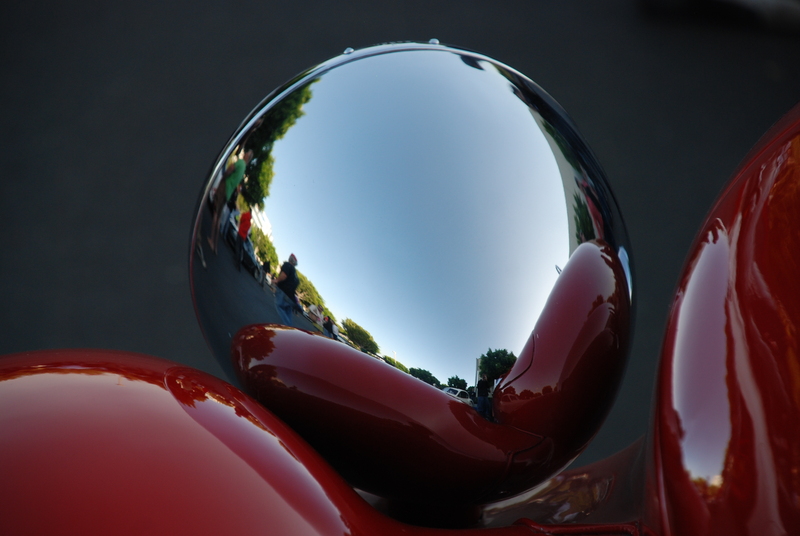 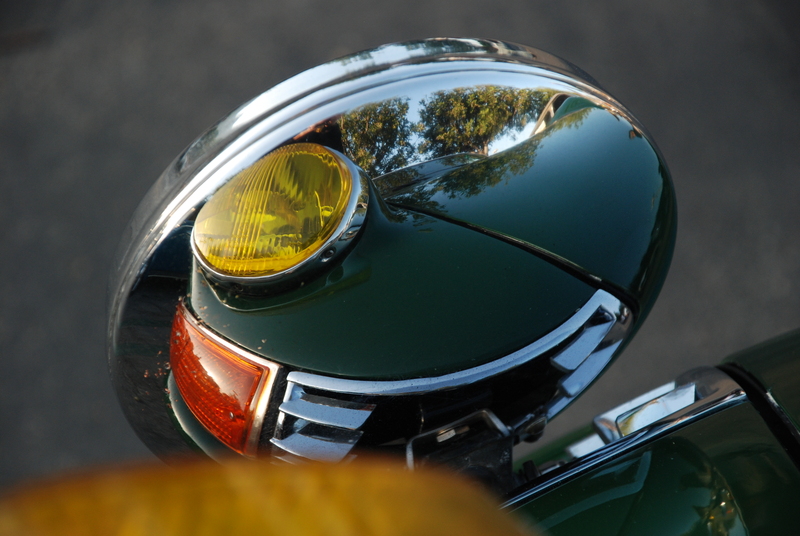 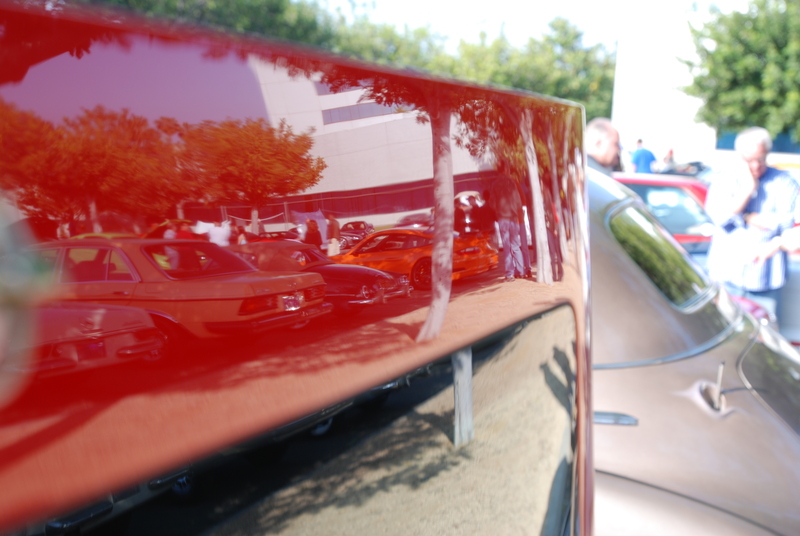 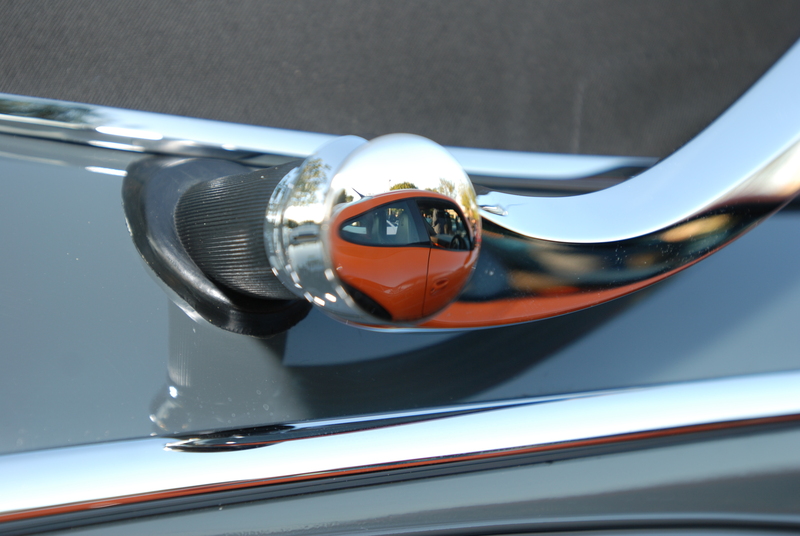 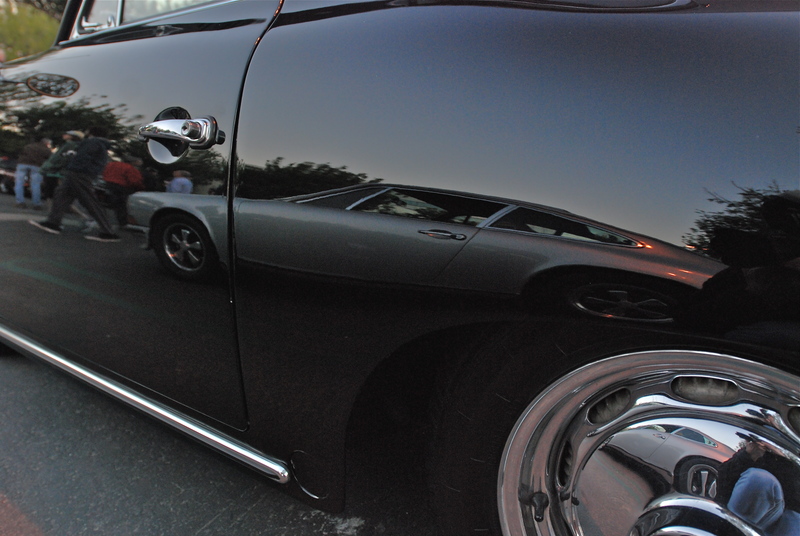 Early morning reflections captured in flawless paint and chrome trim (above and below). 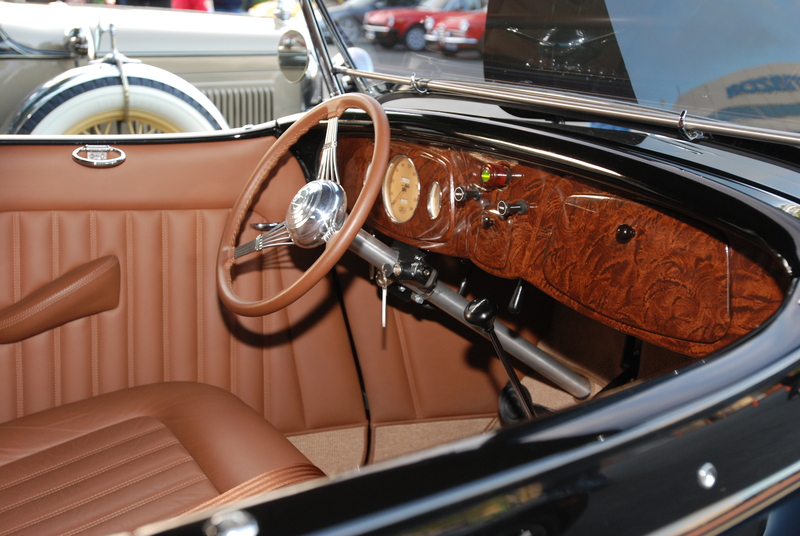 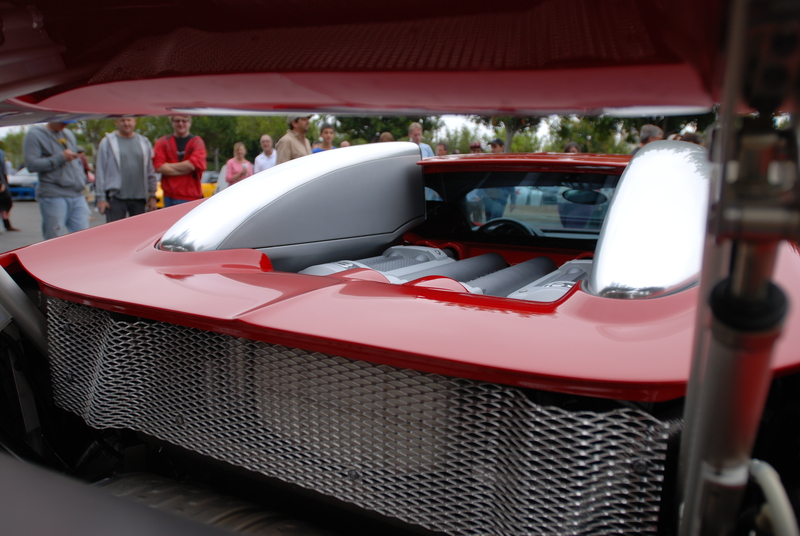 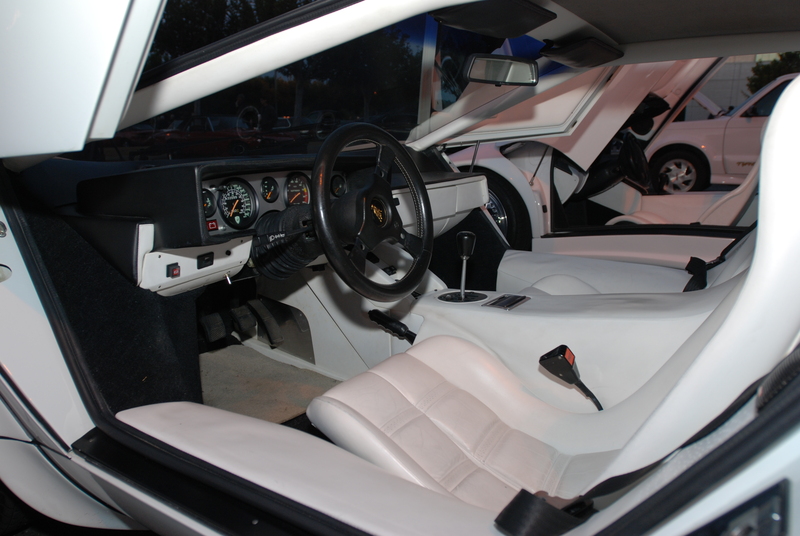 Even the motor and engine compartment were showroom fresh, and as highly detailed as the rest of the car. 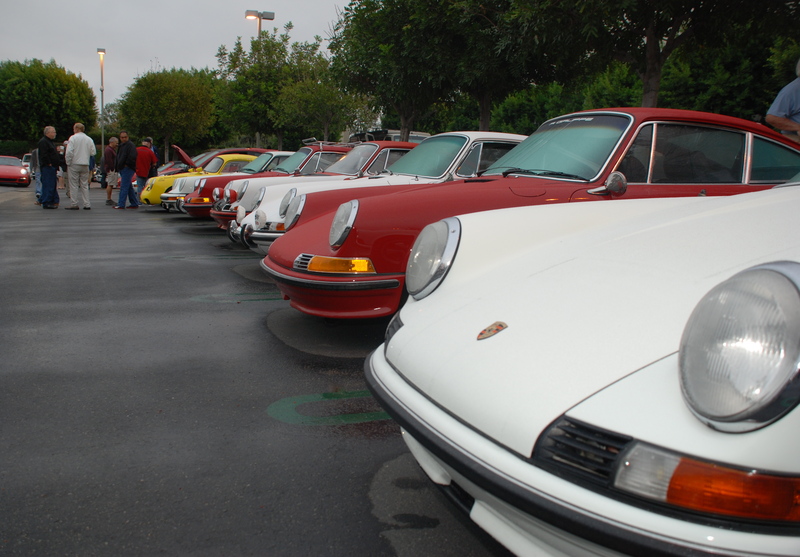 Even as the light drizzle descended upon Saturday mornings Cars&Coffee gathering, the weak storm front was unable to dampen the spirits of the early morning, die-hard participants. 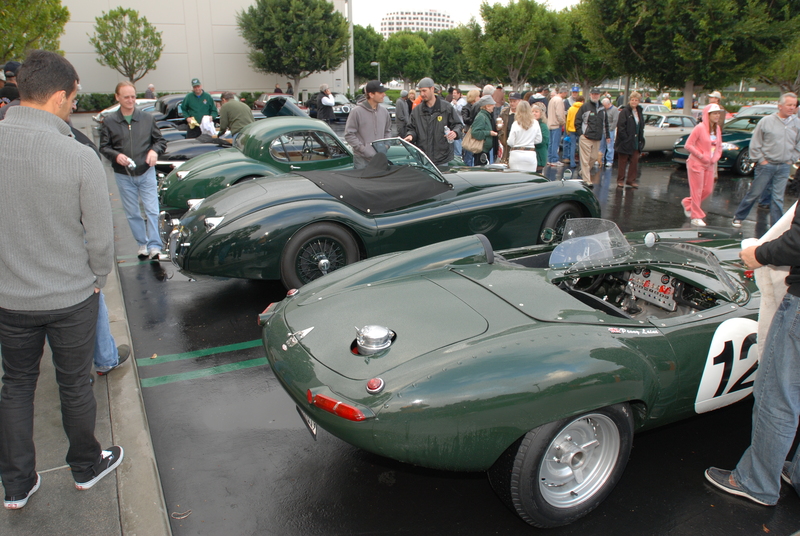 What initially appeared as lighter than usual attendance at 6 AM, progressed into a steady stream of cars that continued arriving well past 8 AM. 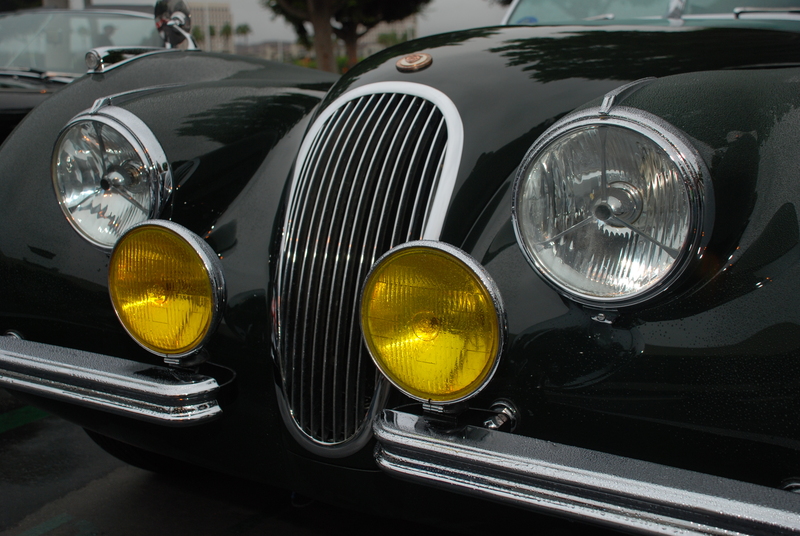 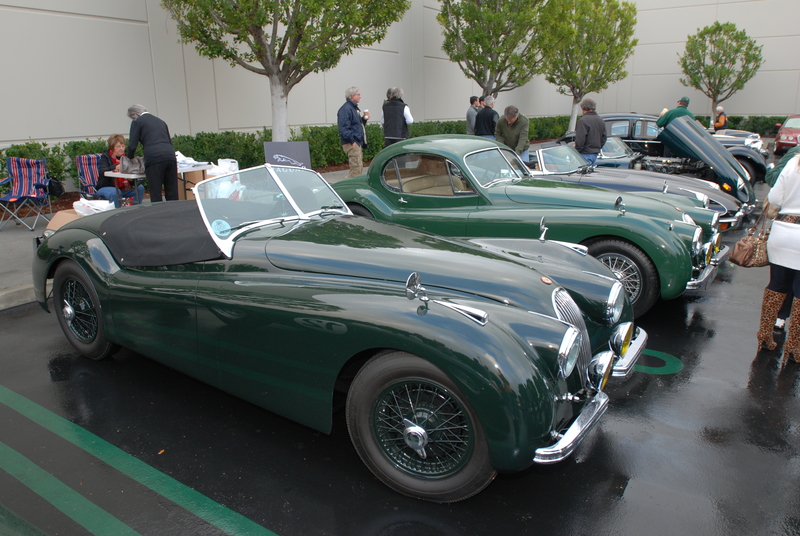 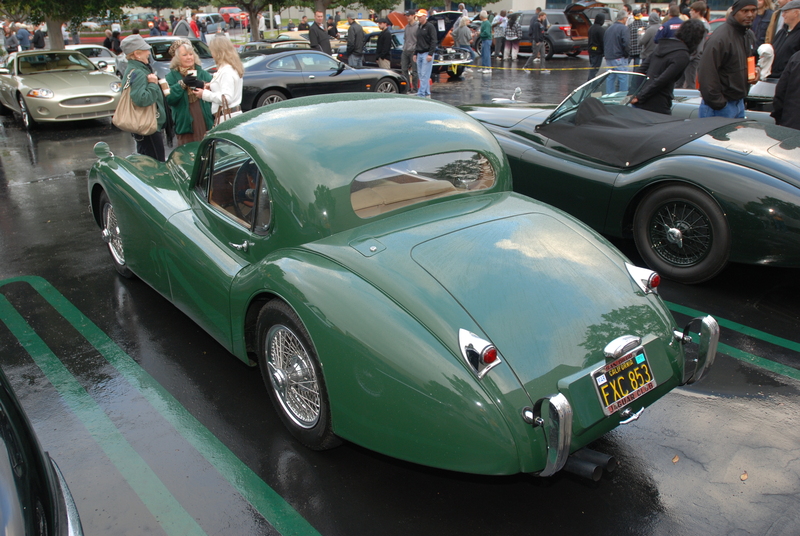 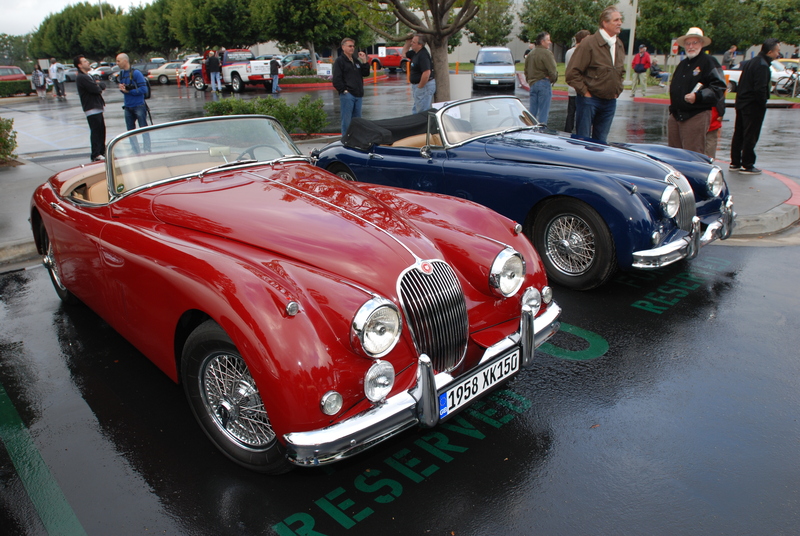 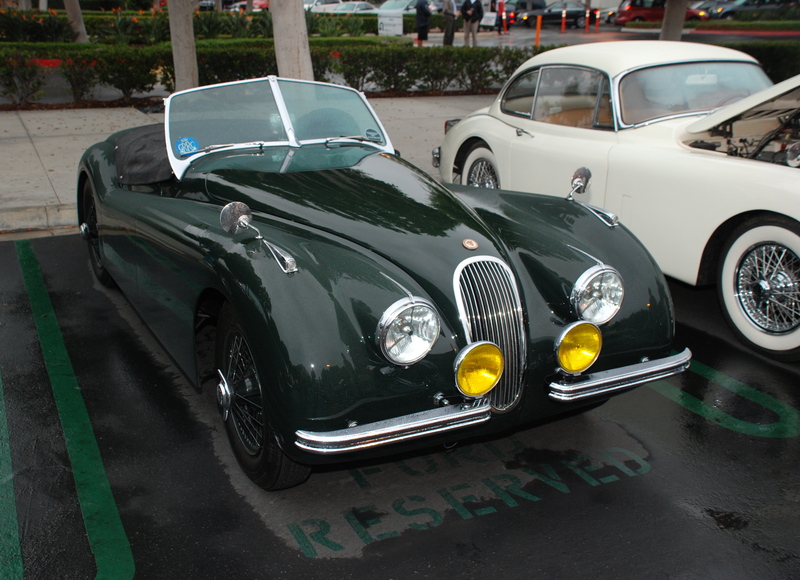 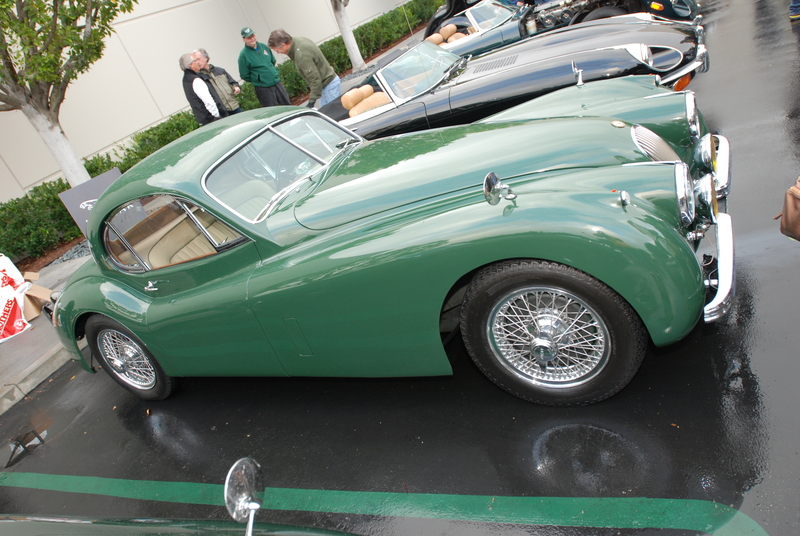 Even these classic Jaguar’s ( XK 140 roadster & XK 150 coupe) as seen below, came out and braved the less than sunny morning. 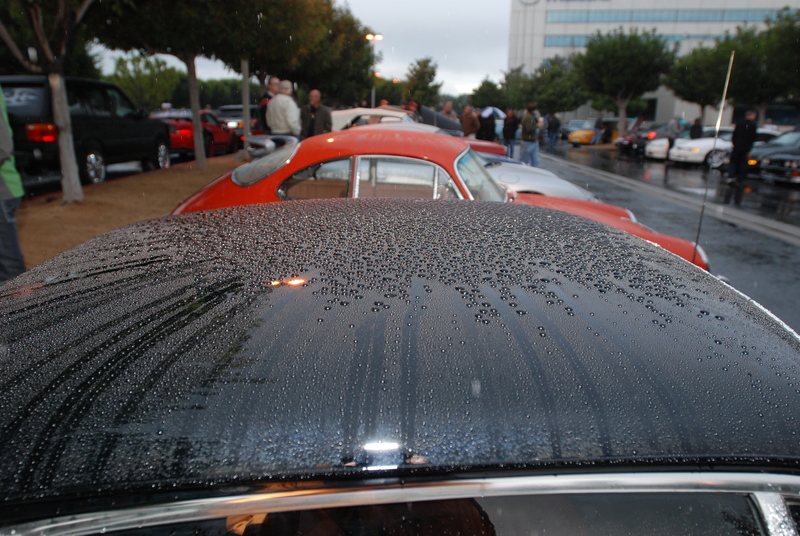 What was even more amazing (at least to me), was observing that the owners of these beautifully restored cars appeared unfazed by the drizzle falling onto their prized possessions. 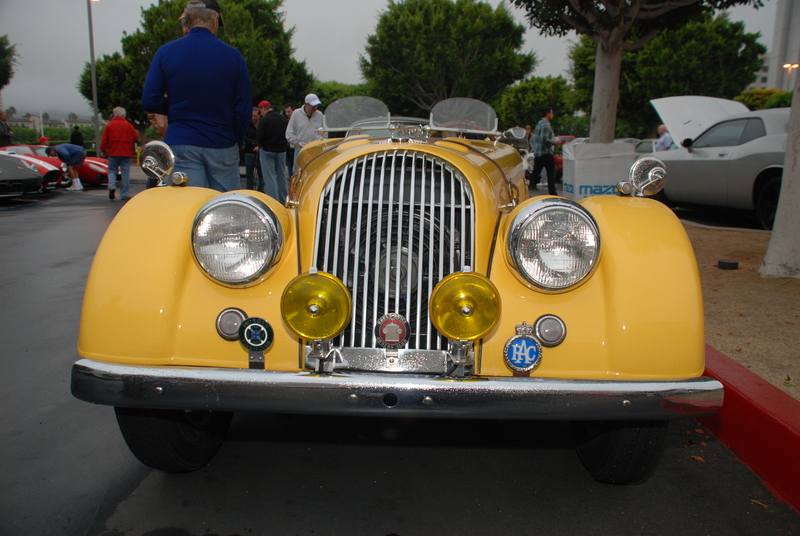 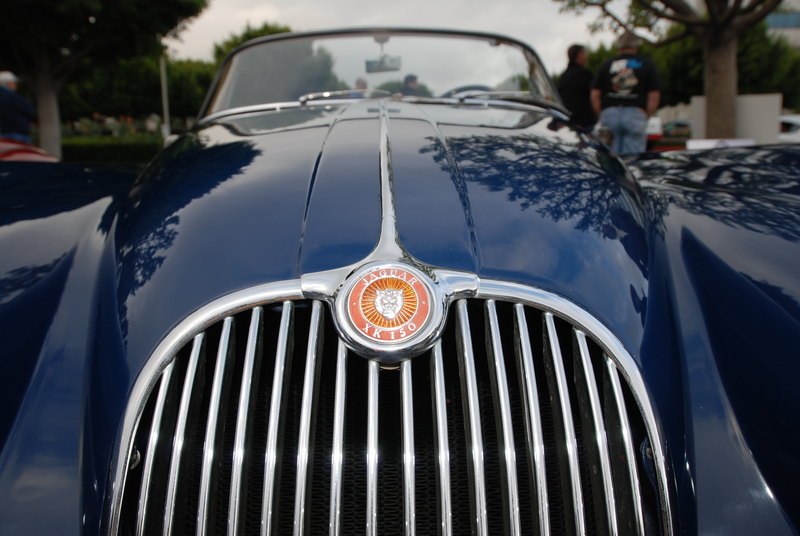 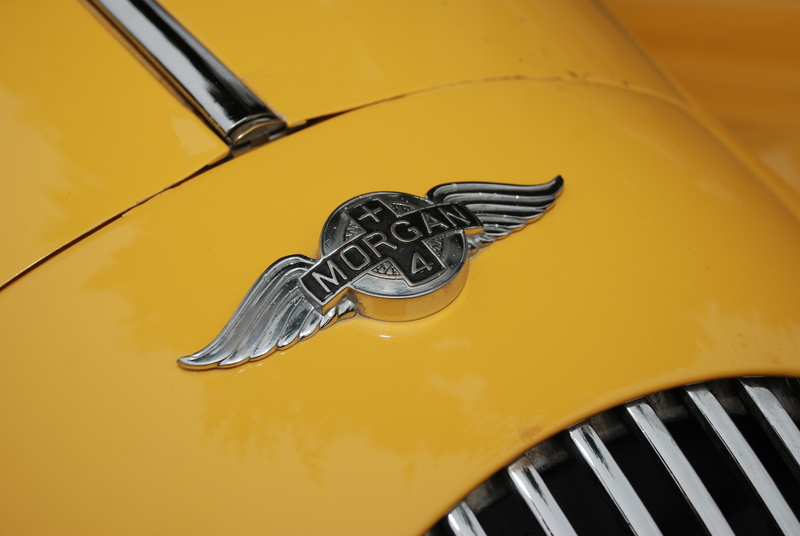 One of a handful of gumball hued cars in attendance, and delivering an intense splash of color to an otherwise gray morning, was this sunflower yellow hued, Morgan Plus 4 roadster (below). 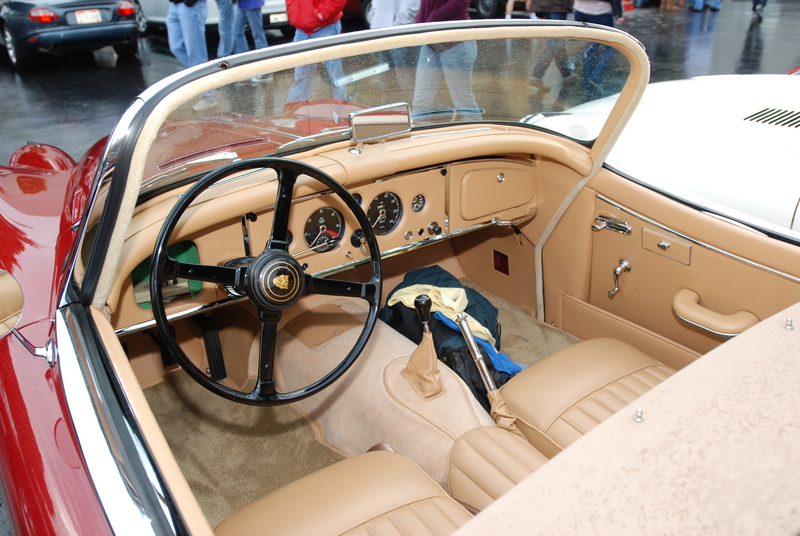 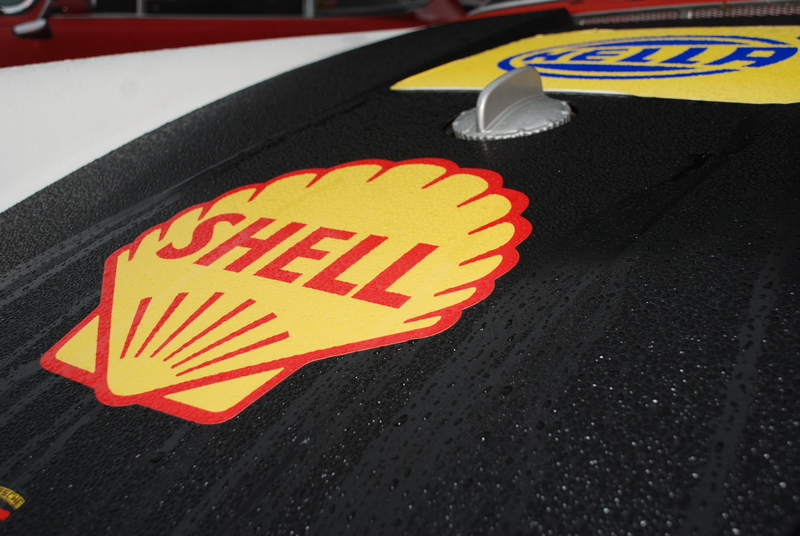 With the abbreviated racing windscreens as seen below, probably not much protection at speed from the rain. 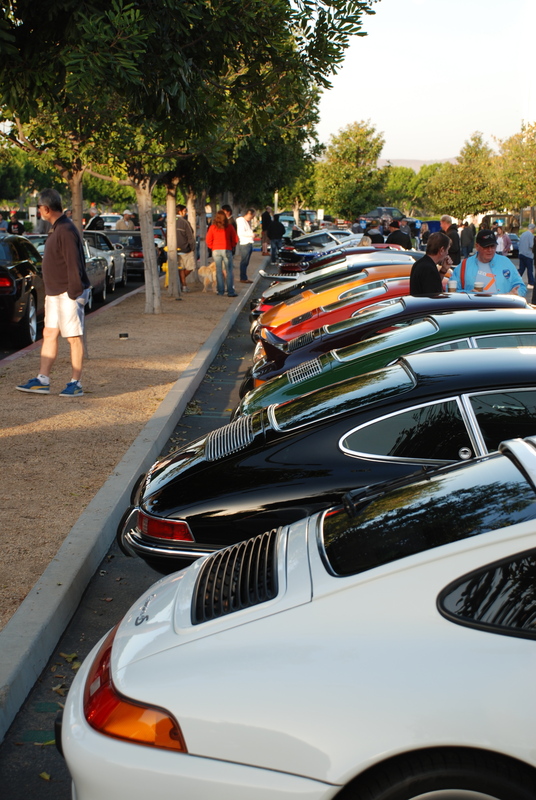 Back over on Porsche row, the regulars were once again assembled; I’m not sure if this arrangement by color was staged or purely by accident. 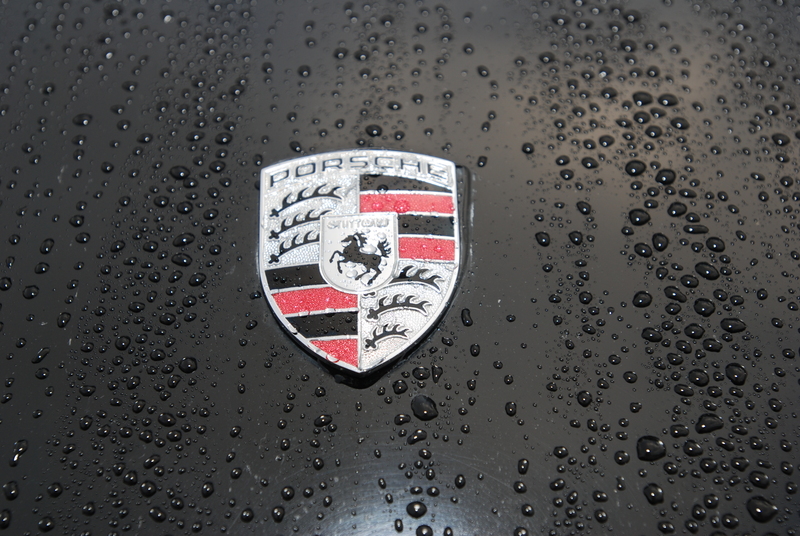 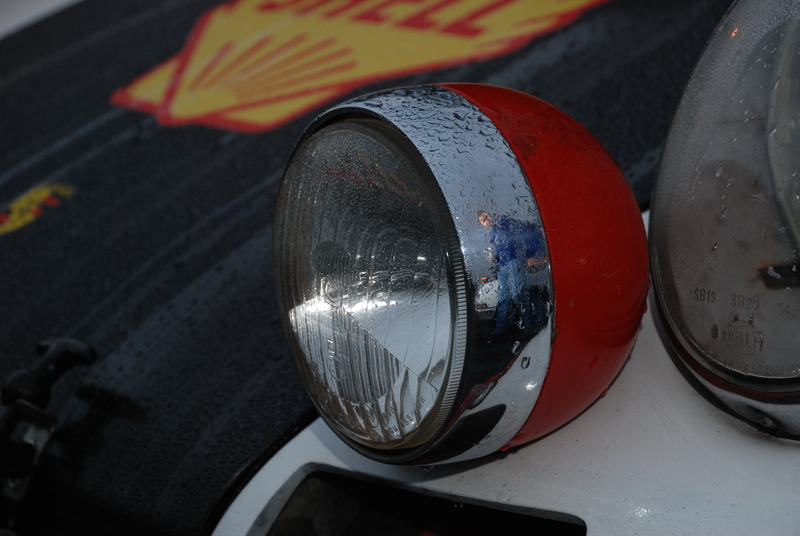 The cumulative effect of the mornings drizzle as seen on the hood and driving light; Rolly’s red, white and black 1966 Porsche 911. 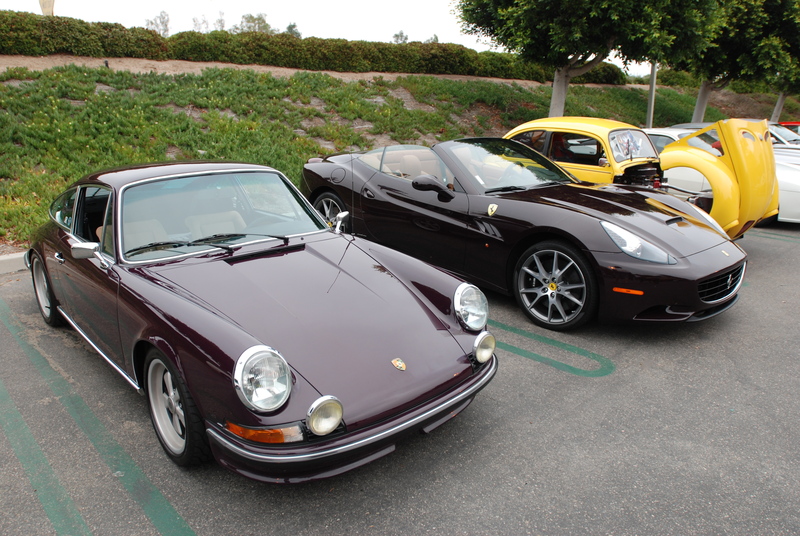 A dual set of color matched Porsche bookends. 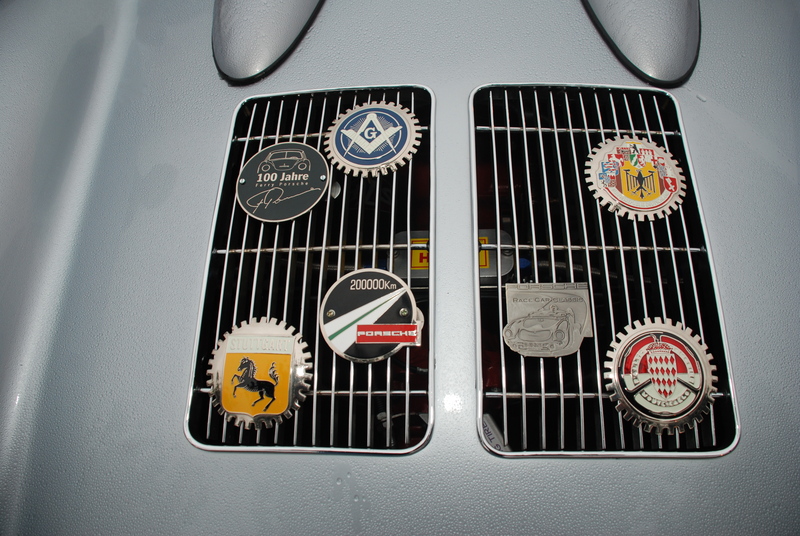 and literally dripping with badges. 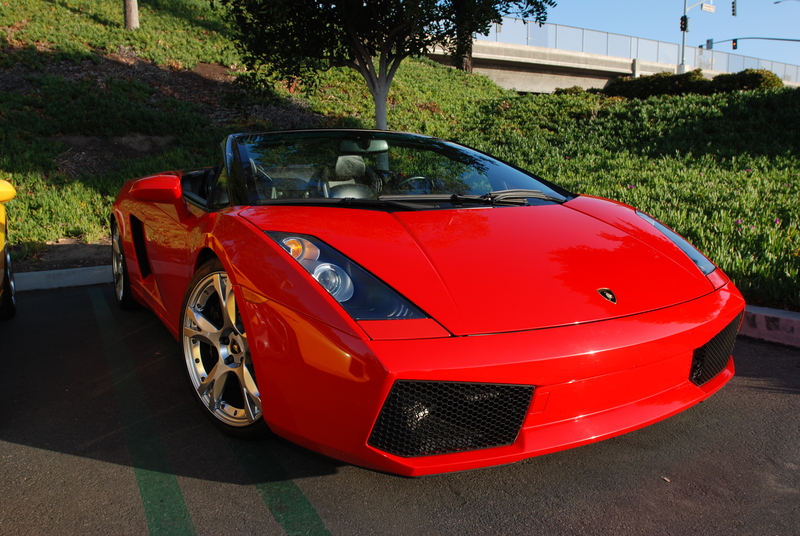 Located several rows over towards the west, and shining like an orange beacon through the mist, was this beautiful, Lamborghini Gallardo. 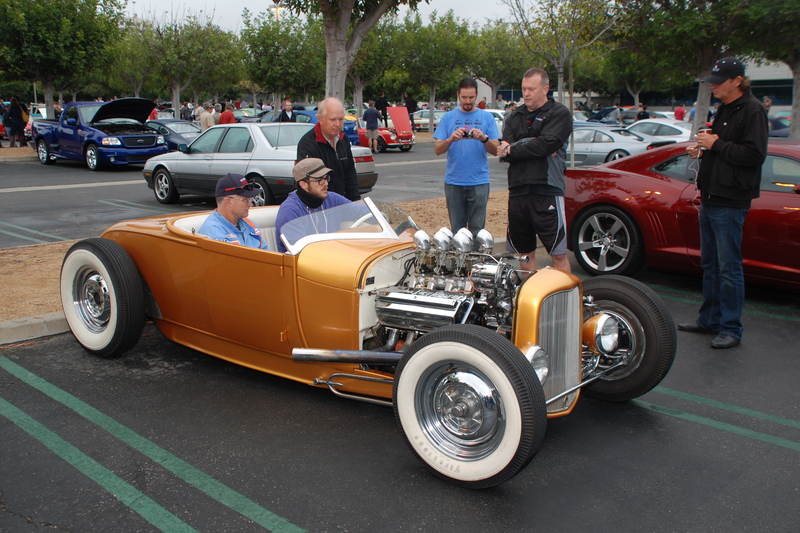 And representing the die-hard hot rod contingency, was a very cool, gold customized roadster parked out towards the back row. 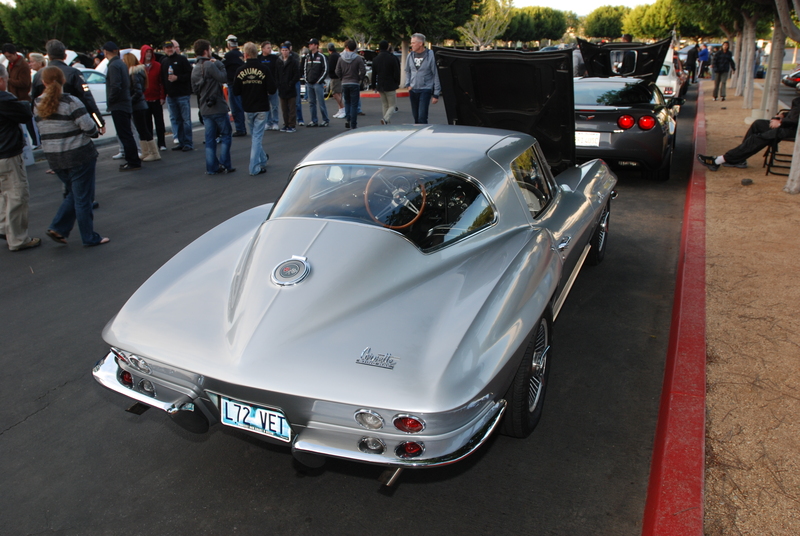 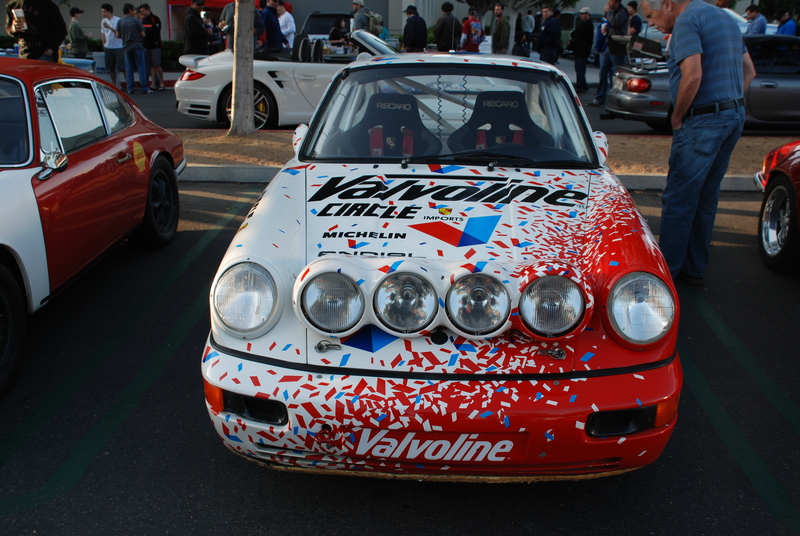 This particular car arrived at the event rather late, but made its presence known by virtue of its unrestricted headers, which delivered an amazing rumble as it rolled through the parking lot. 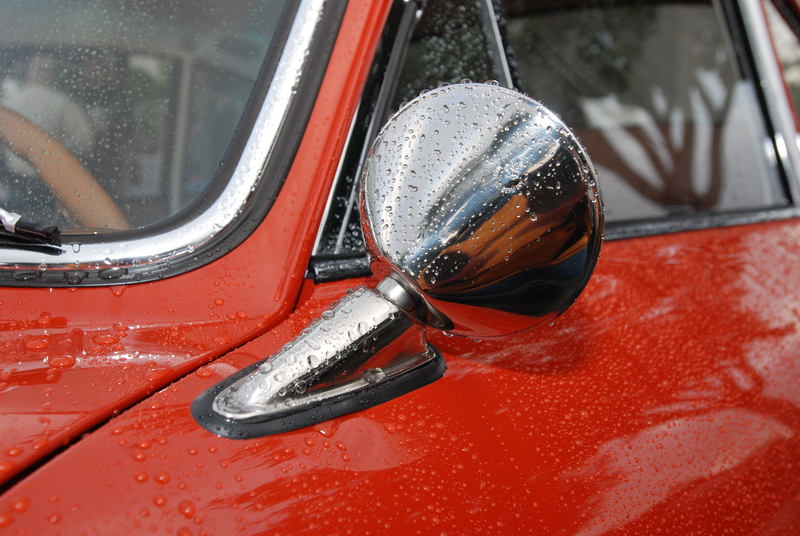 And as this photograph illustrates, the drizzle had stopped by the time this hot rod arrived, sparing the driver, his passenger and the car. 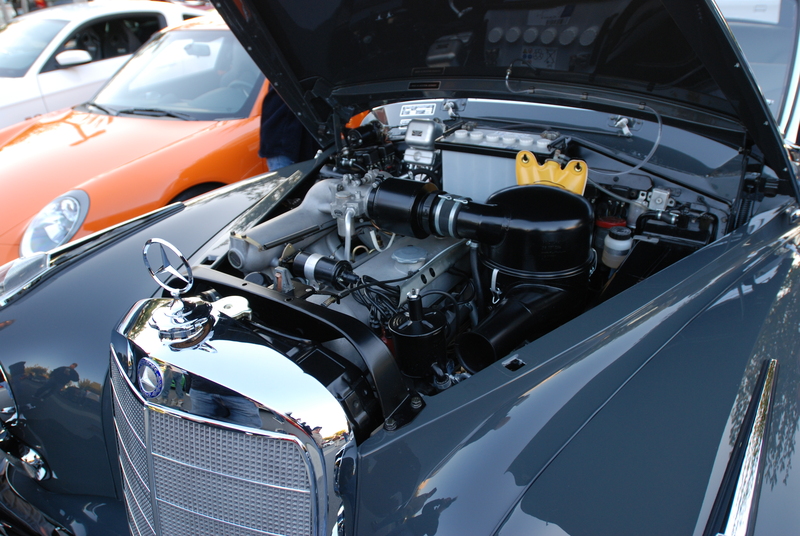 So should you ever experience an automotive breakdown as a participant at this event, rest assured that regardless of the make or model of your car, there will probably be someone close by with a working knowledge to assist you, and get you back on the road. 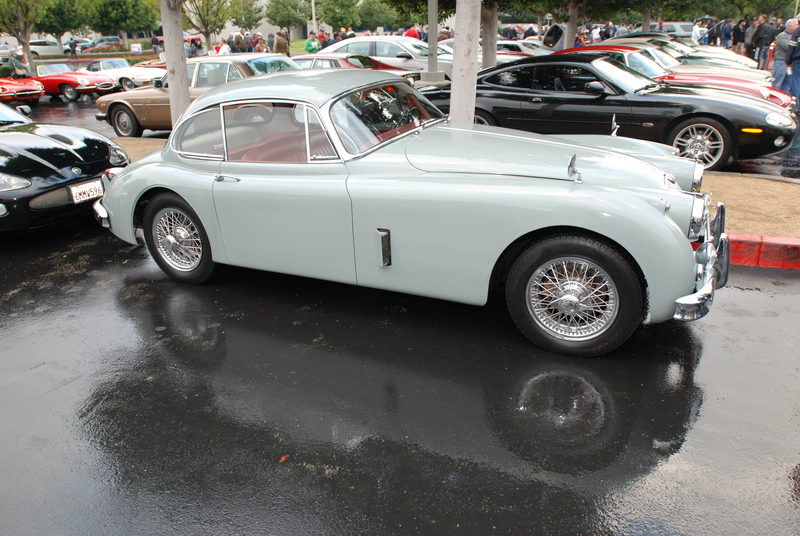 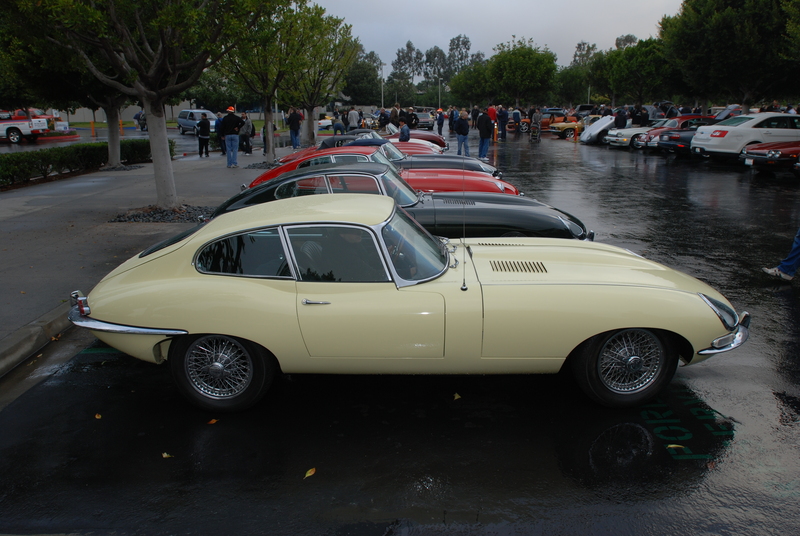 Once again the parking lot to the right of the main entrance was called into action to serve as the venue for a wide variety of Jaguar models, including an incredible array of XK and E-types roadsters and coupes, all on display as part of the clubs early morning get together. 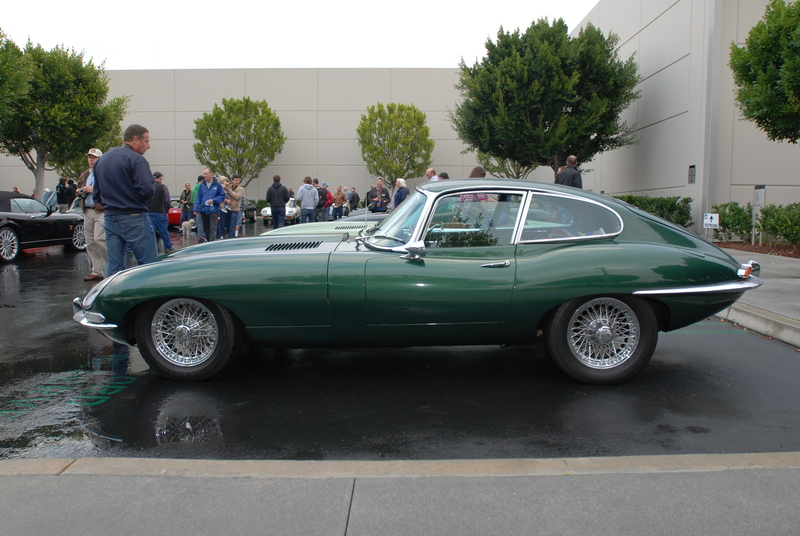 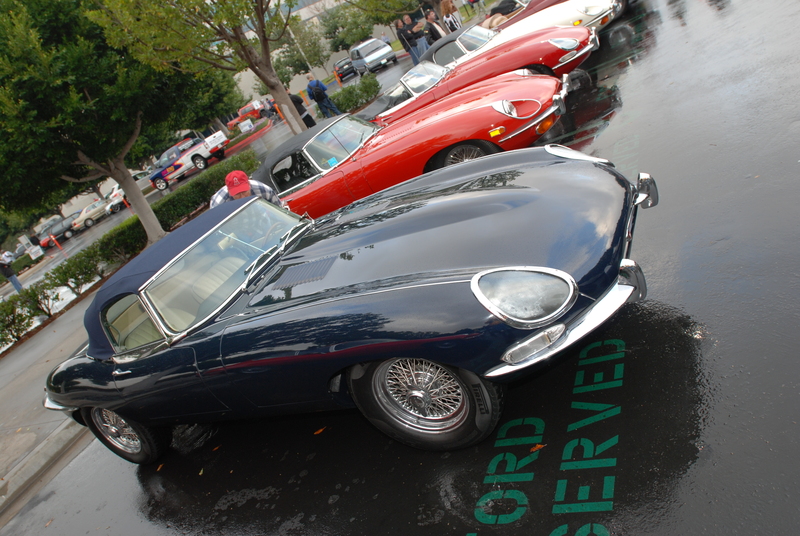 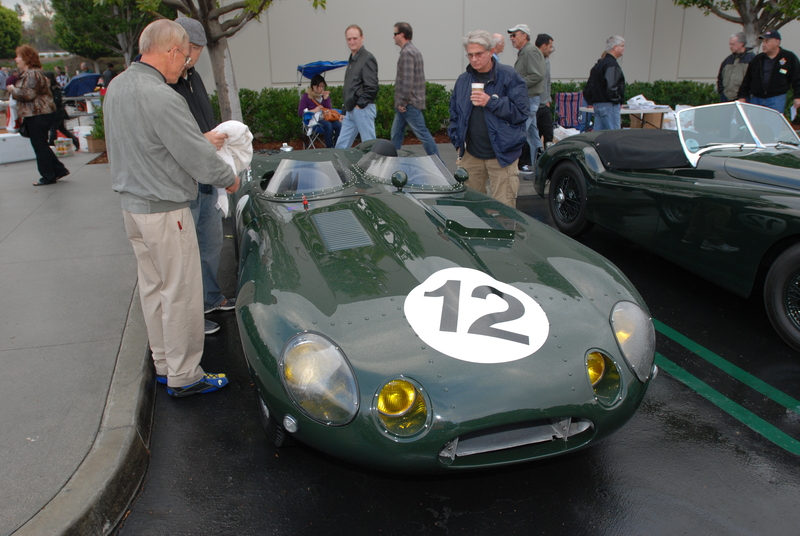 And then there were the E -type Jaguars; in an assortment of rainbow colors, lined up side by side… dark green, light green, metallic green, yellow, dark blue, red and white. 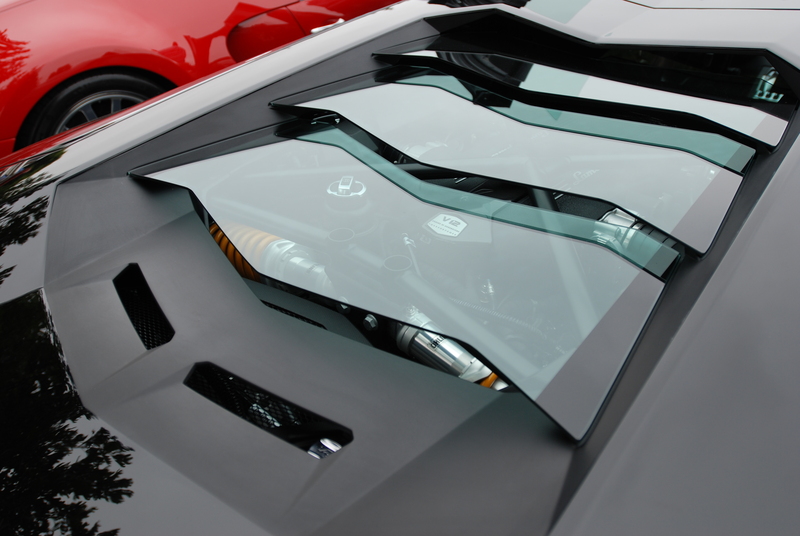 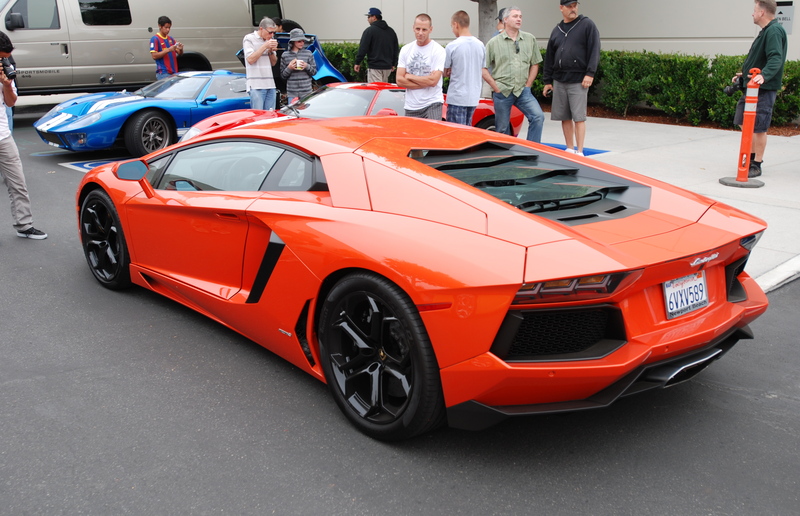 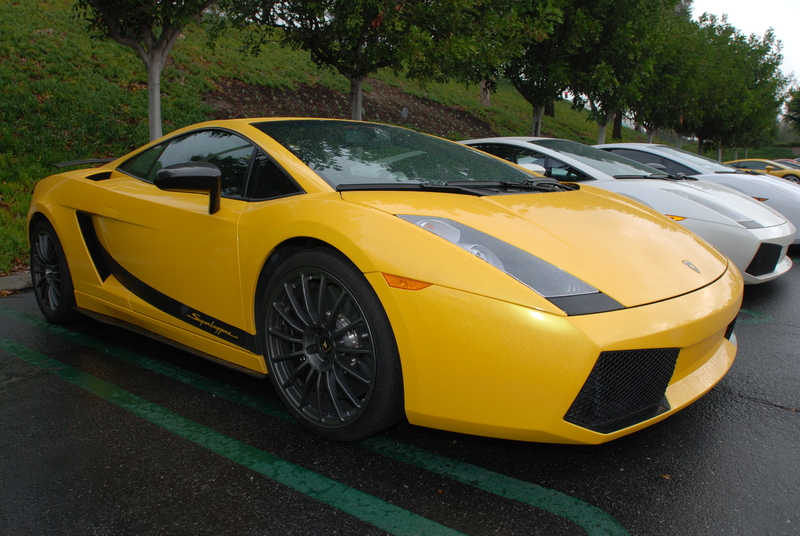 Then just as I finished shooting the Lamborghini’s, it started to drizzle again. 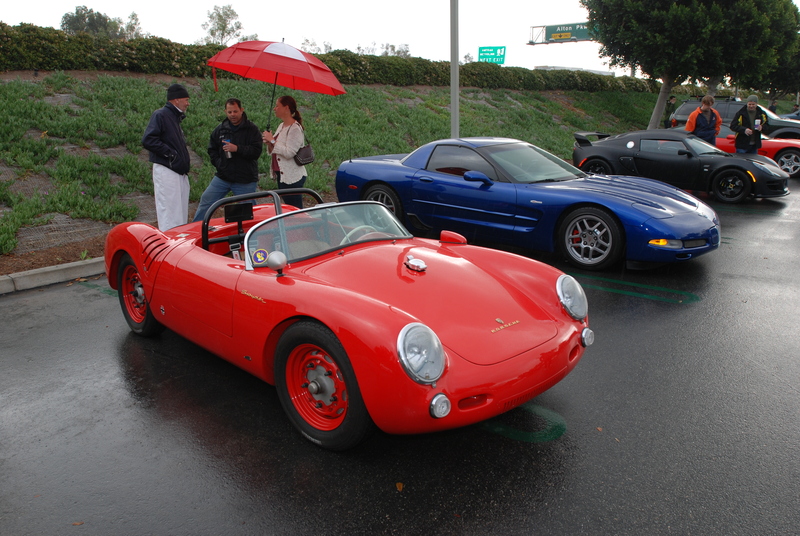 Out came the umbrellas (for those with umbrellas), and signaled to me it was time to head back to my car. 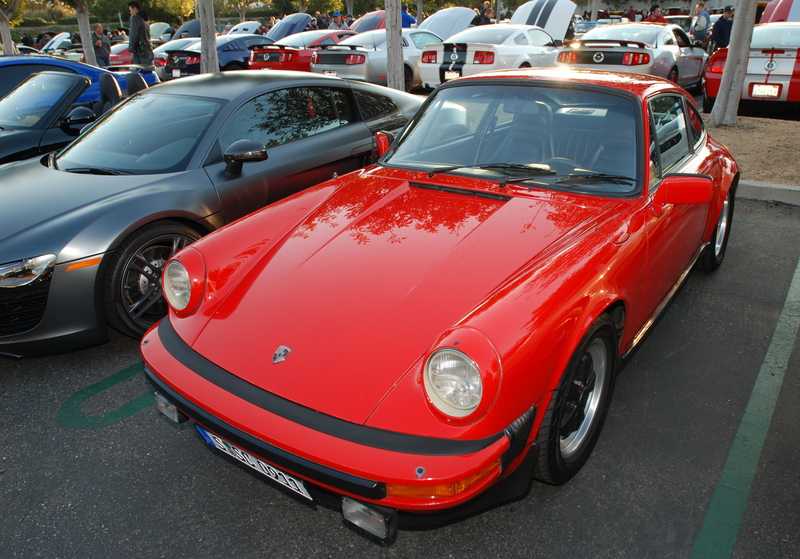 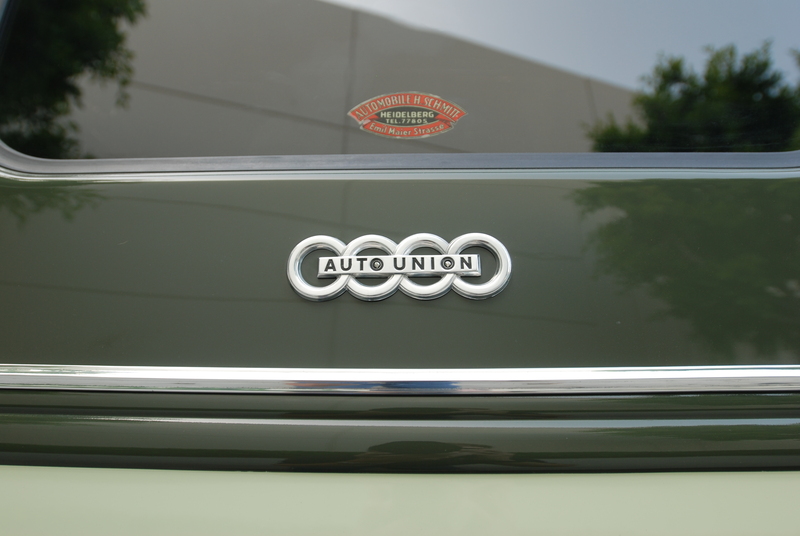 While watching Wednesday nights episode of “The Car Show ” on the Speed Channel, as host Adam Carolla set the backstory for this weeks show ( a road trip to Laguna Seca to race his vintage BRE Datsun, but dependent upon its restoration being completed prior to race day), he offered viewers a behind the scenes glimpse into his own garage, and some of the cars that make up his collection. 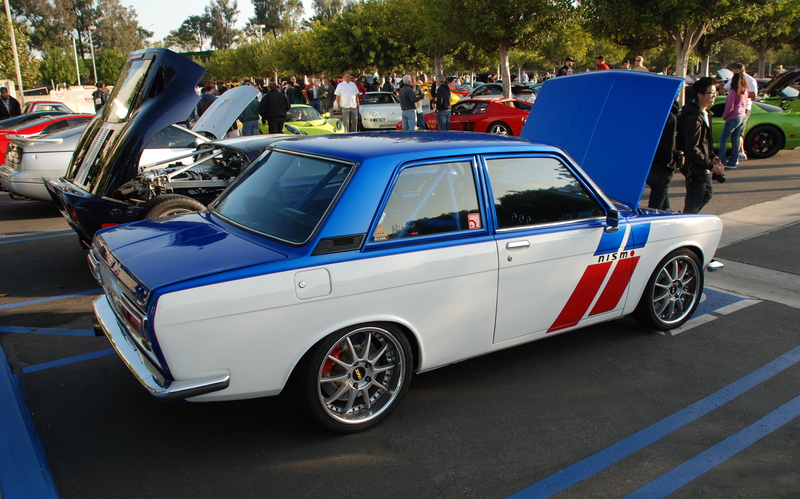 A considerable portion of his collection has been devoted to early Datsuns (prior to the makes re- branding to Nissan), in the form of 510’s, and 610’s as well as a few select 240Z’s (in IMSA trim) and several more recent iterations. 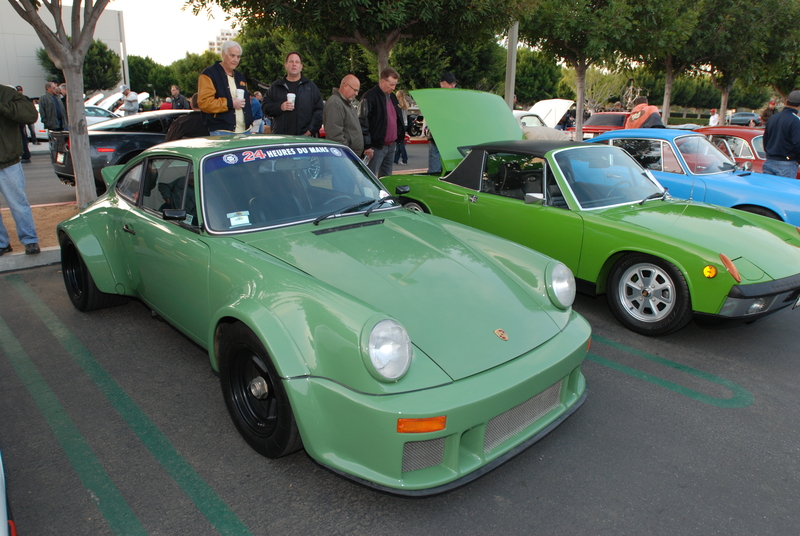 His builders of choice for vintage Datsuns are two of the best; Pete Brock of BRE Datsun fame, and Bob Sharp of Bob Sharp Racing ( the builder and race car provider to Paul Newman ,and the cars he drove to many a victory and sports car championships. 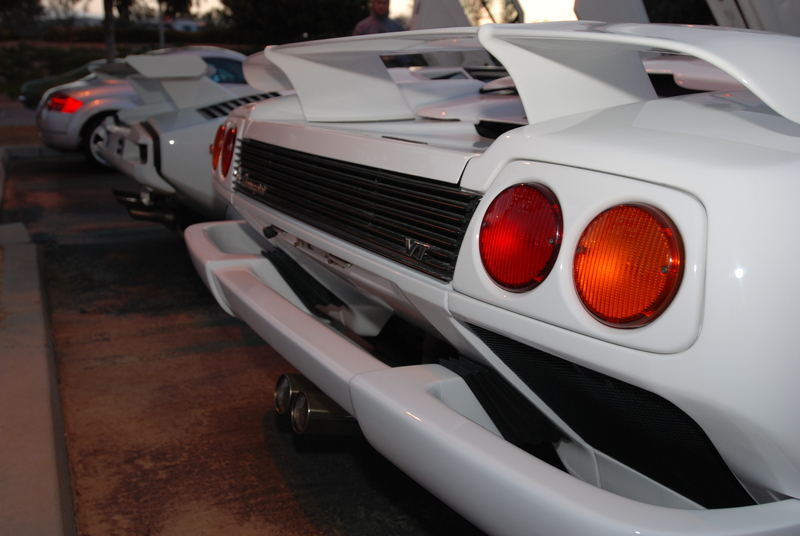 Back in the day, these two were the benchmark their competition measured themselves against. 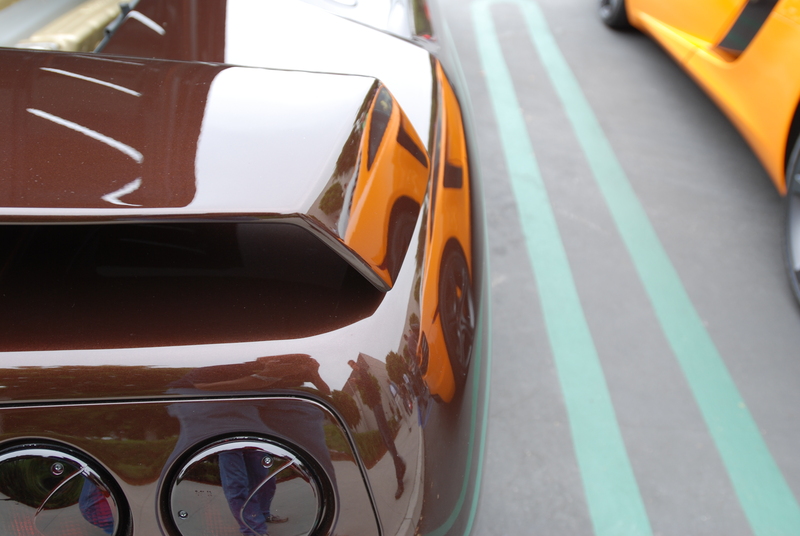 It was during his garage tour that Adam Carolla’s focus shifted over to a make of car that I never knew he had any interest in. 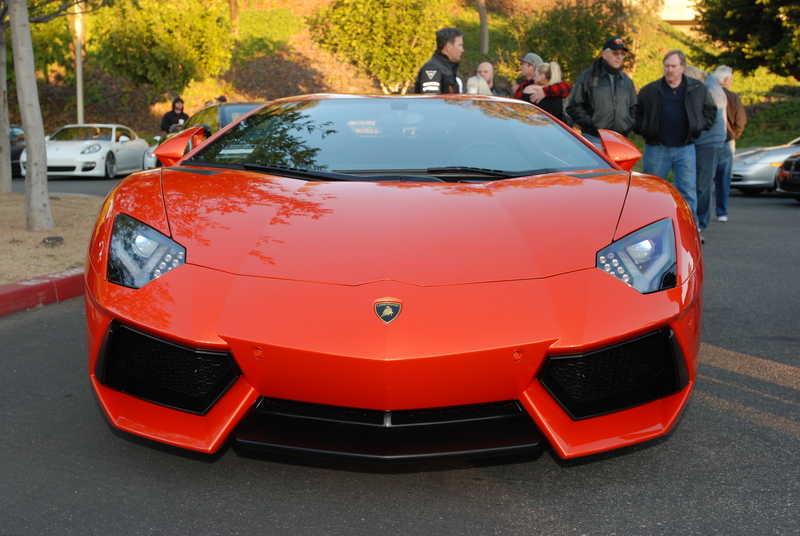 So imagine my surprise when he began to talk about Lamborghini’s. 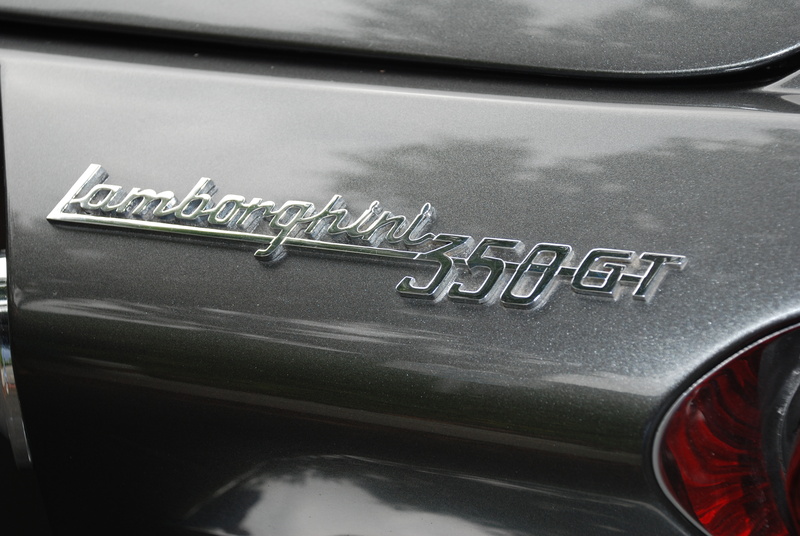 The camera panned across what appeared to be a mid 1965-66’s Muira, but the car that he stopped at and appeared most passionate about was his 1964 Lamborghini 350GT. 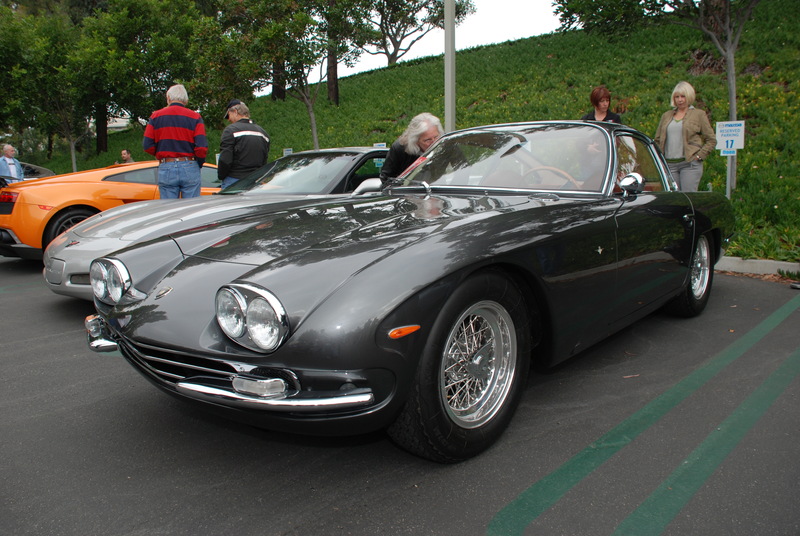 He told the story of how the 350 GT was the very first production model for Lamborghini ( only 120 , 350 GT’s were built from 1964 to 1967), and this all came about became of an argument that Mr. Lamborghini had with Enzo Ferrari regarding Ferrari’s cars. 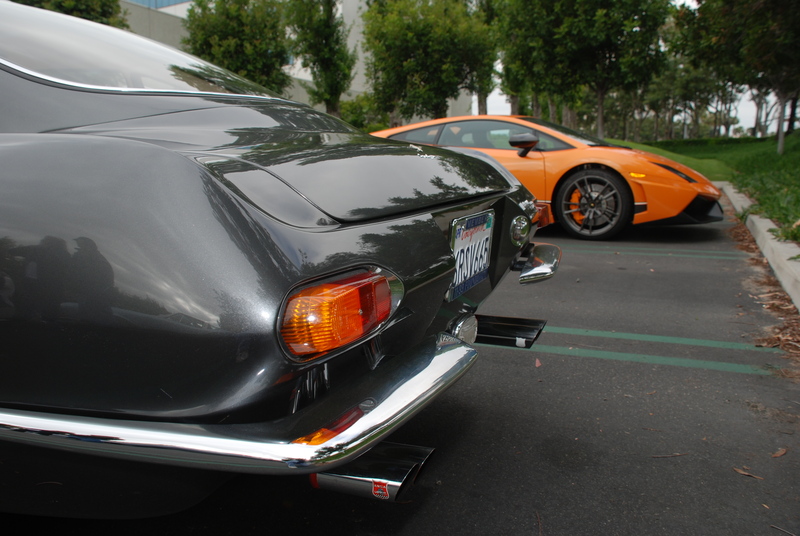 As legend has it, Mr. Lamborghini was so enraged by Ferrari’s comments, that he vowed to beat Ferrari at his own game. 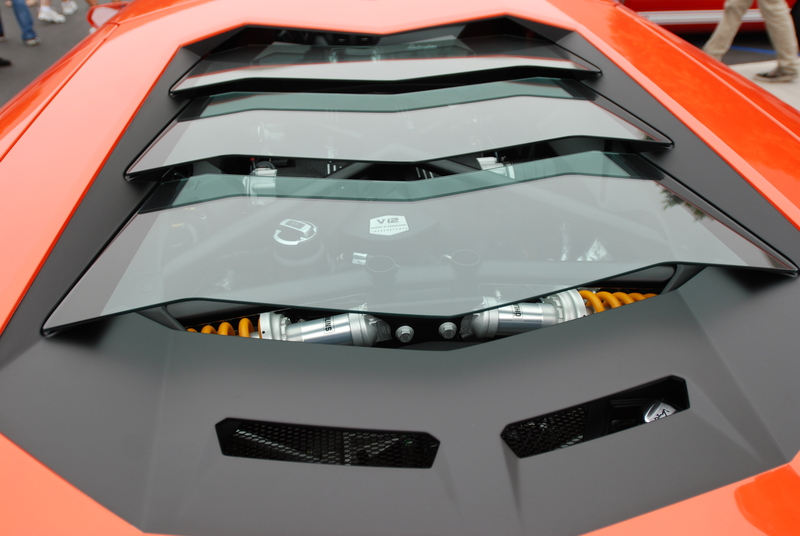 Lamborghini was a manufacturer of tractors at the time, and so decided to shift his focus to the production of an rival Italian automobile. 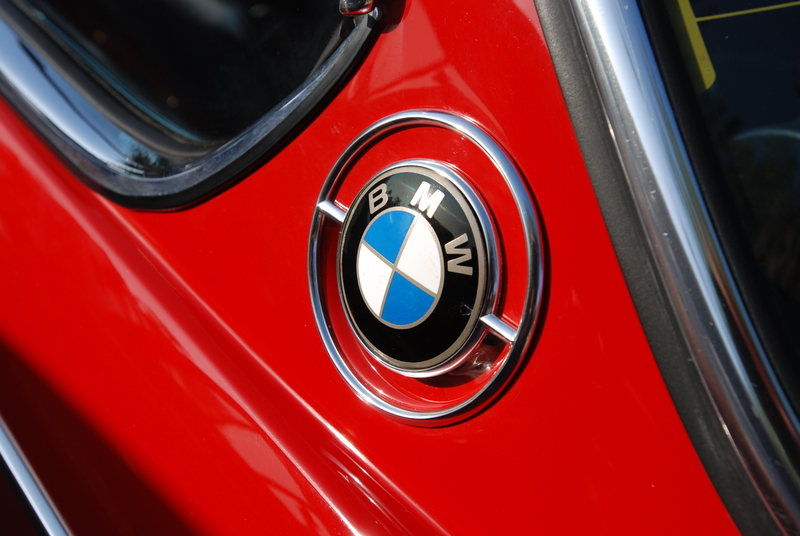 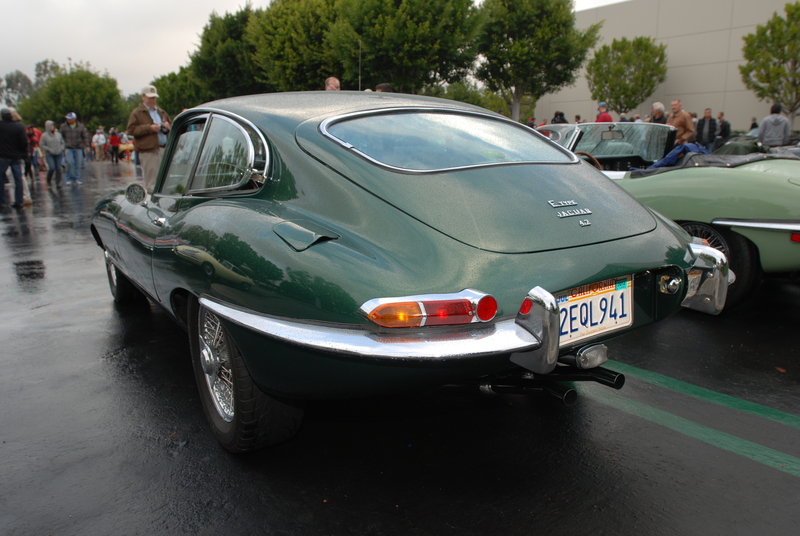 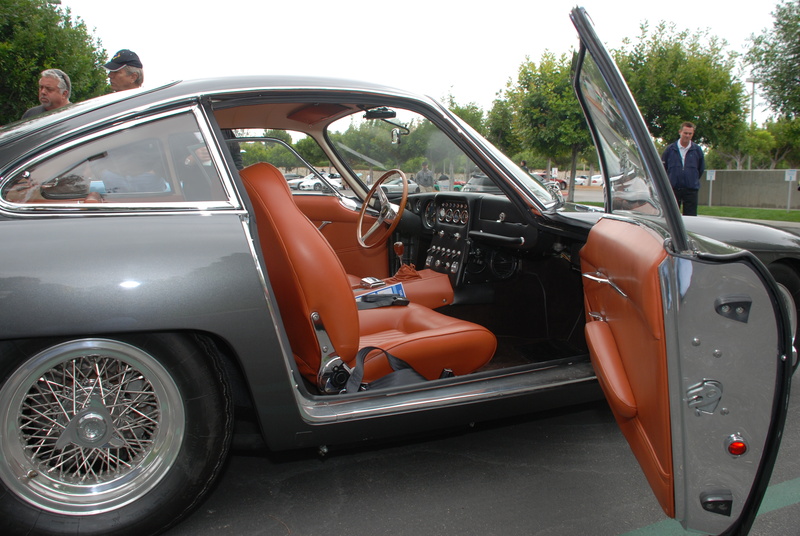 Thus the inspiration behind his very first production model, the 1964 350 GT. 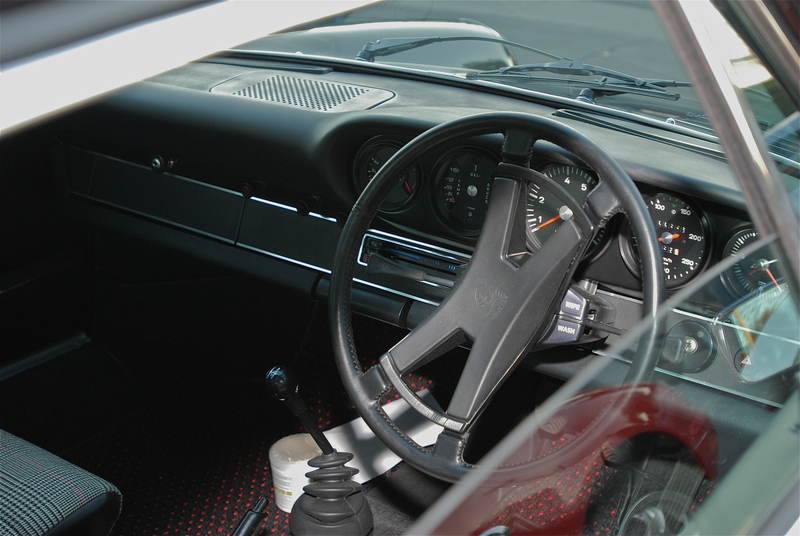 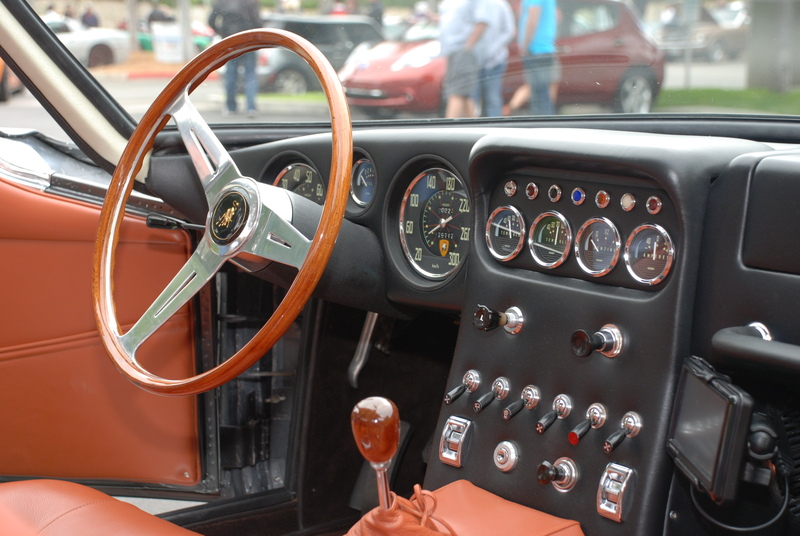 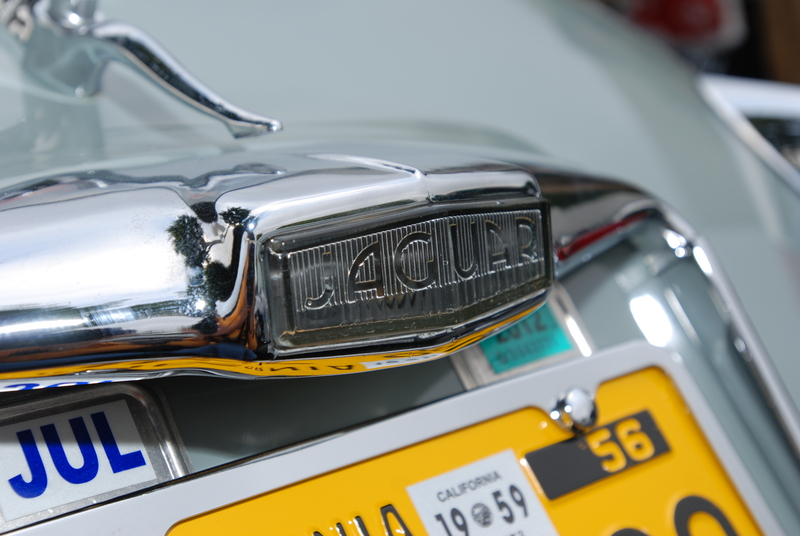 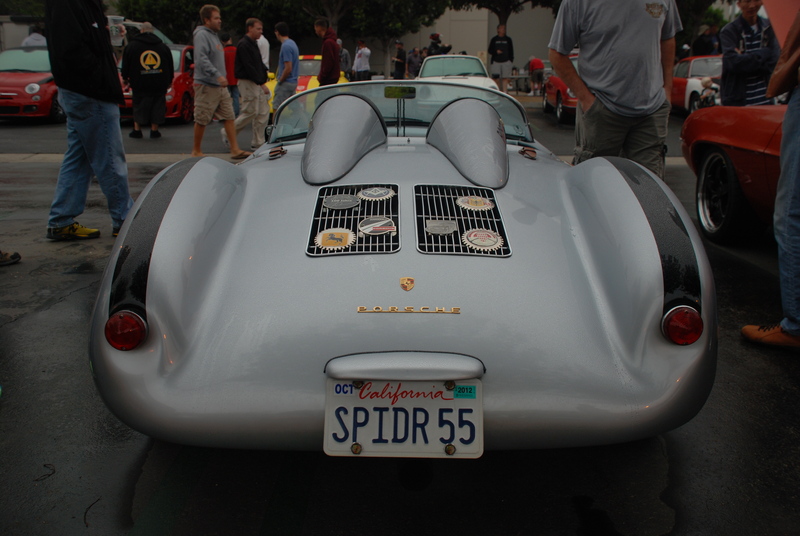 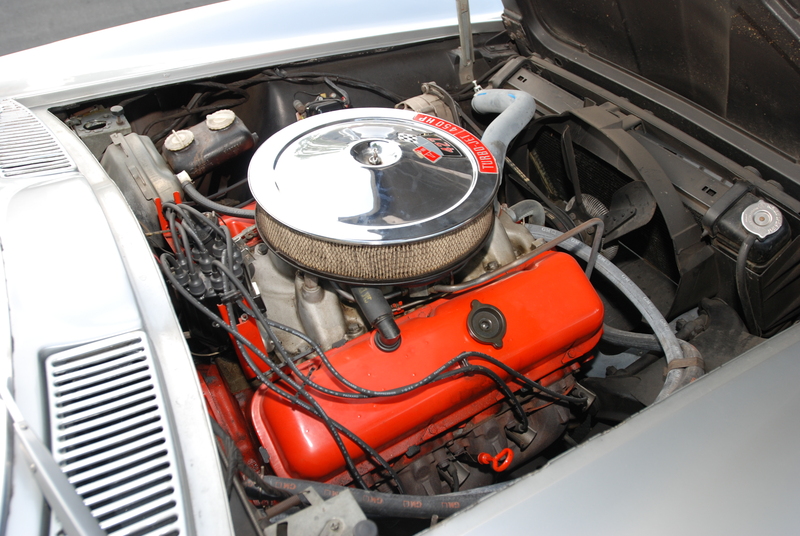 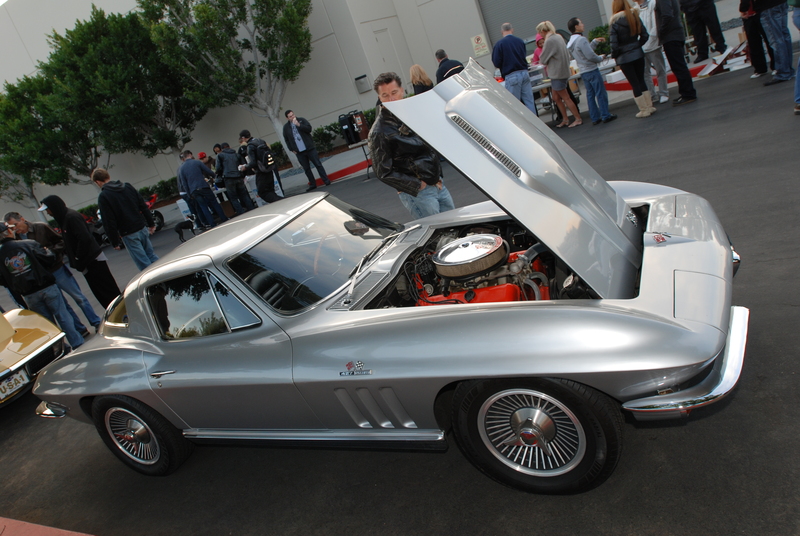 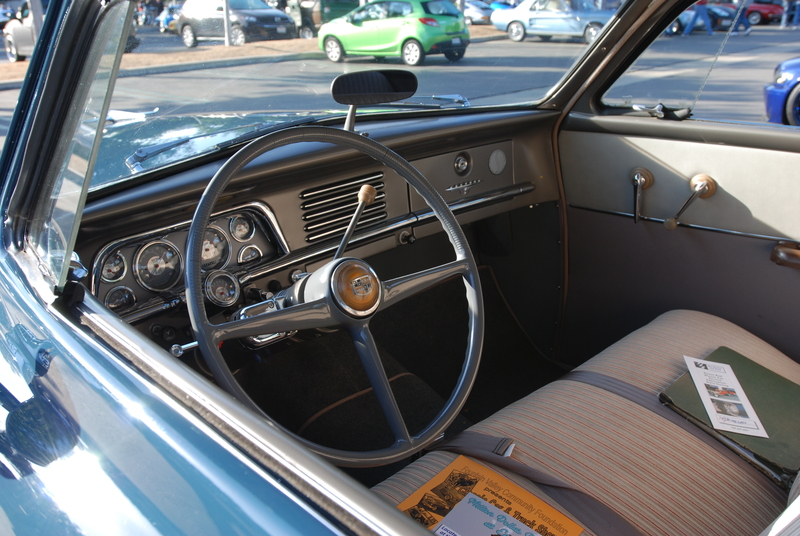 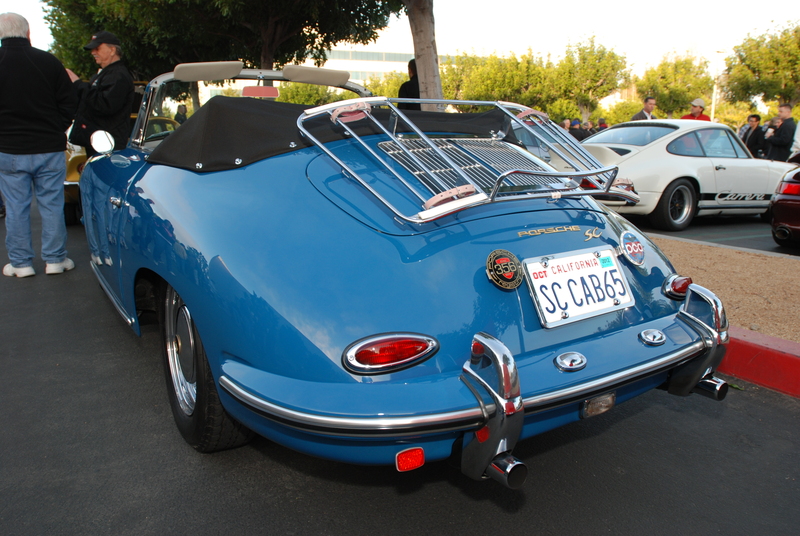 Adam Carolla went on to describe his attraction to this particular model, and pointed out the many unique design and styling cues found on the car, as well as many of the finish details that looking back were quite rare and unique for 1964. 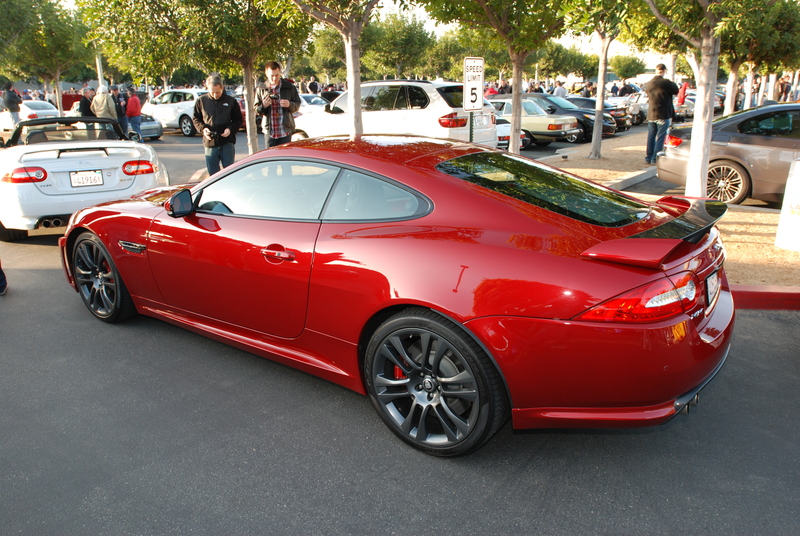 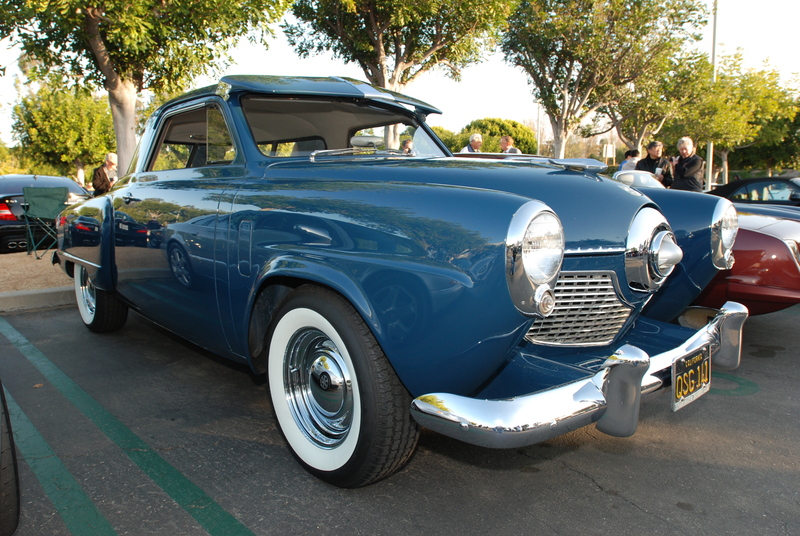 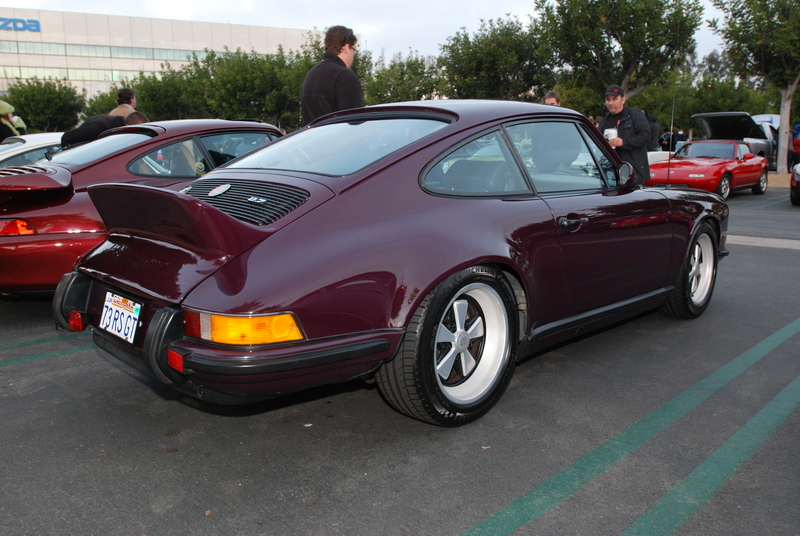 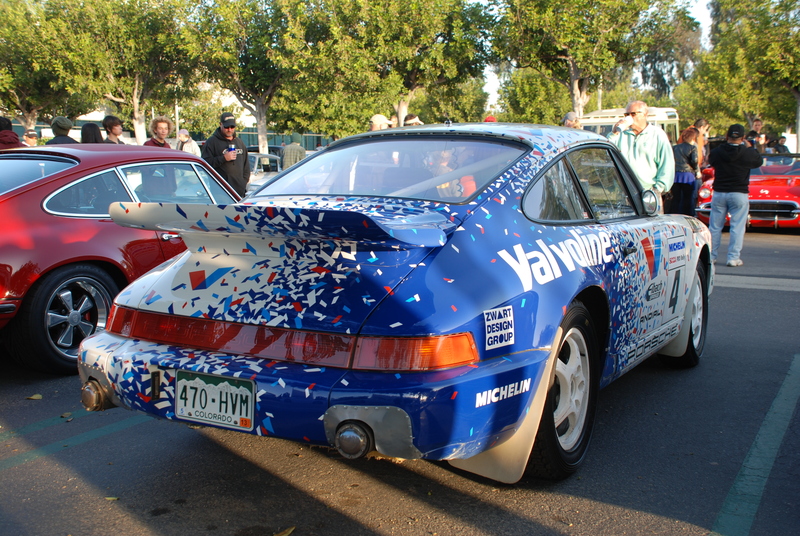 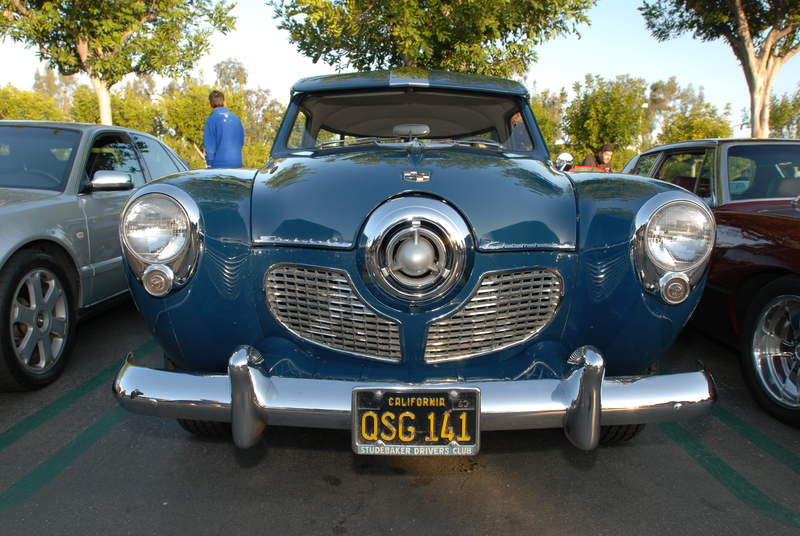 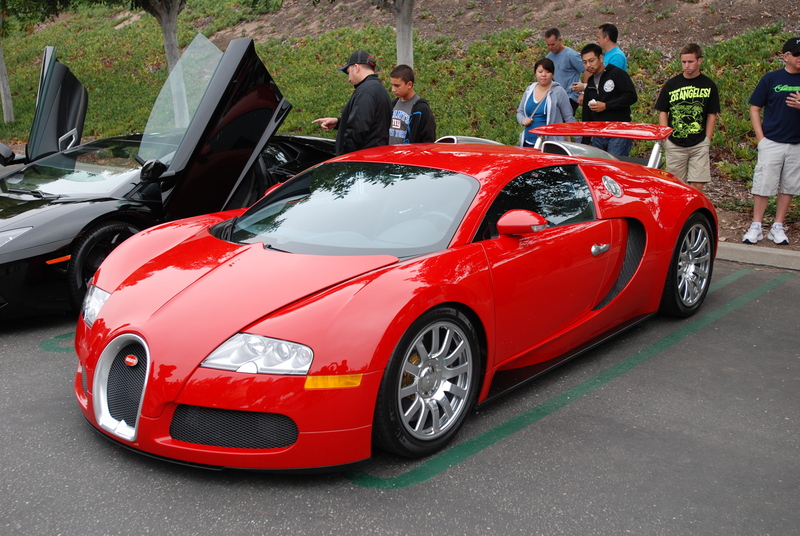 His car was a beautiful example of this particular model, and even more amazing given it’s rarity. 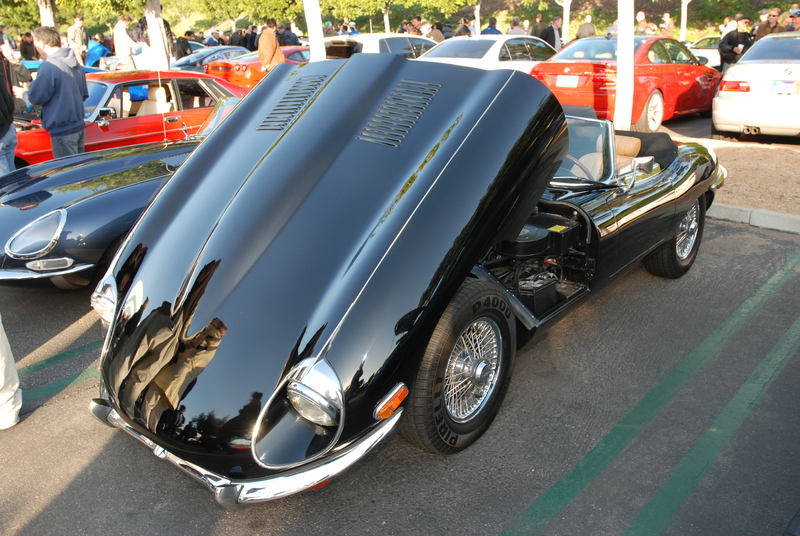 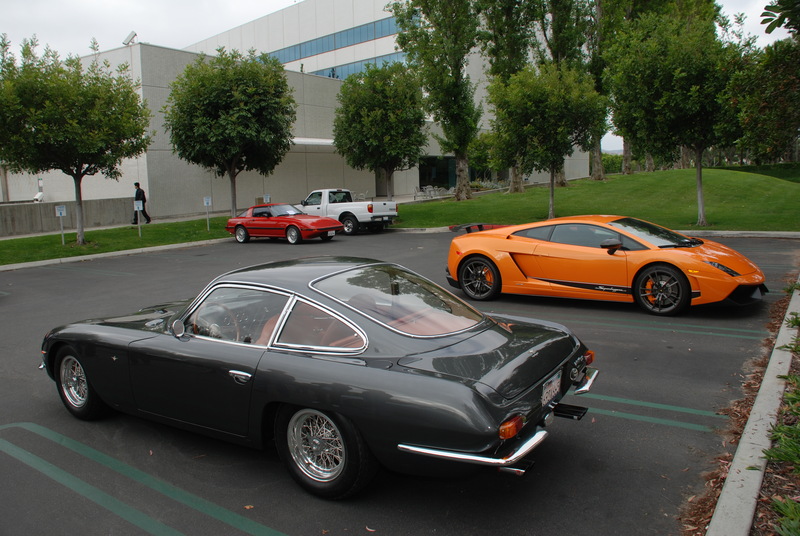 But for me what was even more incredible about that moment was that back in June of this year, I had the pleasure of encountering my very first Lamborghini 350 Gt in person, one early Saturday morning at Cars & Coffee, in Irvine, California. 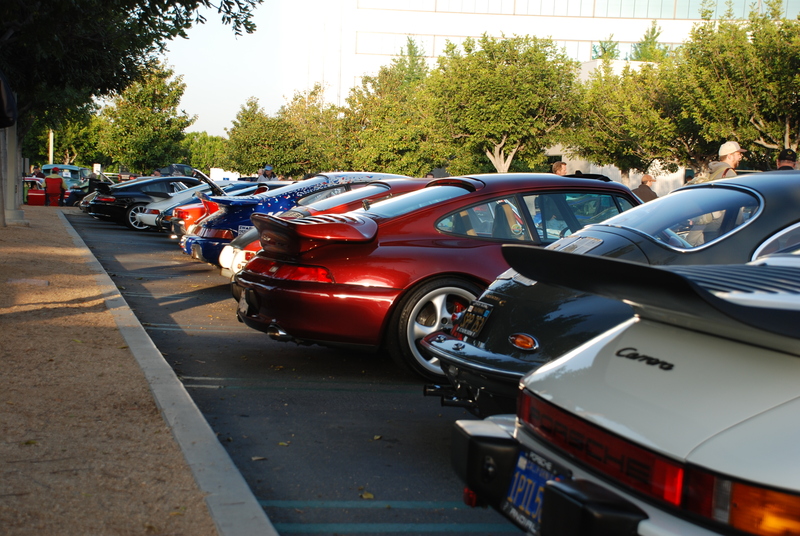 Tucked away on the very last row of the main parking lot, and settled in amongst corvettes, Porsches, and Austin Healeys sat this hidden jewel. 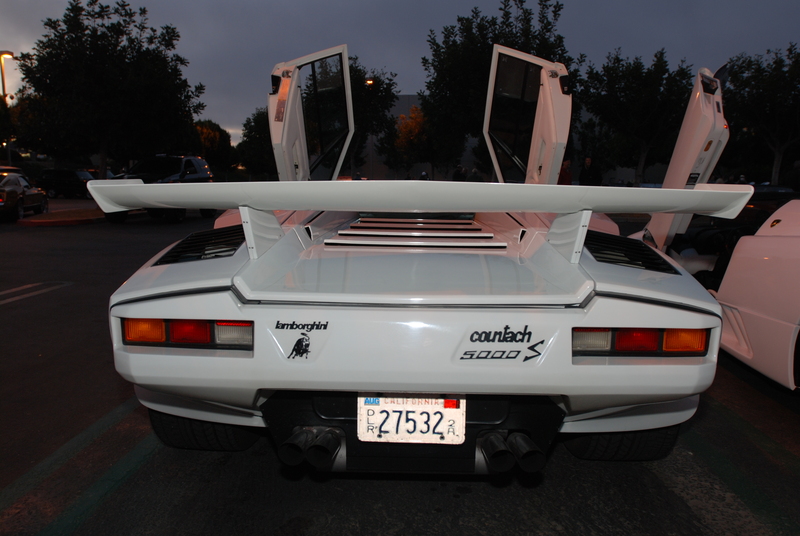 As I approached, all I knew was that it appeared to be european and was incredibly cool. 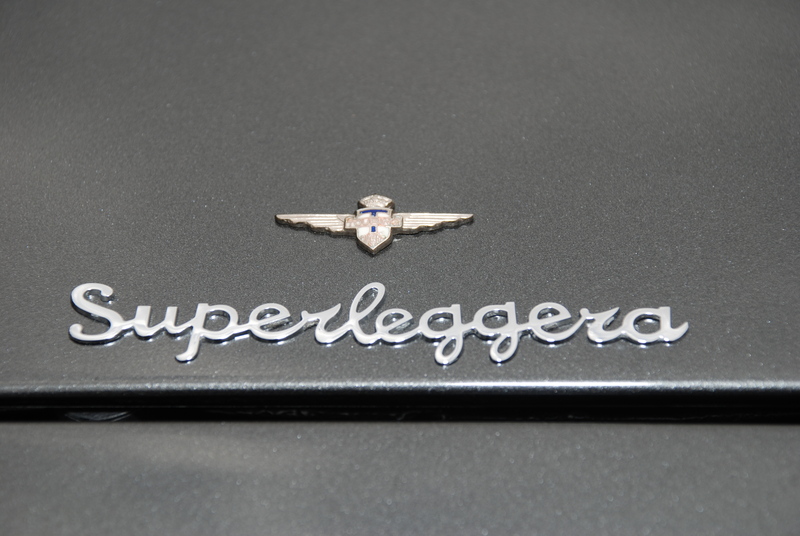 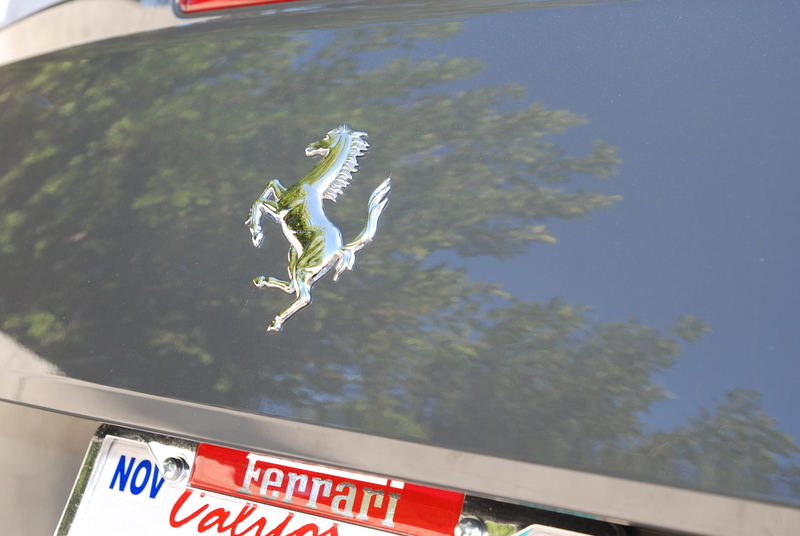 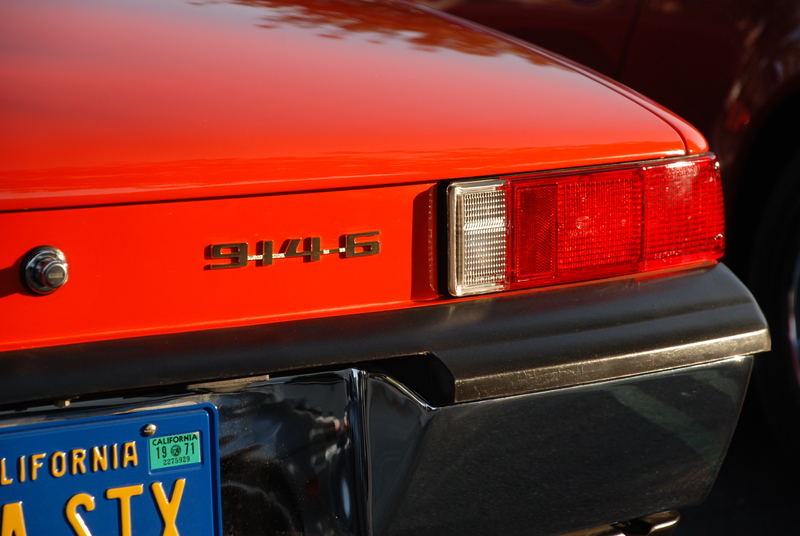 Close up, I quickly realized that it was in fact Italian, and after a quick review of several of the badges, I became clear that this was in fact a Lamborghini, complete with Superleggeria badging. 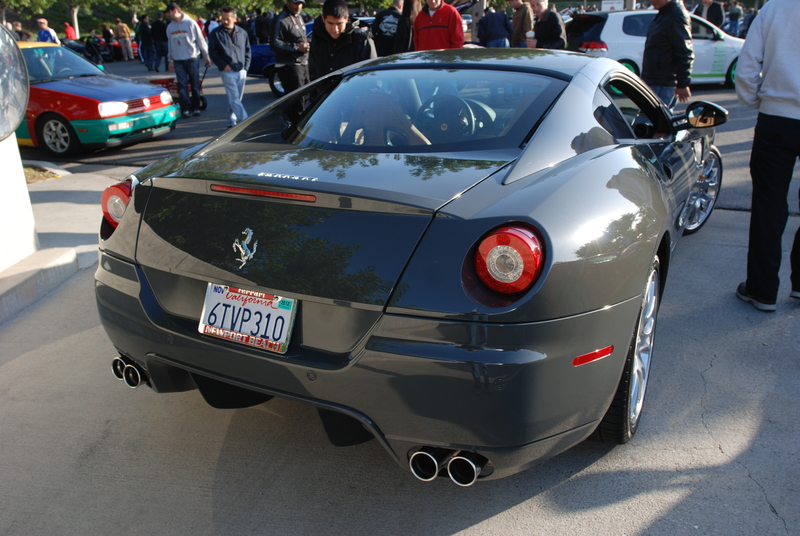 And out back , located near the right taillight was the 350 GT emblem. 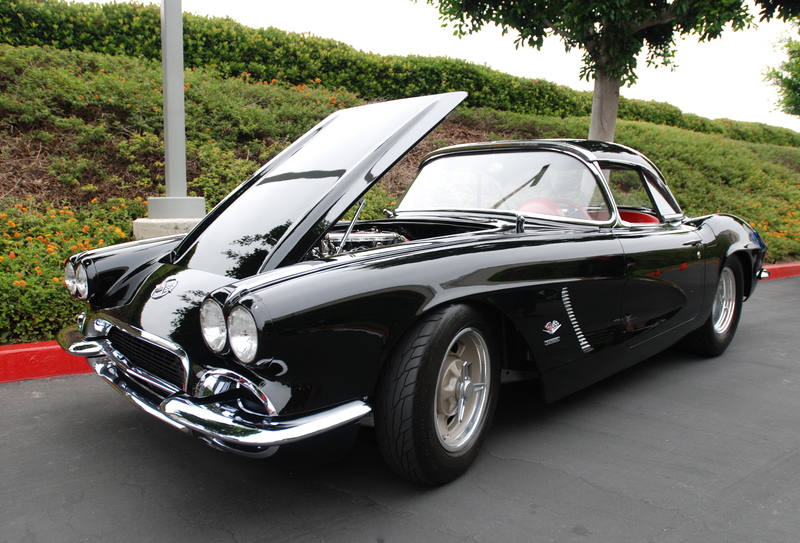 I knew this was a classic, possibly late 50’s, early 60’s but still had no idea as to the actual year. 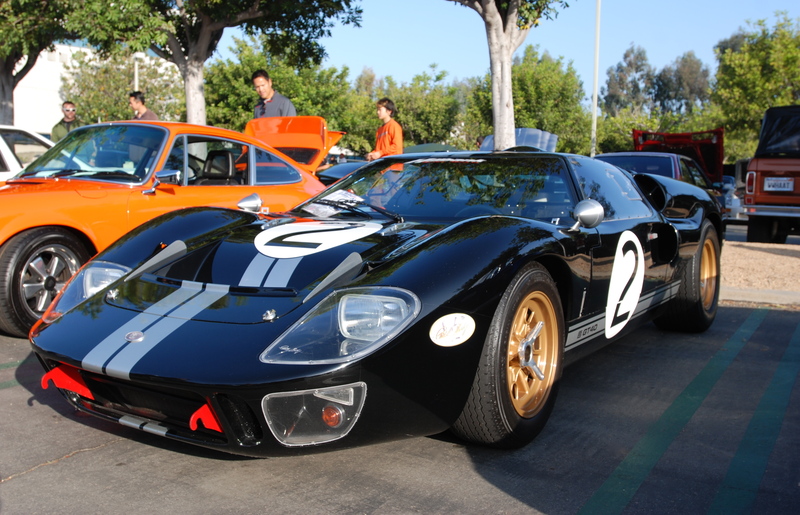 As I began shooting pictures of this stunning car, I overheard several people asking questions of an older gentleman standing by the drivers side of the car. 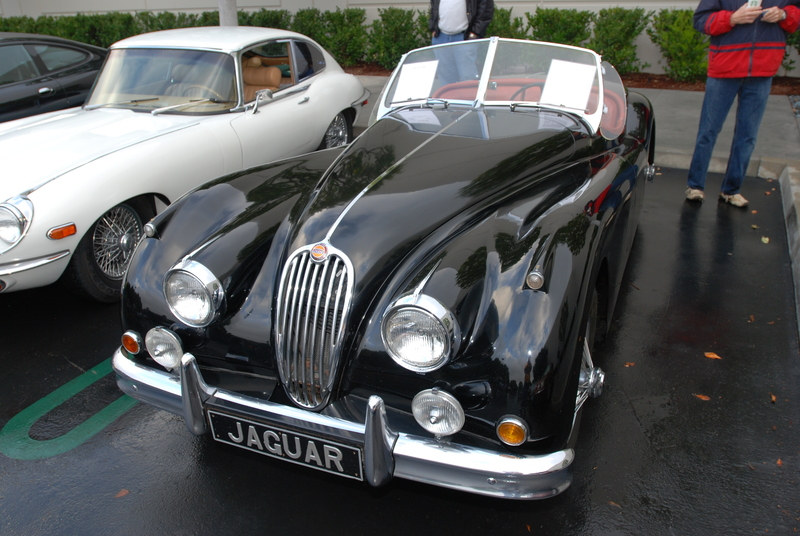 The older gentleman turned out to be the owner, who proceeded to share the story of how he came to own this particular car. 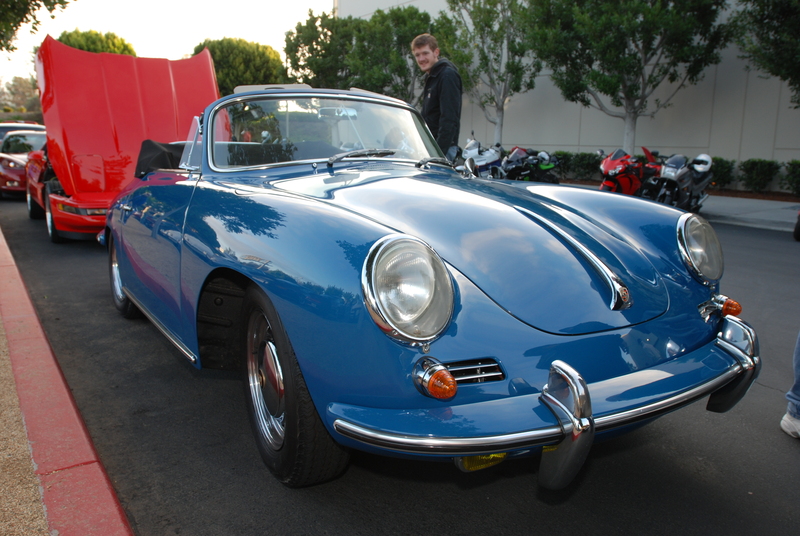 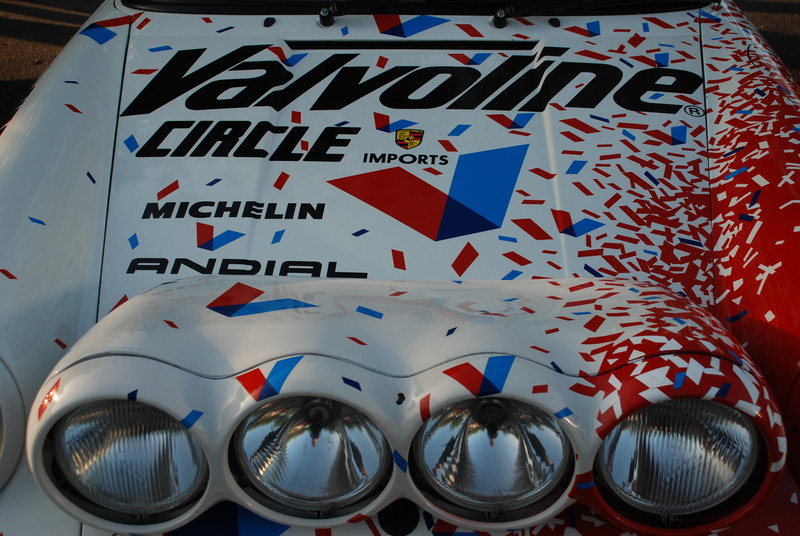 Apparently, the present owner had rescued it from a French body shop, where it had been hidden away, in hibernation for the past 20+ years. 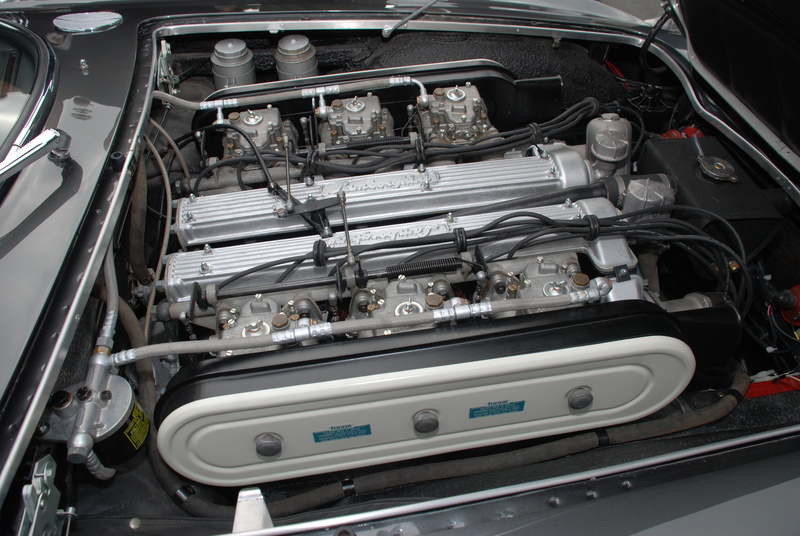 Once the 350 GT was stateside, a sympathetic, yet thorough restoration began. 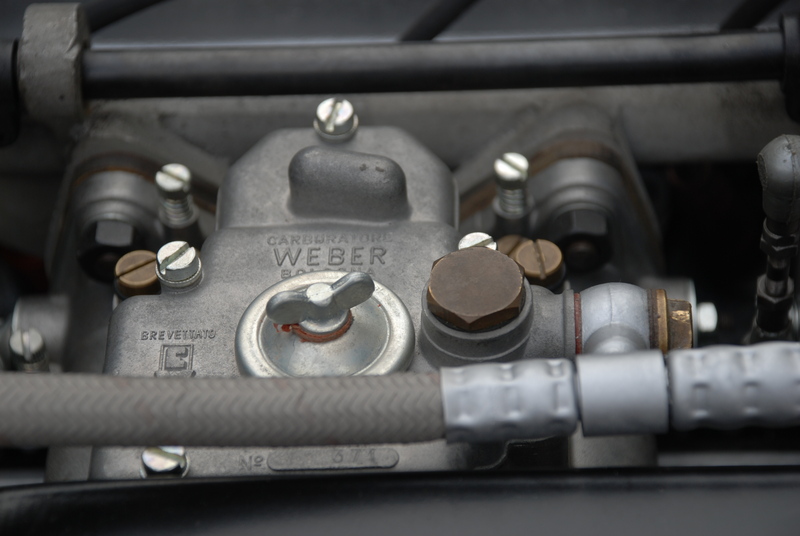 Parts were disassembled, cleaned and reassembled. 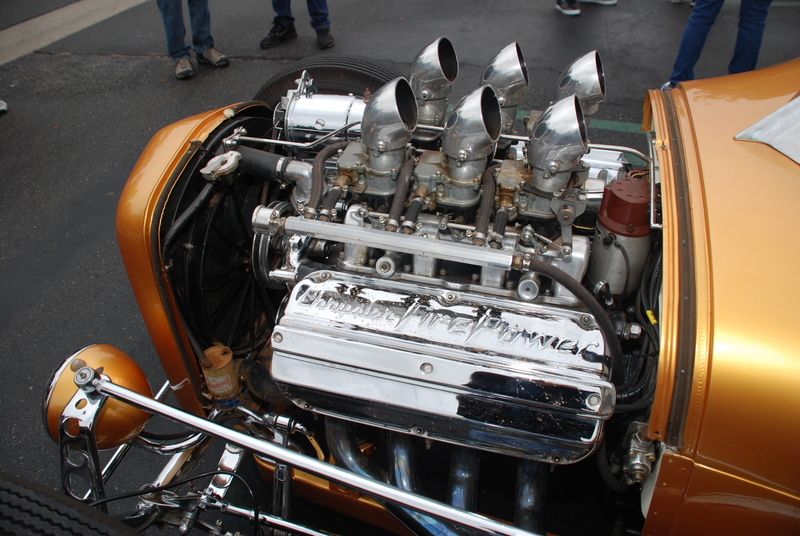 In regards to the motor, the owner said they did a compression check, and proved to be well within specifications. 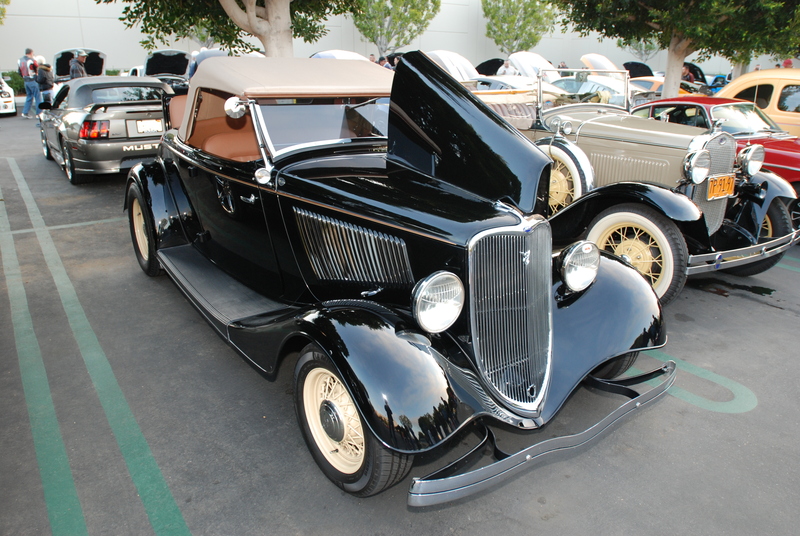 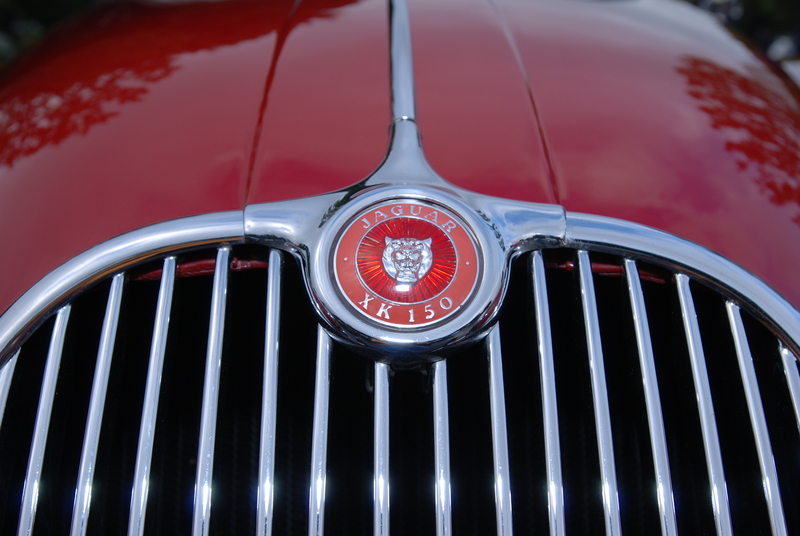 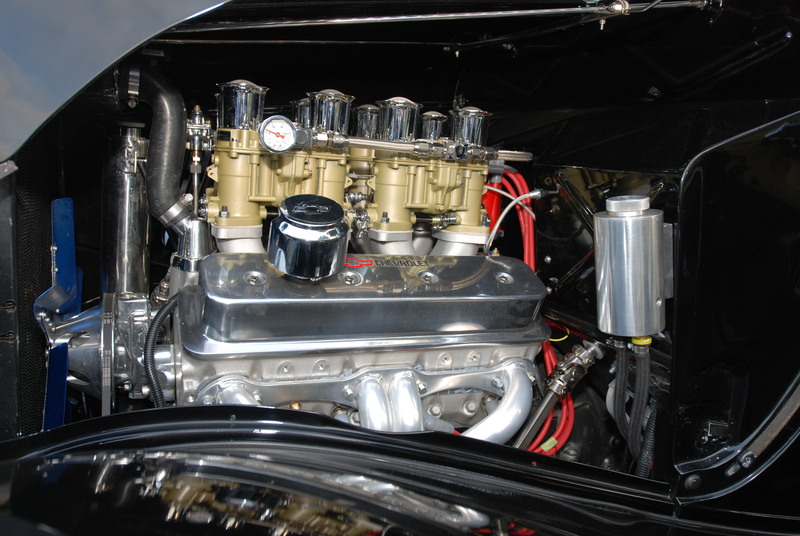 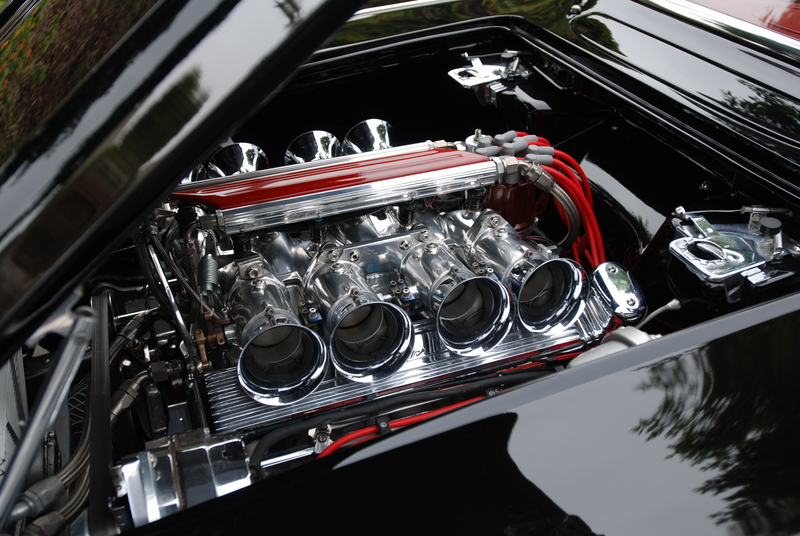 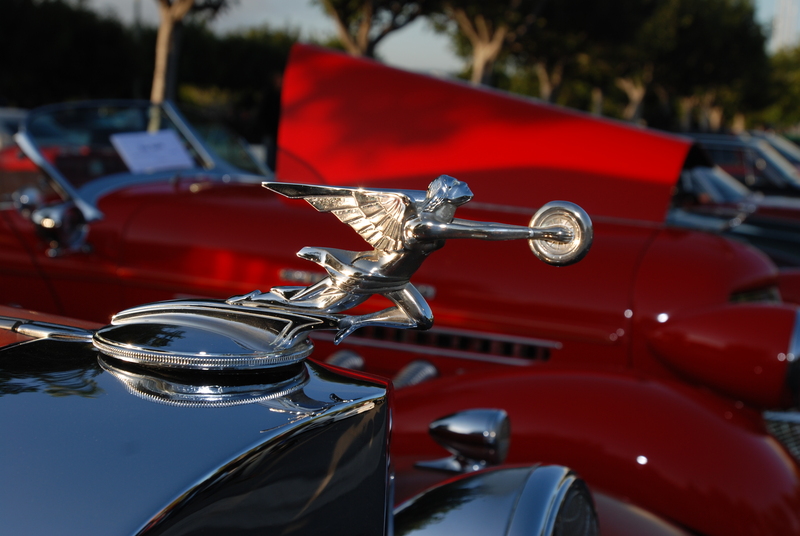 Because the motor was original, and of low mileage, his experts felt a rebuild would be unnecessary So instead, they simply cleaned and detailed the motor and decided to replace any of the gaskets or parts necessary to get the car up and running. 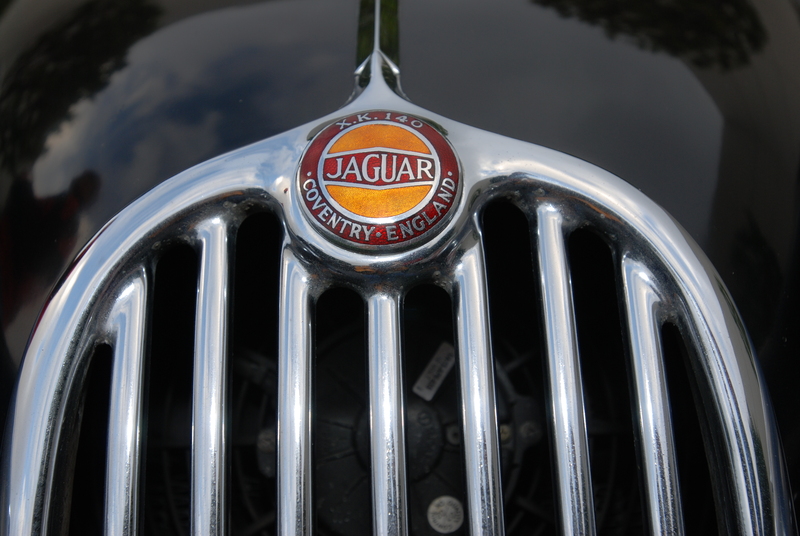 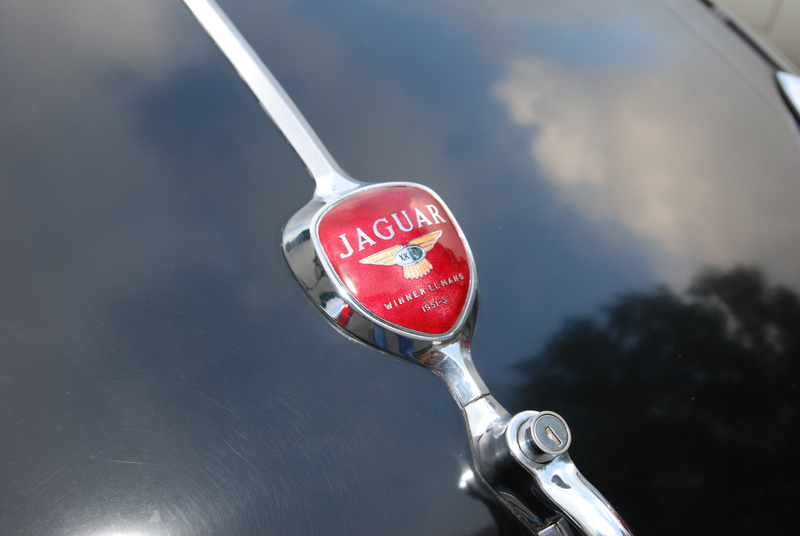 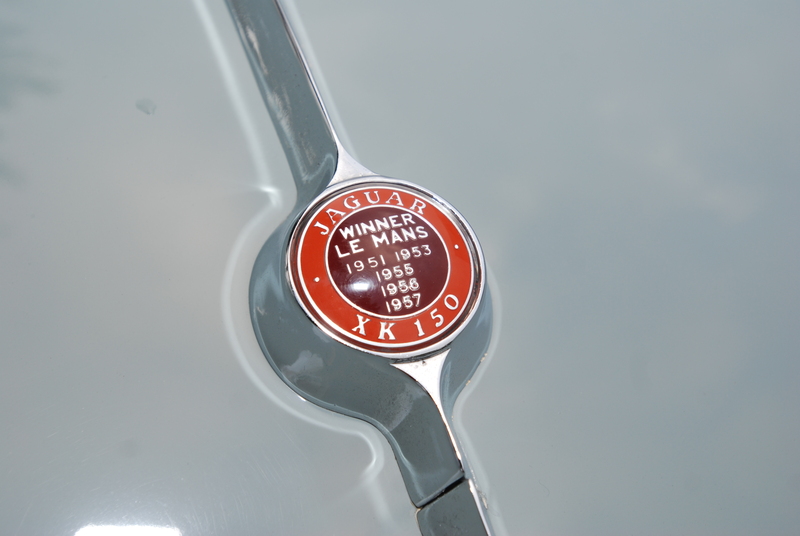 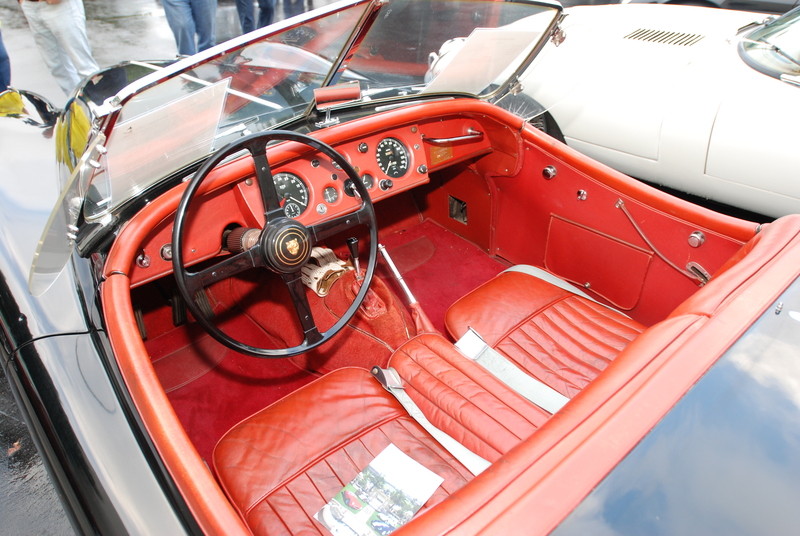 The remainder of the car was just as stunning as the motor had been; the body and paint were just as flawless as was its beautiful leather interior. 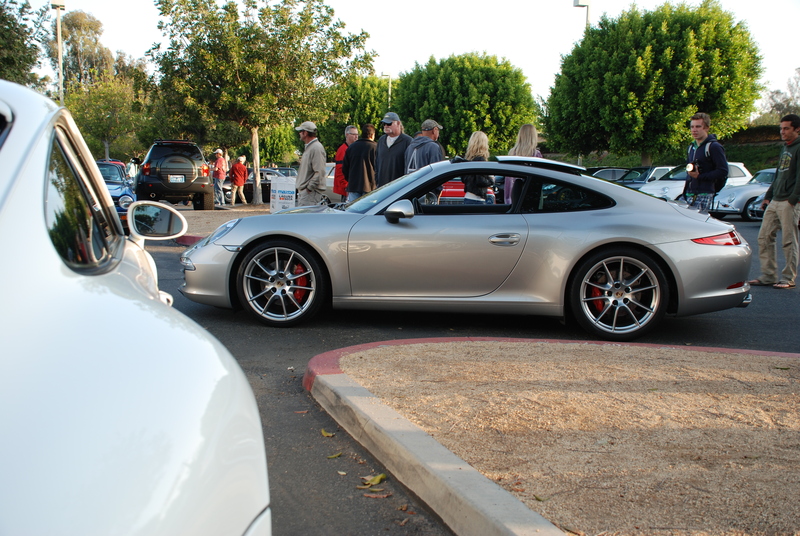 The intoxicating combination of its medium gray metallic exterior, combined with the terracotta leather put all of the other cars parked in proximity to shame. 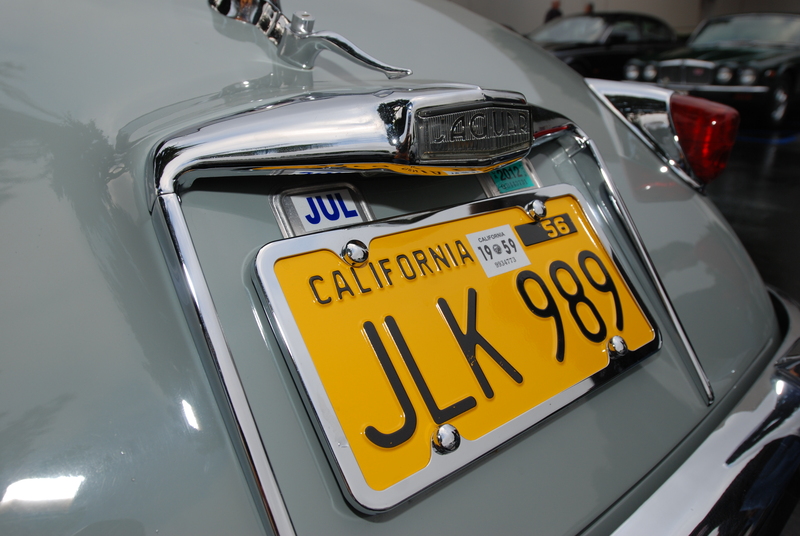 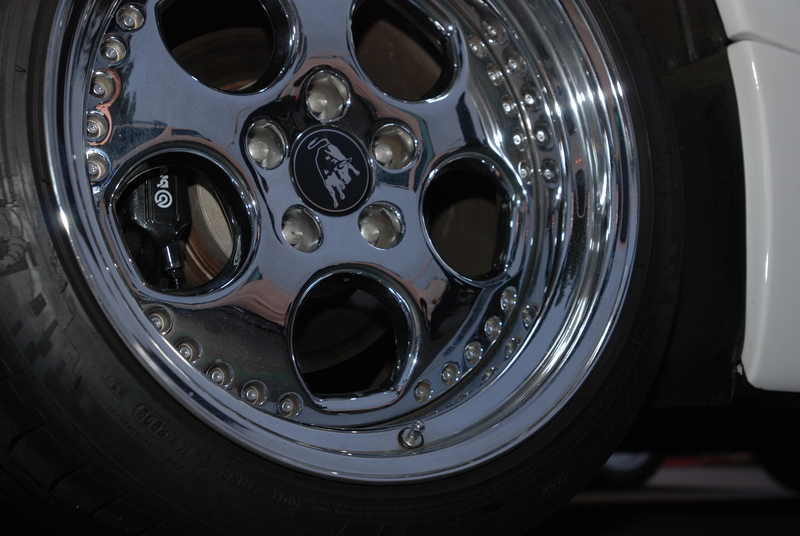 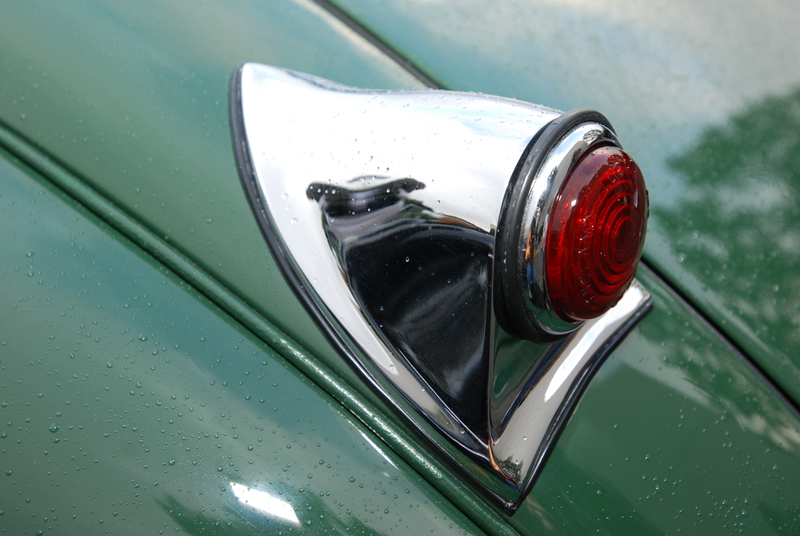 And then there was the chrome; from window trim to bumpers to the Borrani wheels, it was all magic. 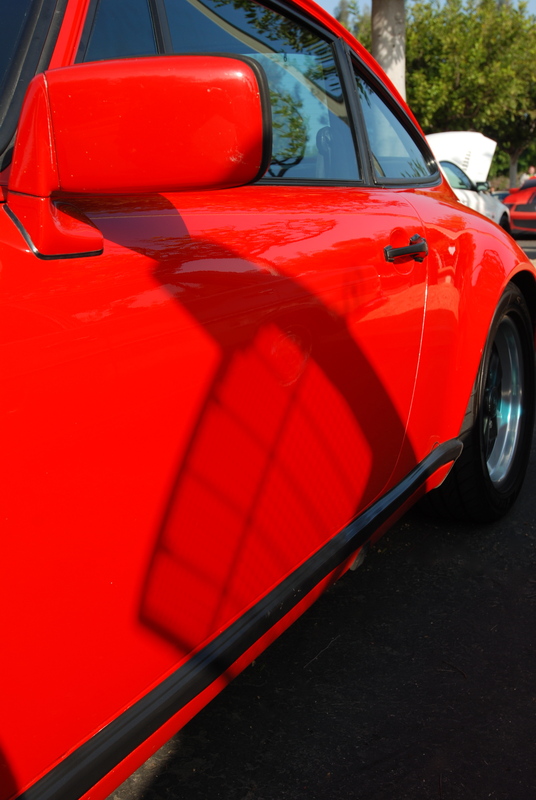 And the last part of his story was just as compelling as was the start. 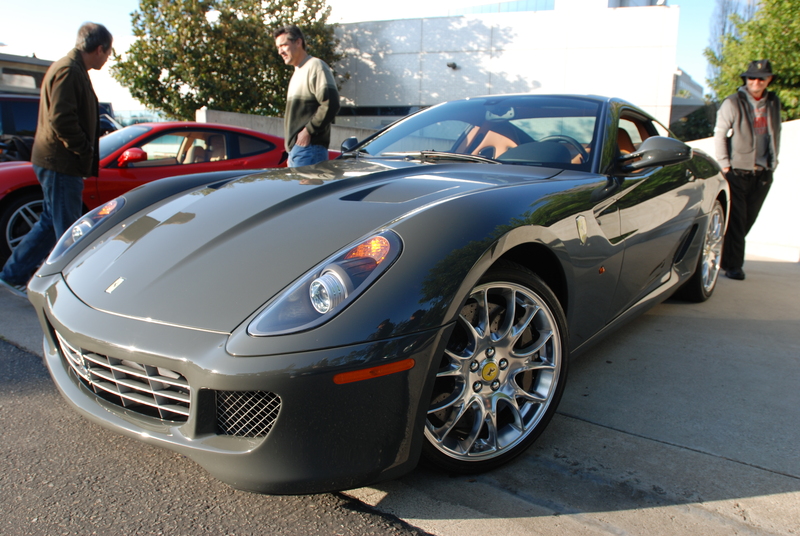 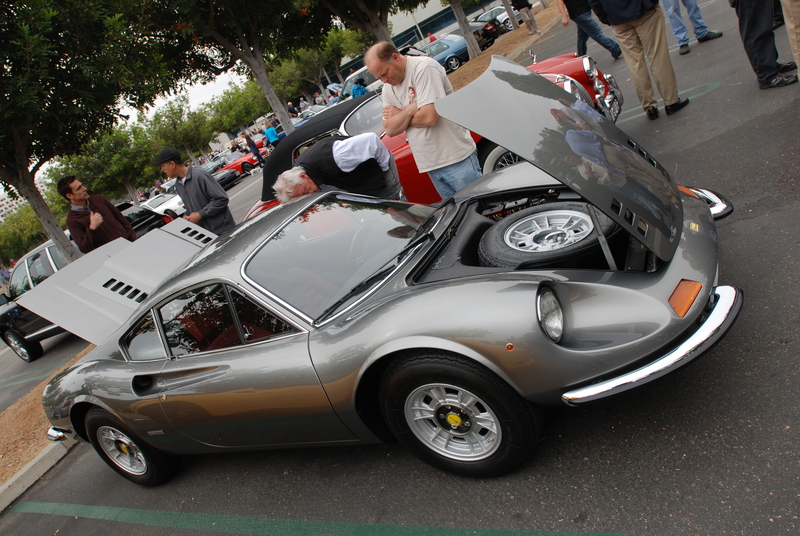 He revealed that his participation in that weeks Cars & Coffee event was in fact the 350 GT’s debut. 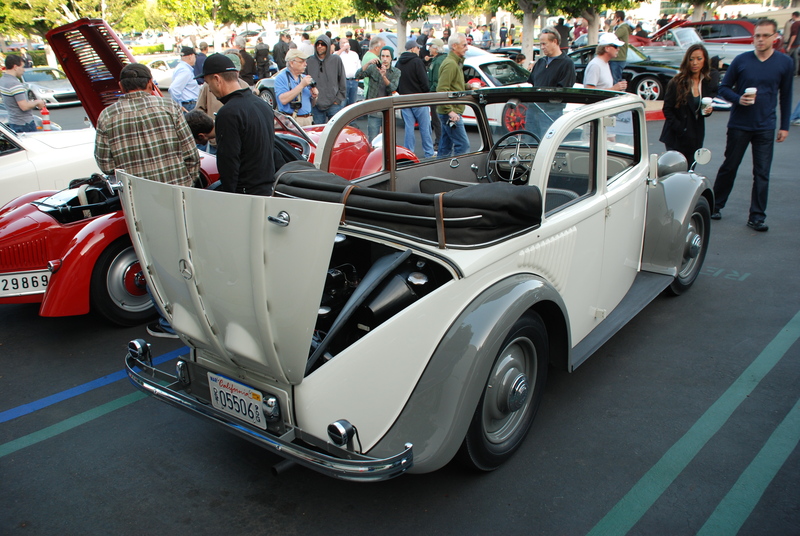 This had been its first shake down run, and the owner laughed that with less than 100 miles run so far, all systems were functioning and that nothing had fallen off yet, so all was good. 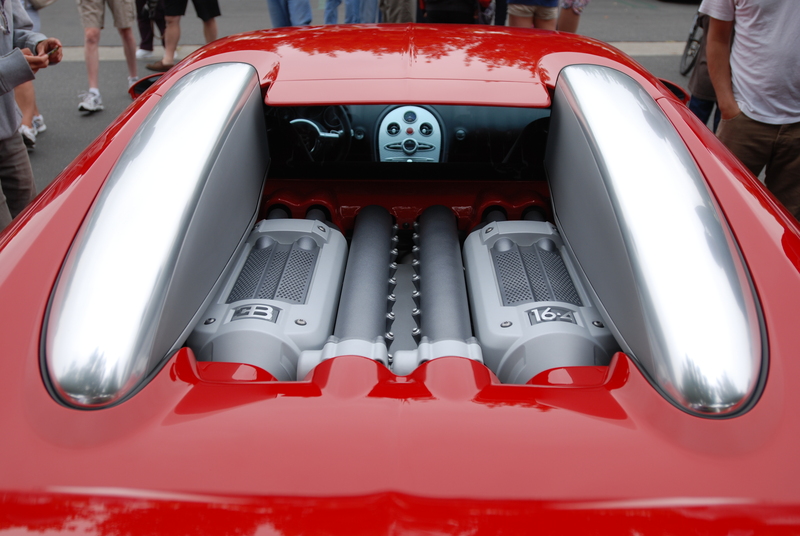 With that closing comment, the owner got behind the wheel, fired up the melodious 12 cylinder motor, and drove off to enjoy the rest of his Saturday. 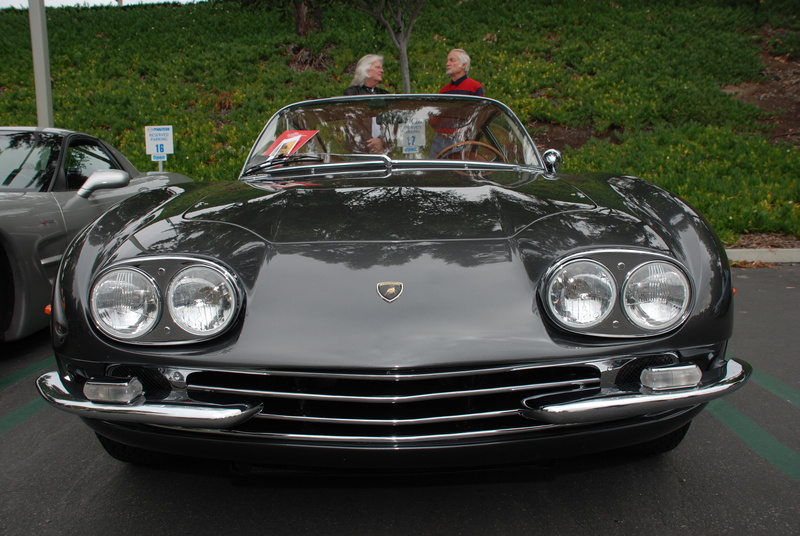 For me, I left that morning with a new found appreciation for the 1964 Lamborghini 350GT, “La Bella Machina”, and have now added it to my wish list of cars. 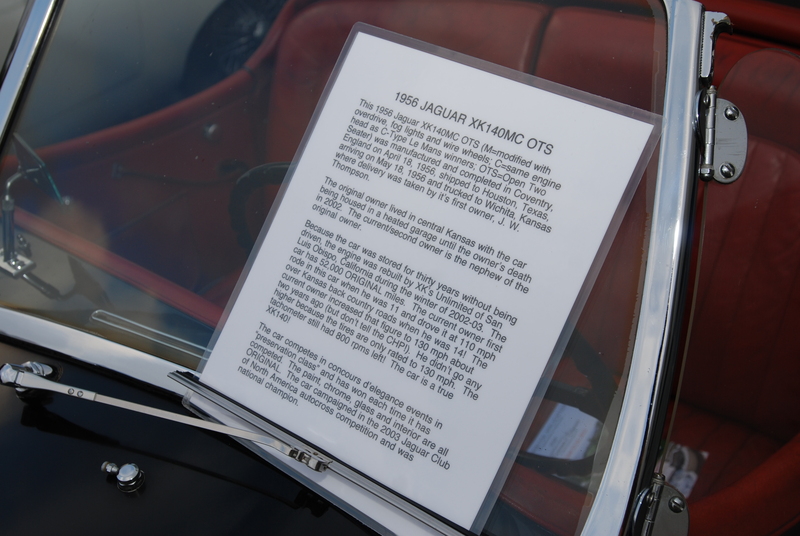 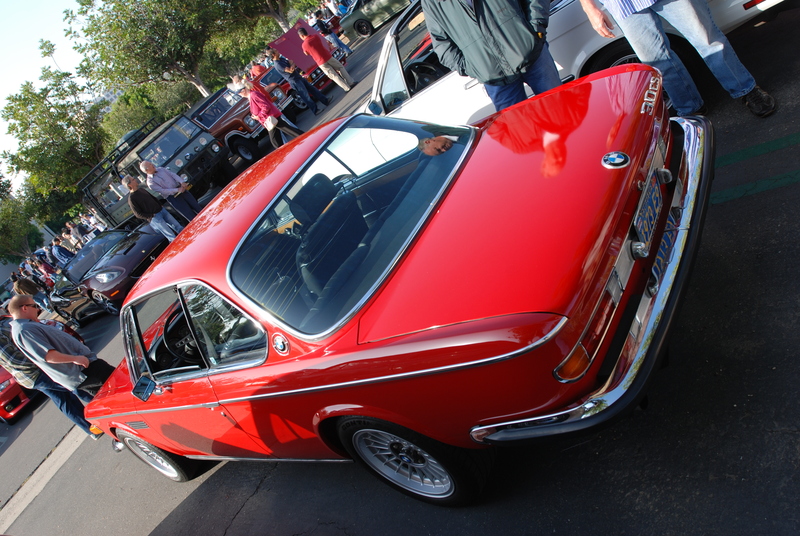 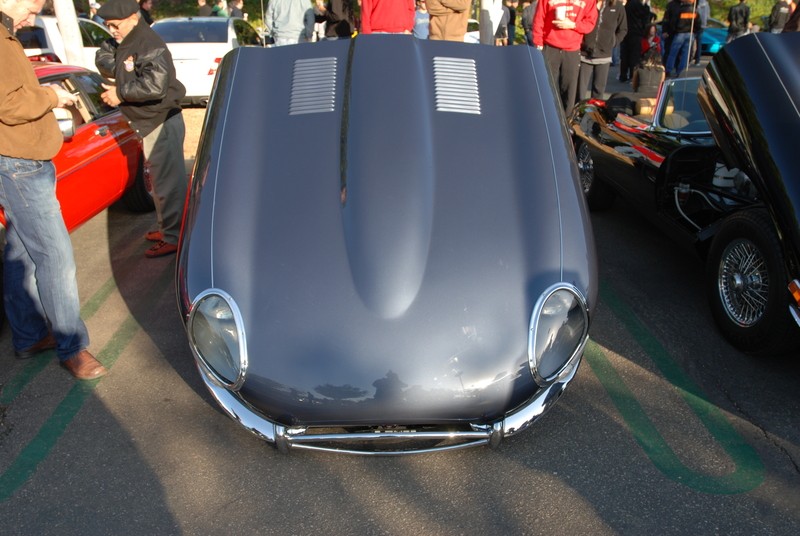 The following are a few of the photos taken of the 350 GT from its debut at Cars & Coffee back in June.